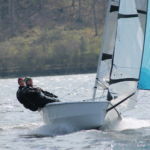 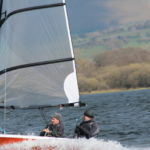 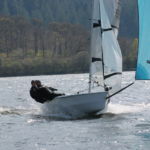 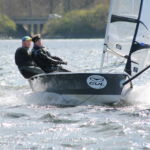 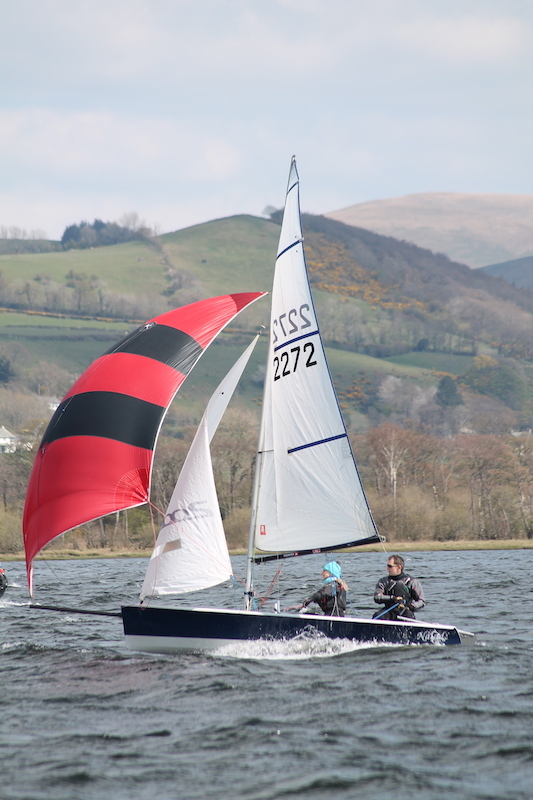 The long bank holiday break started on Friday and focussed on getting plenty of kids on the water on both Friday and Saturday, especially as there was plenty of sunshine with light winds. 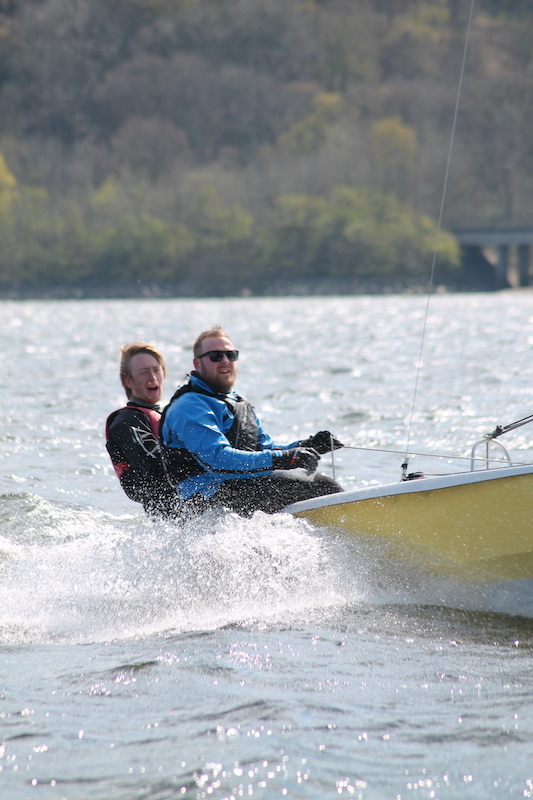 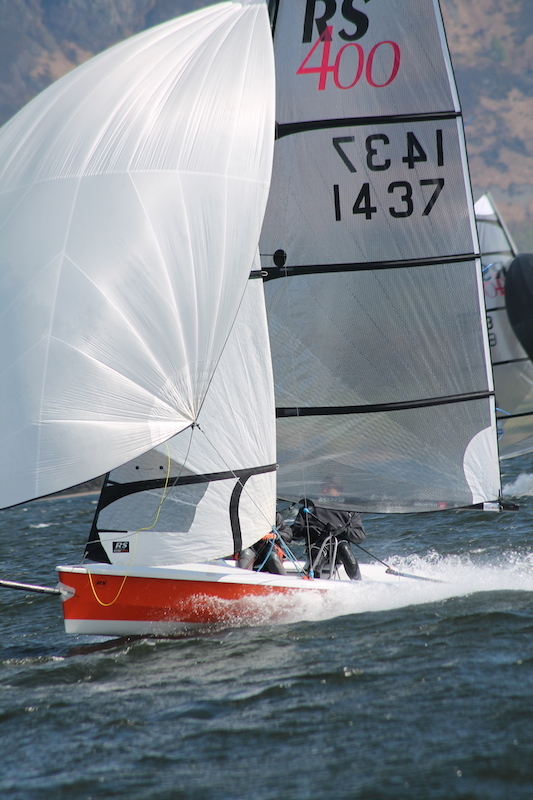 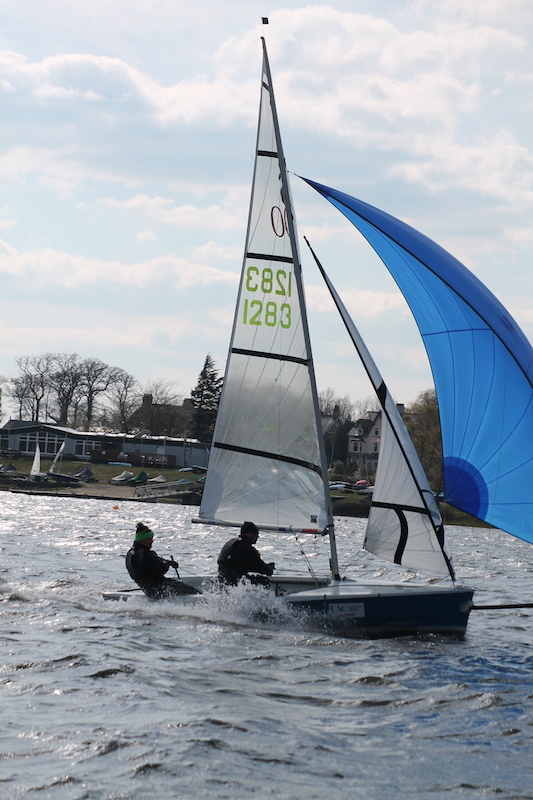 Despite mixed winds earlier in the day, the wind settled to the NW just in time for Saturday’s racing for the fleet of 26 boats. 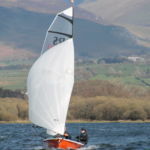 Keith Thomas seized the opportunity to sail when Sally offered her services; shame he didn’t quite get the spinnaker rigged properly before the first race! 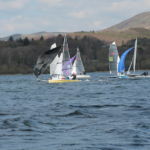 Halfway through the second race the wind started to veer to the north, and then it faded for half an hour before filling in from the west, and consequently the handicap results were put into disarray somewhat. 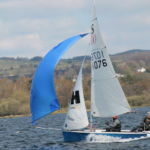 Mike/Kayla won both races from Ian/Lezliann in the F15s, while in the GPs Dave/Lynn had two 1sts from Joan/Jack and AJ/Sue who each had a 2nd and a 3rd. 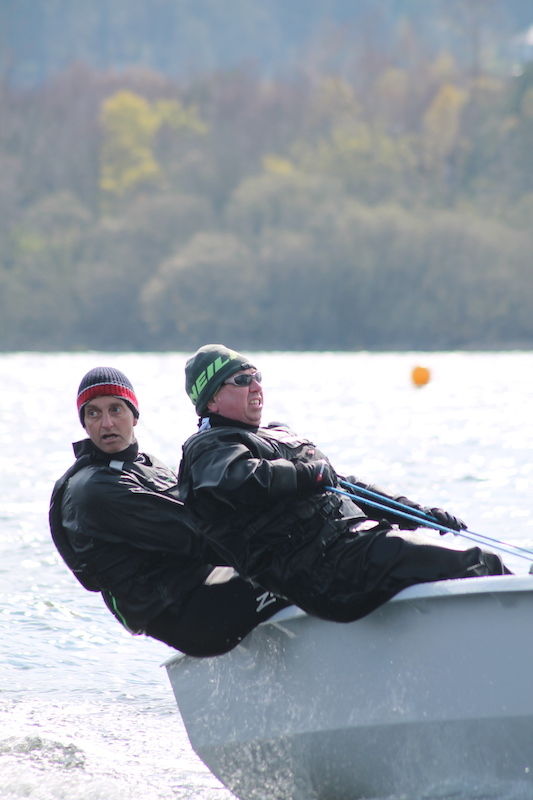 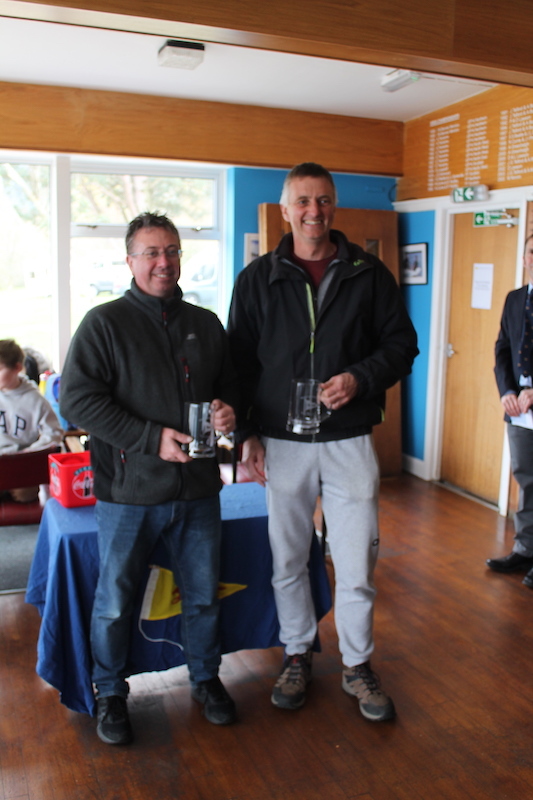 Bean/Oliver won the first slow handicap race with Paul Allen 2nd. 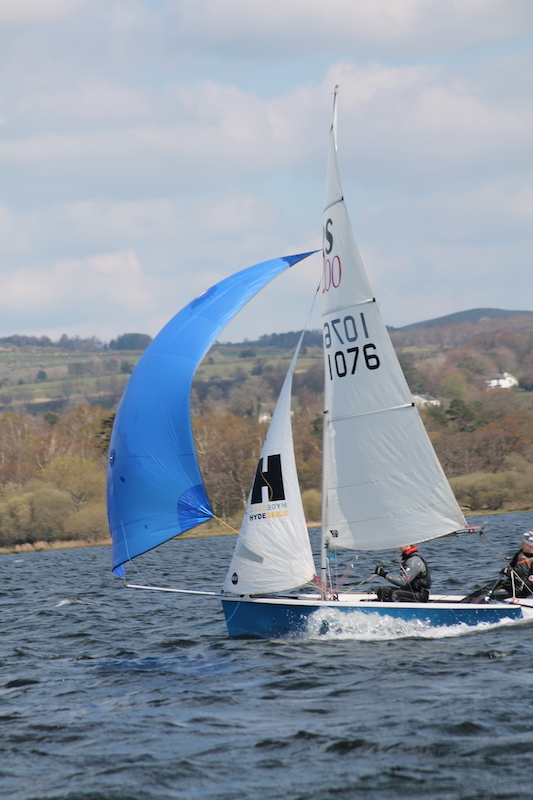 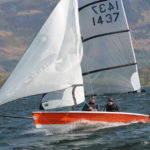 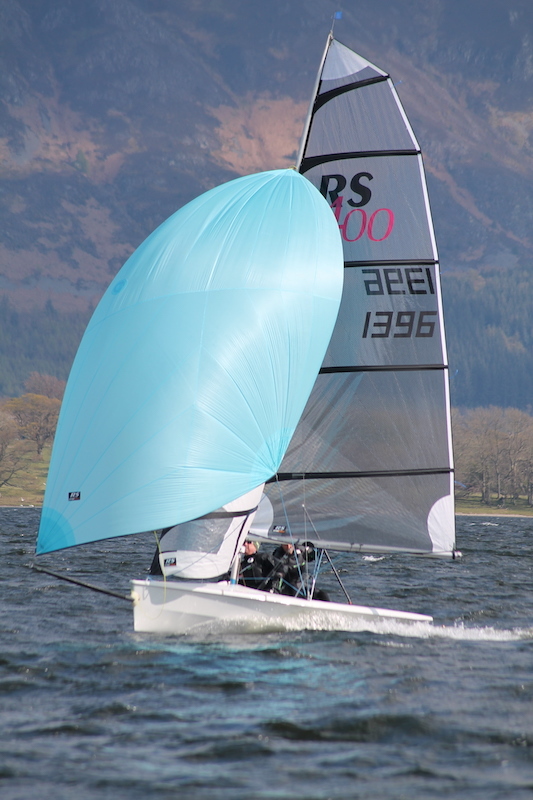 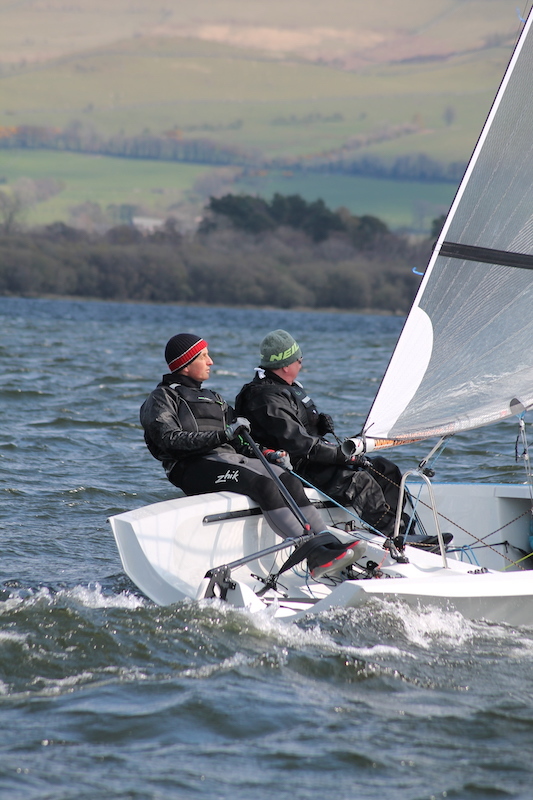 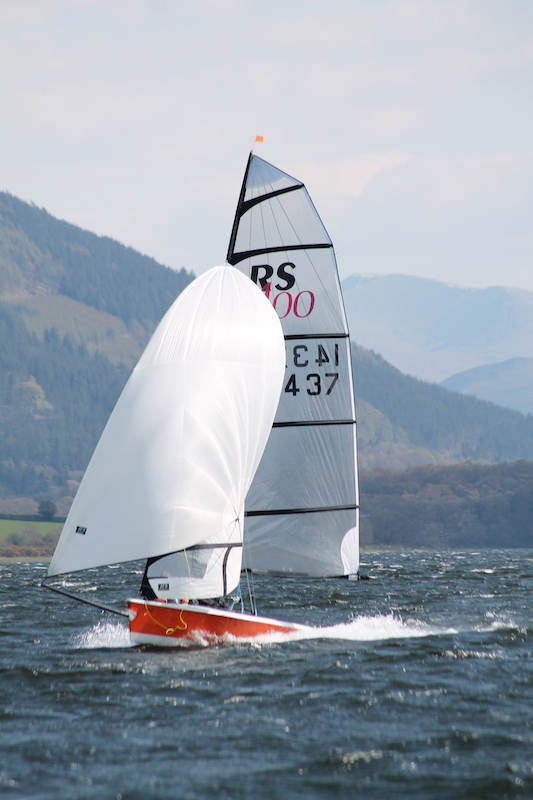 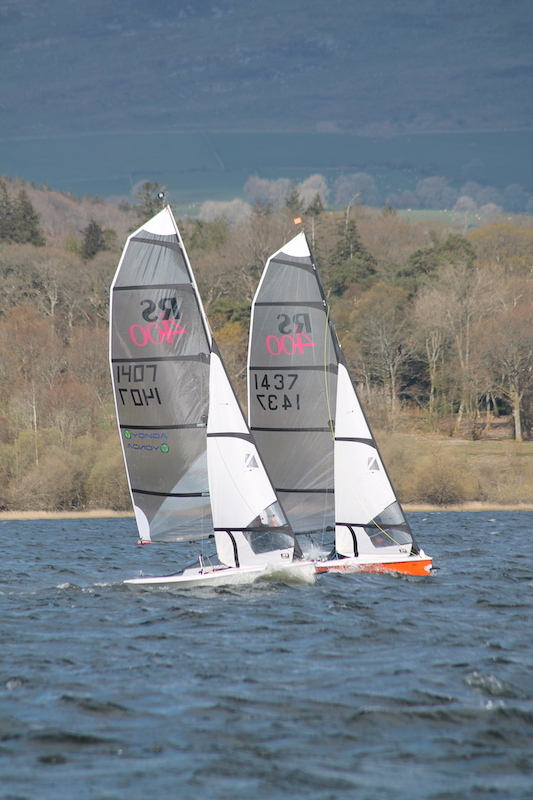 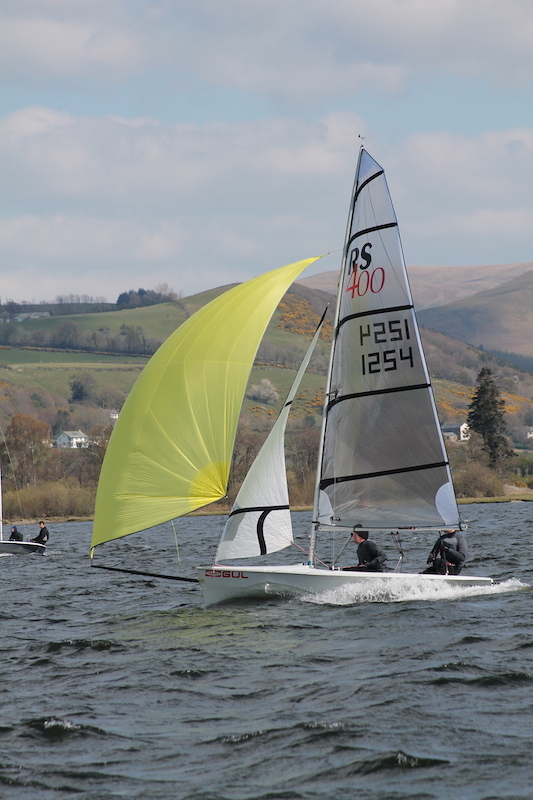 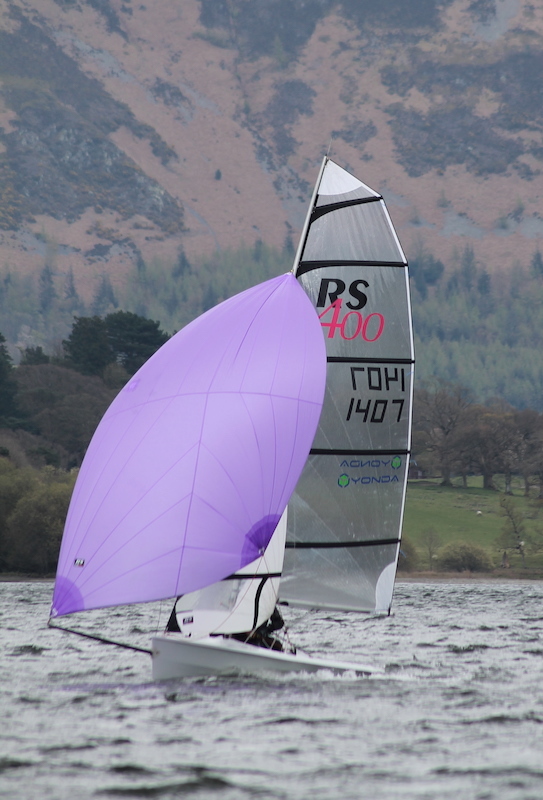 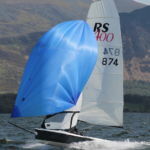 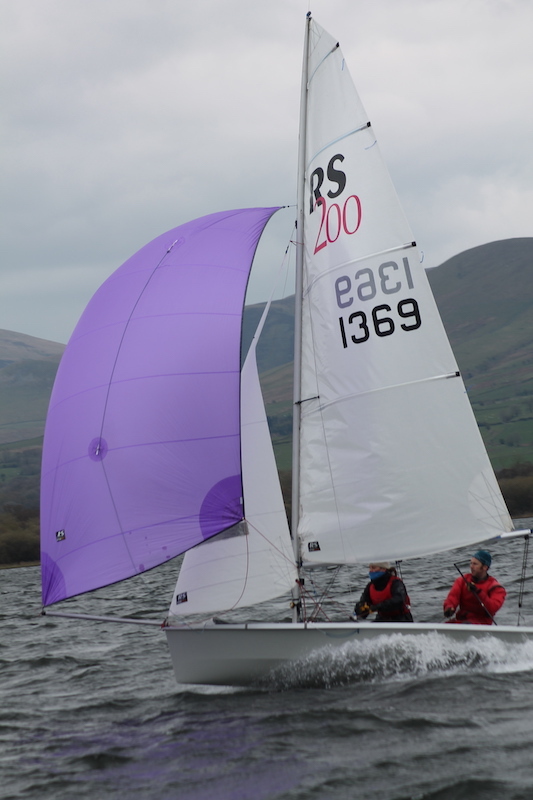 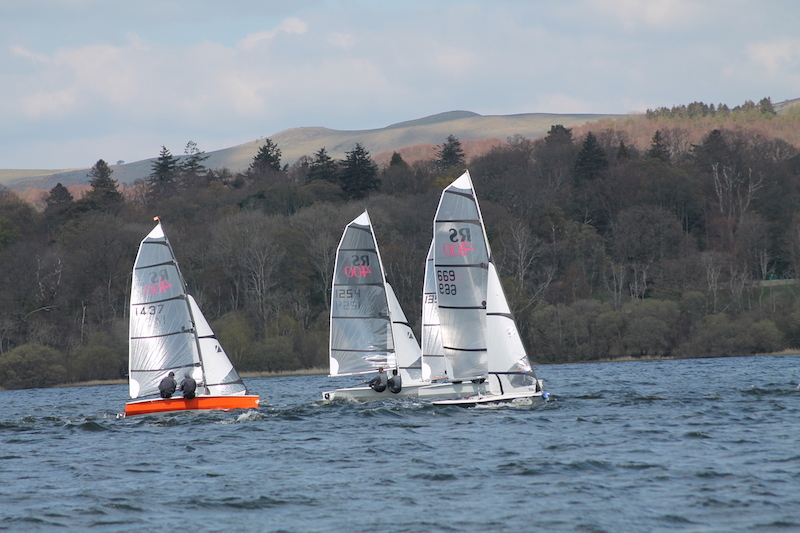 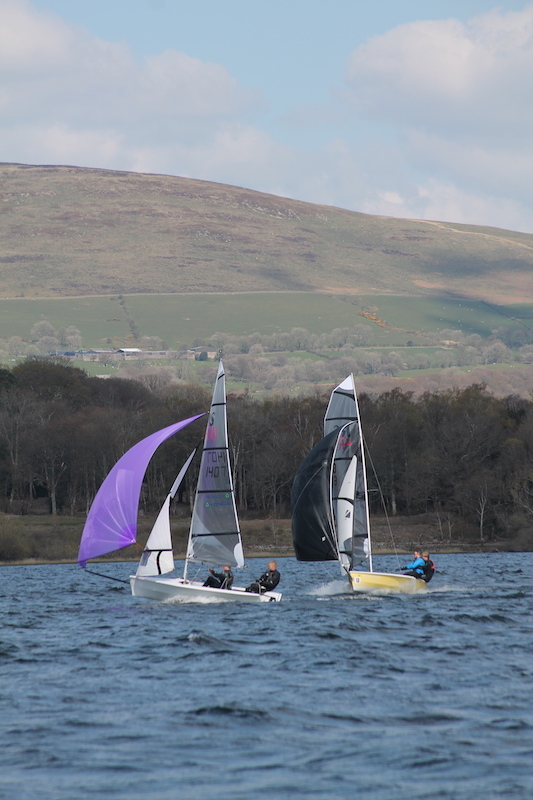 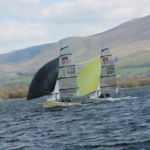 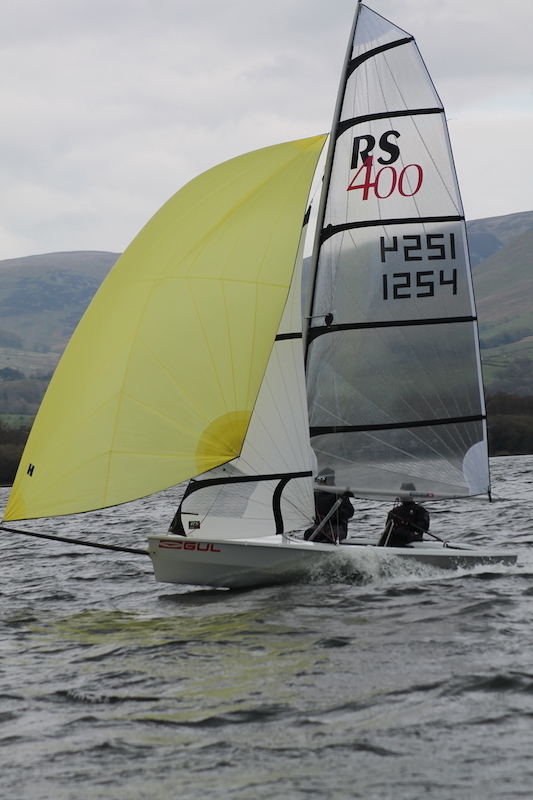 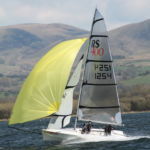 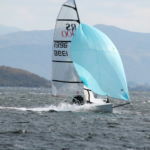 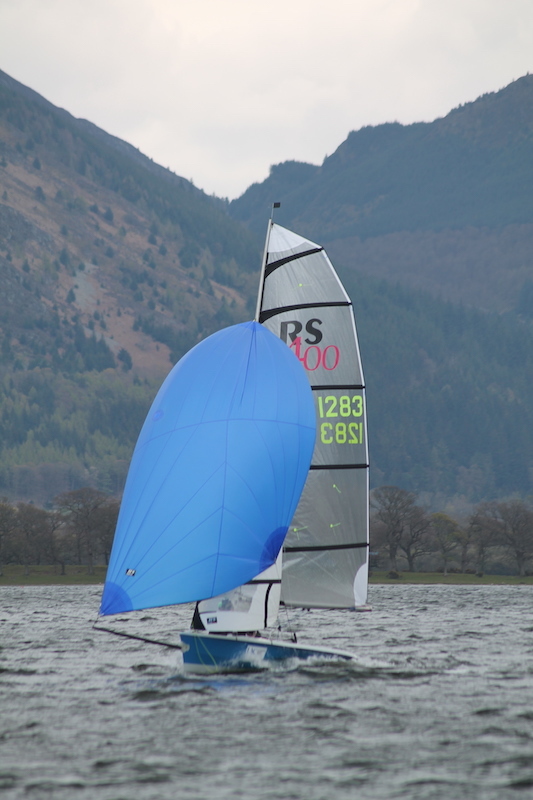 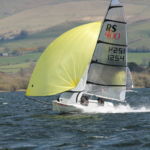 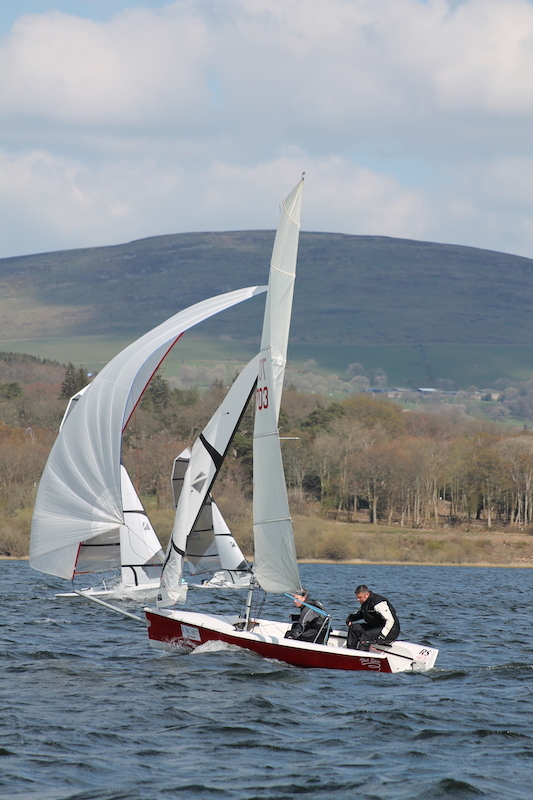 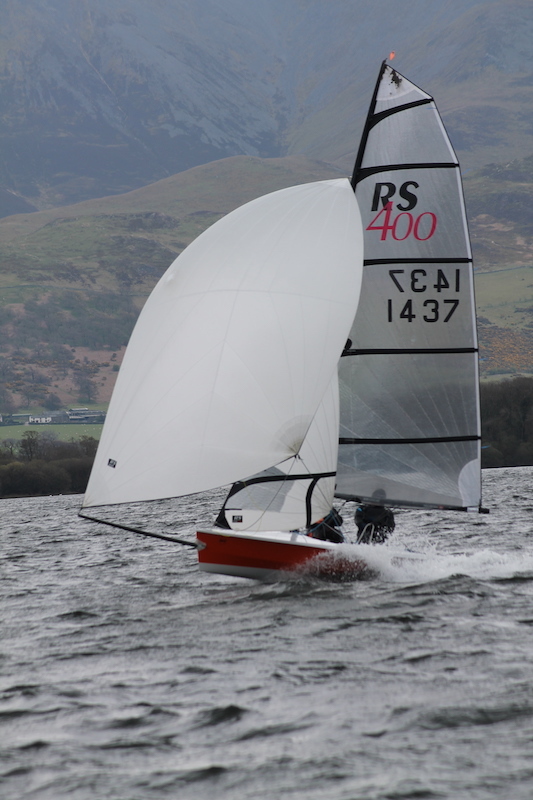 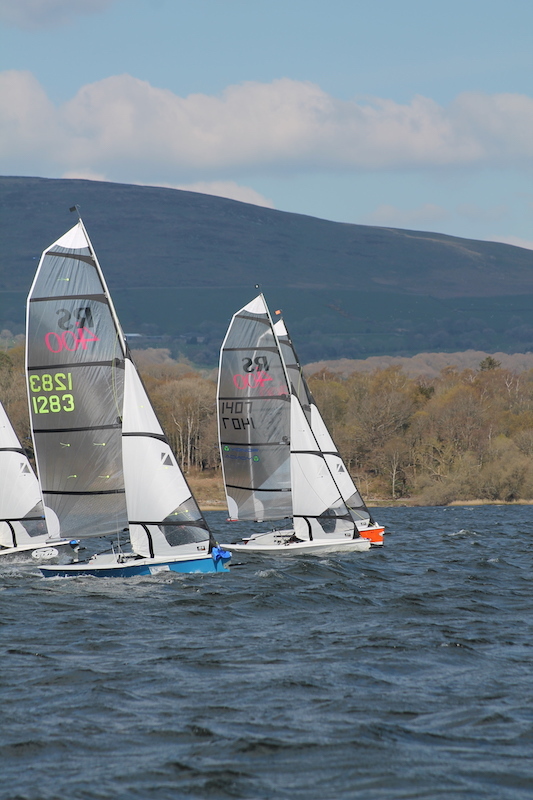 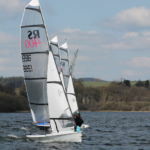 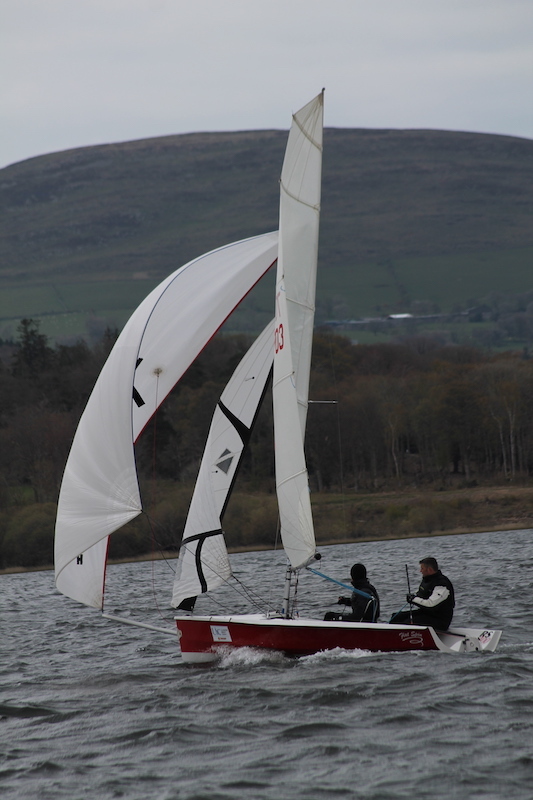 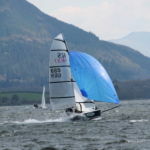 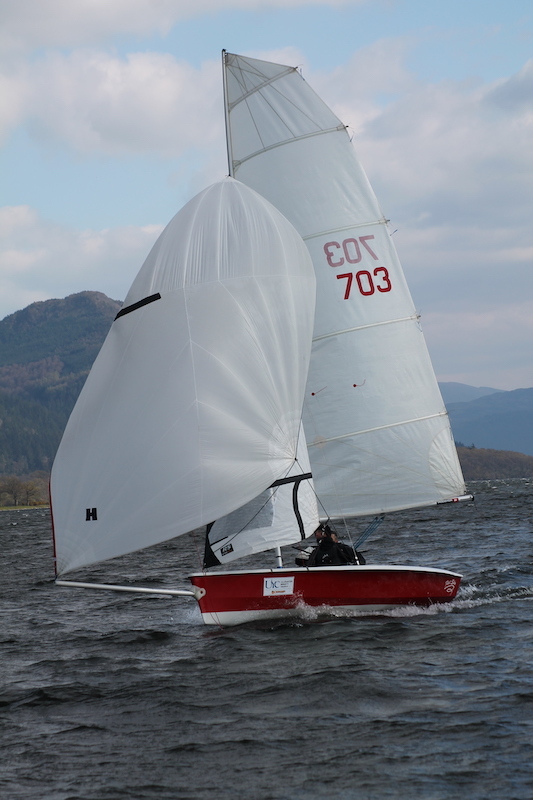 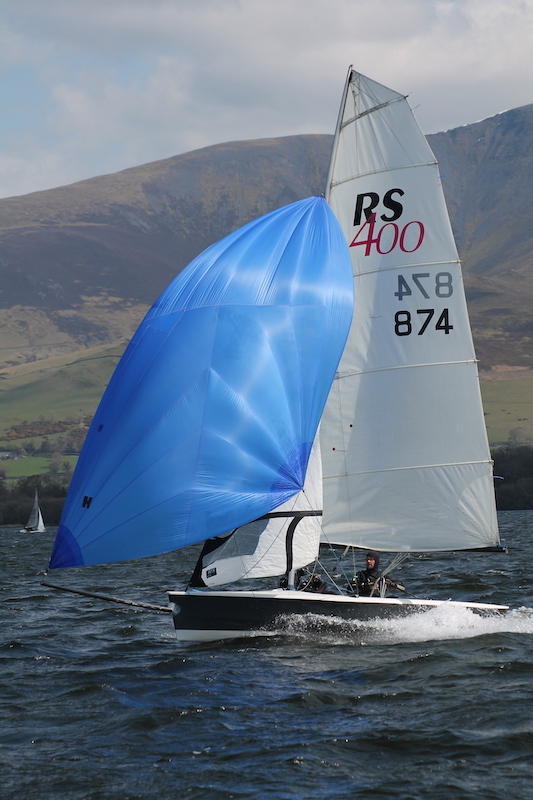 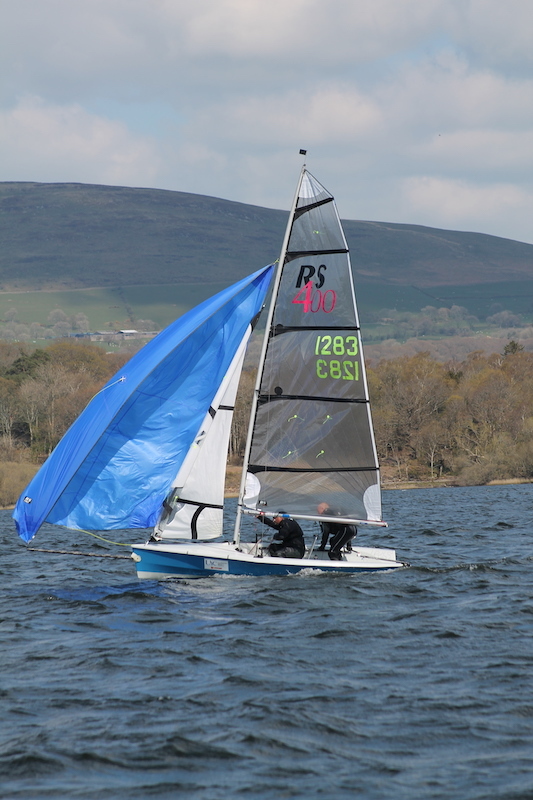 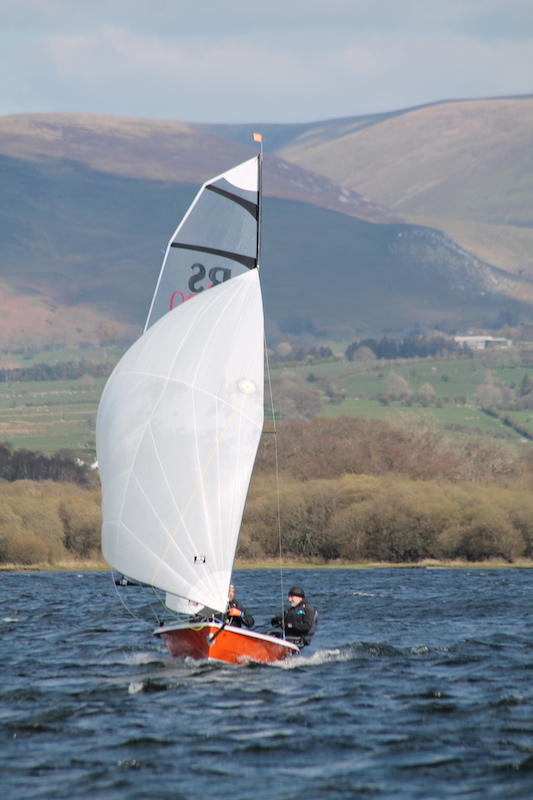 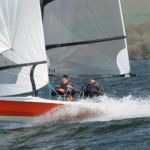 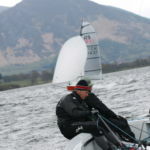 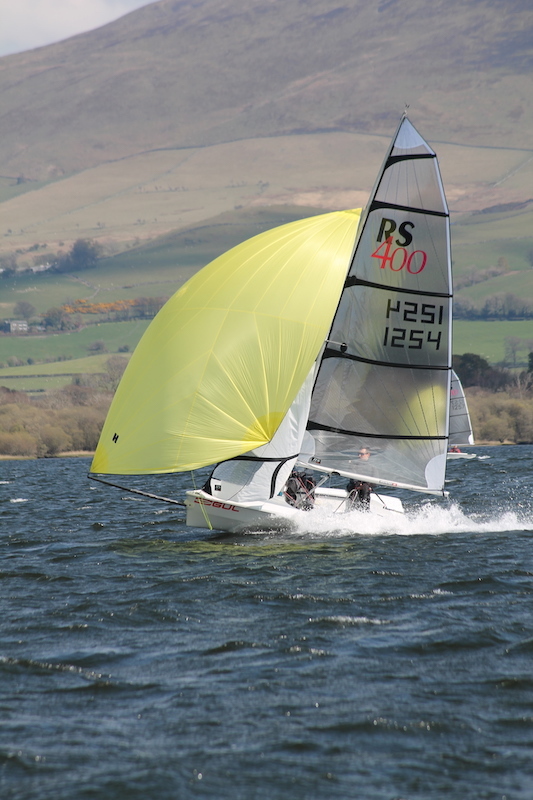 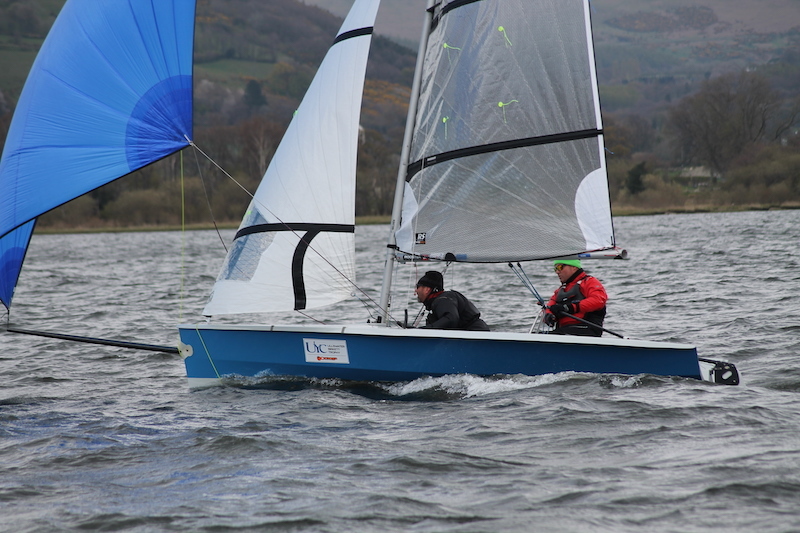 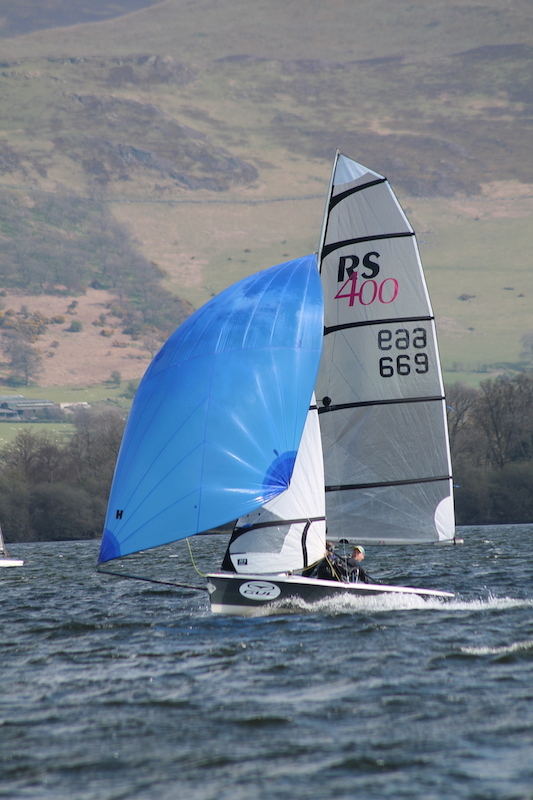 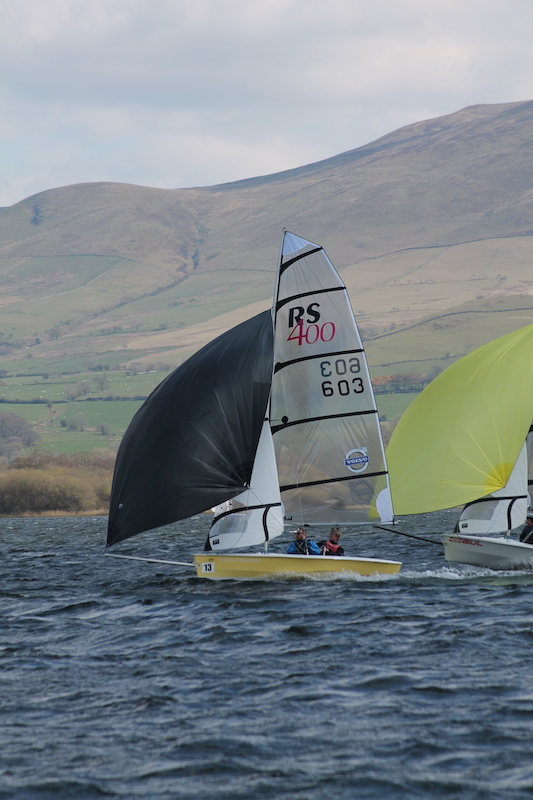 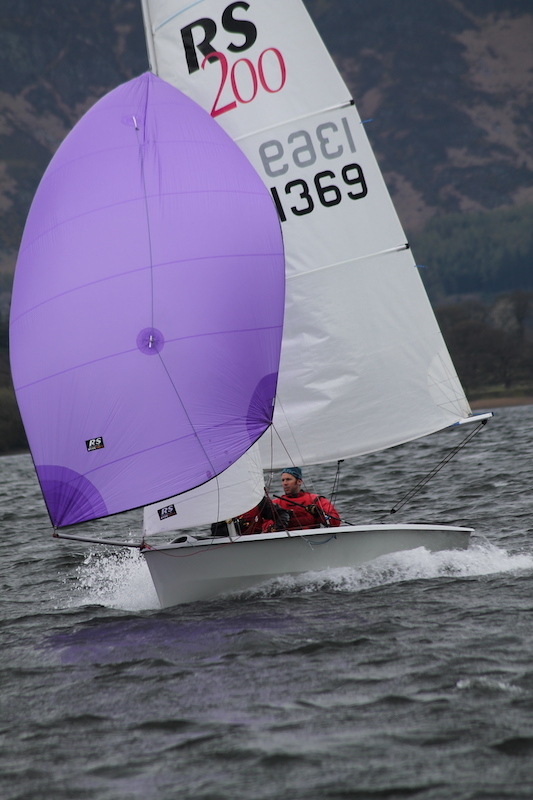 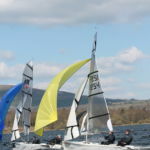 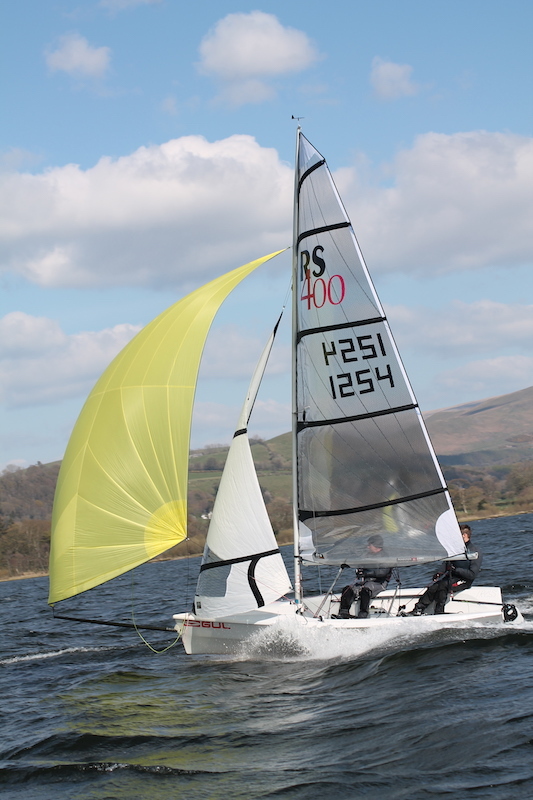 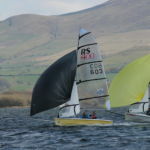 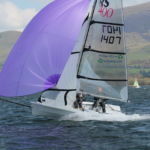 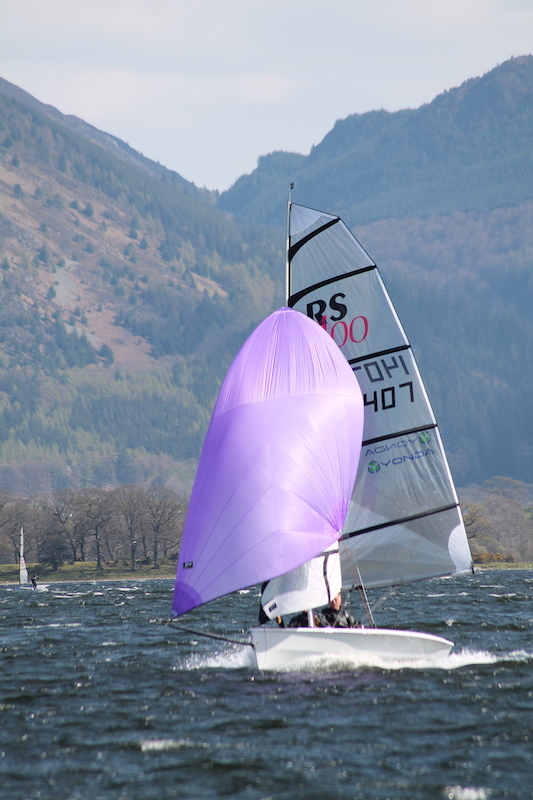 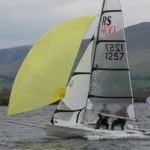 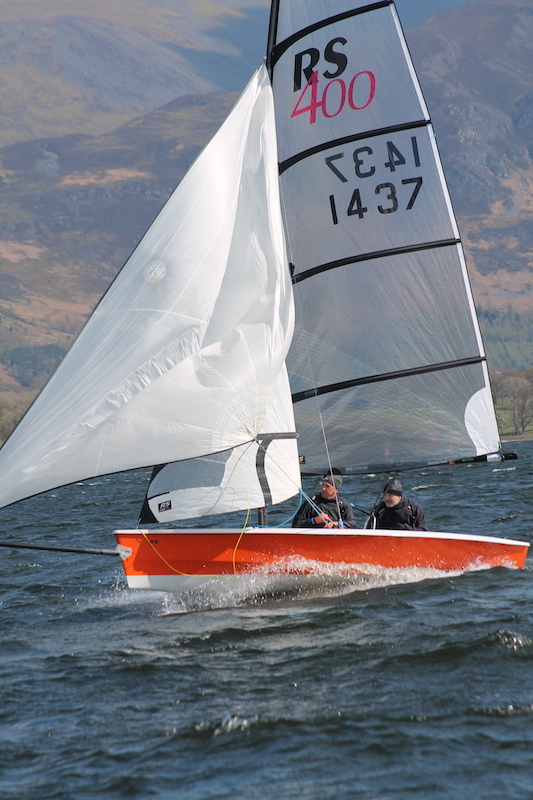 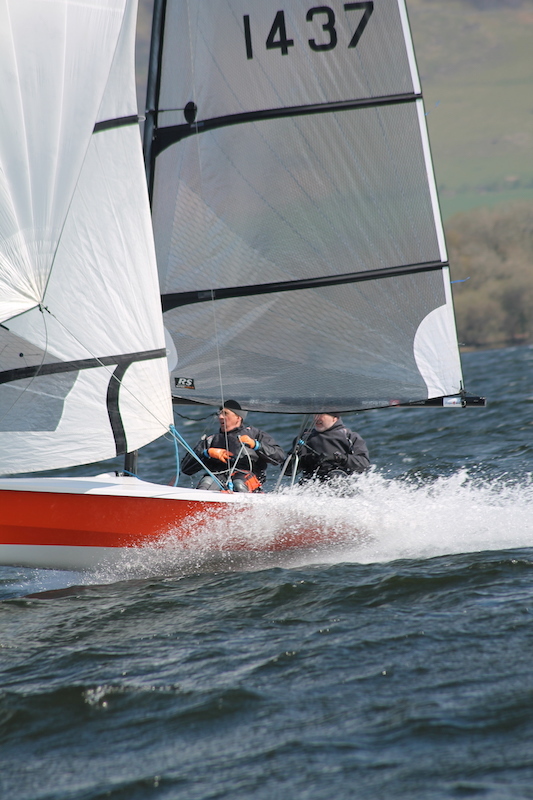 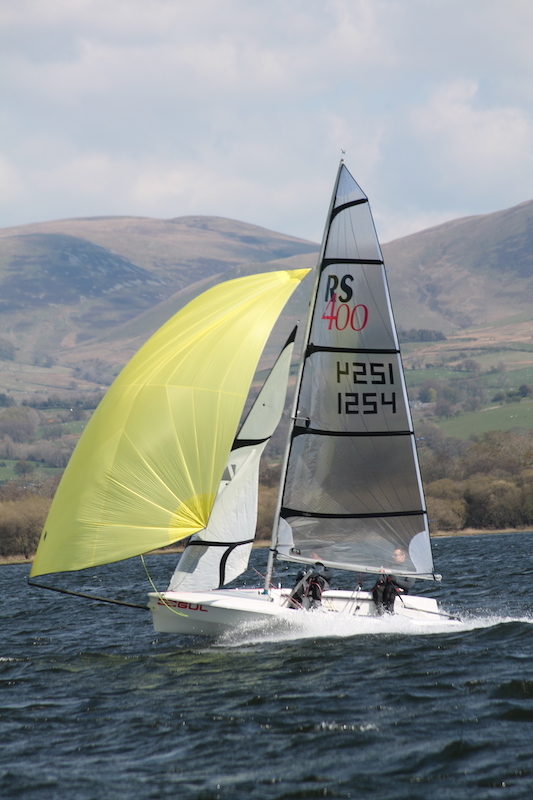 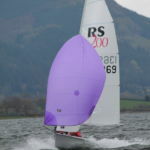 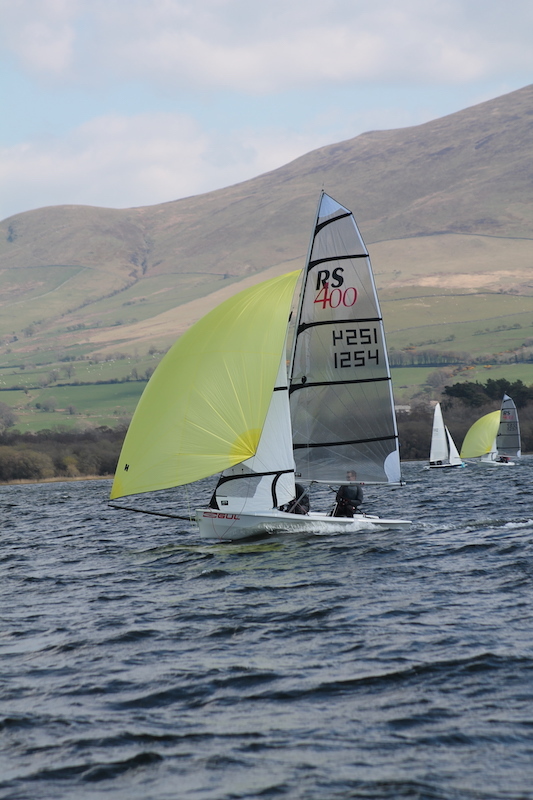 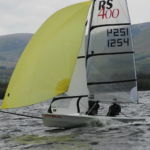 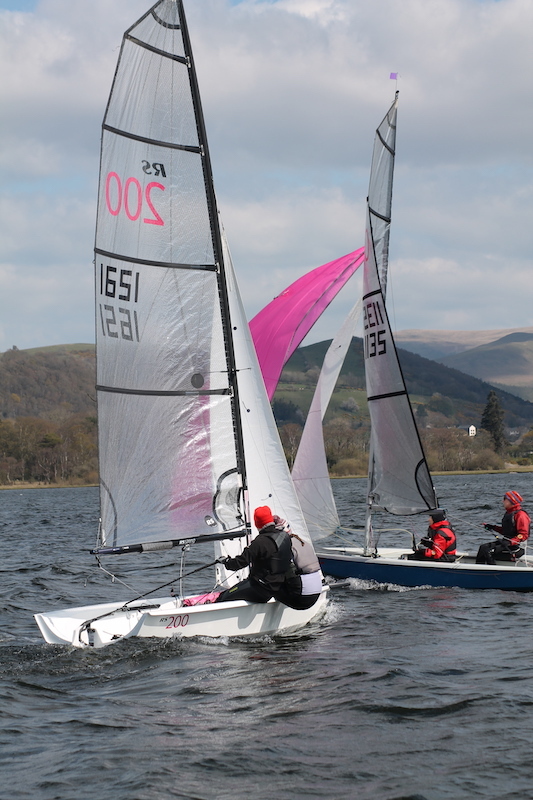 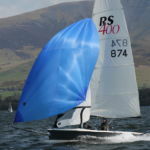 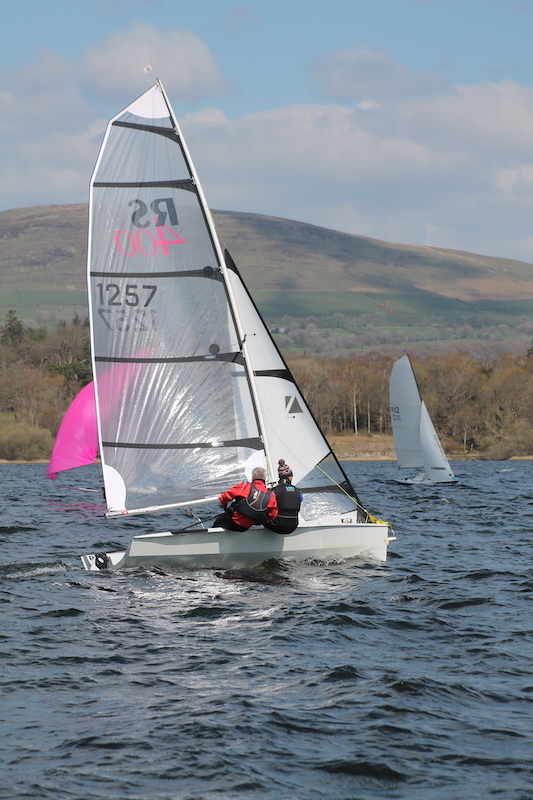 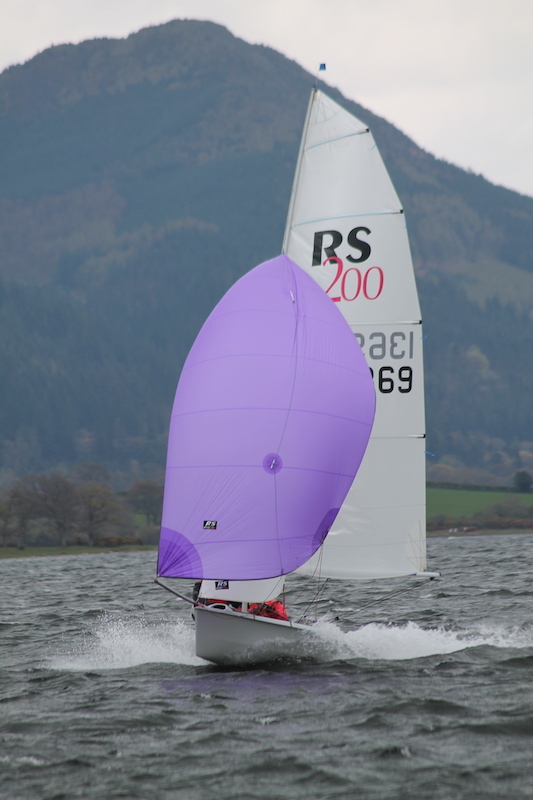 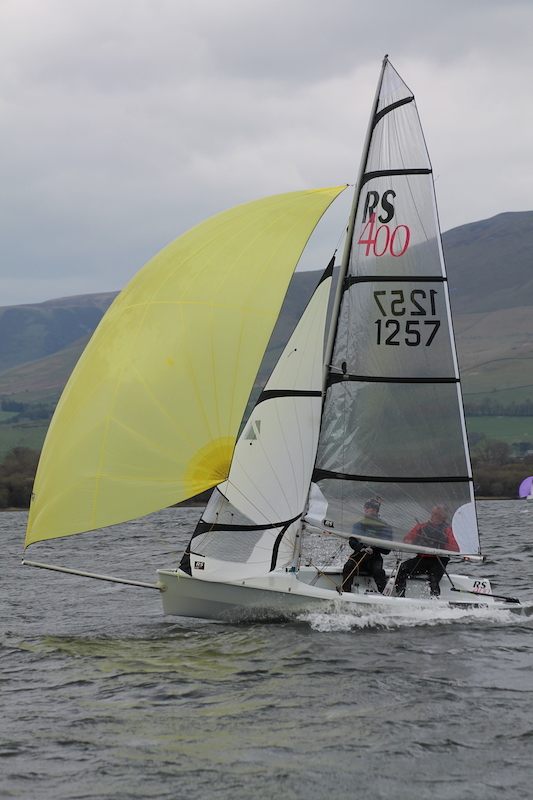 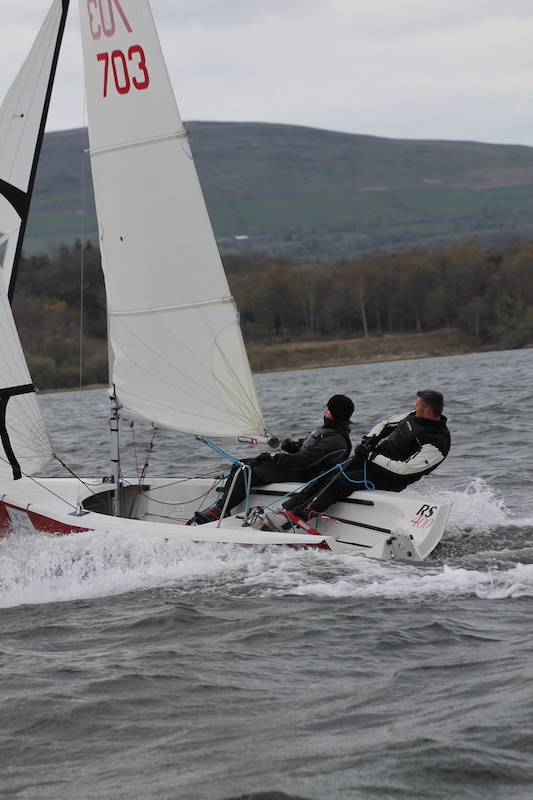 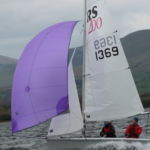 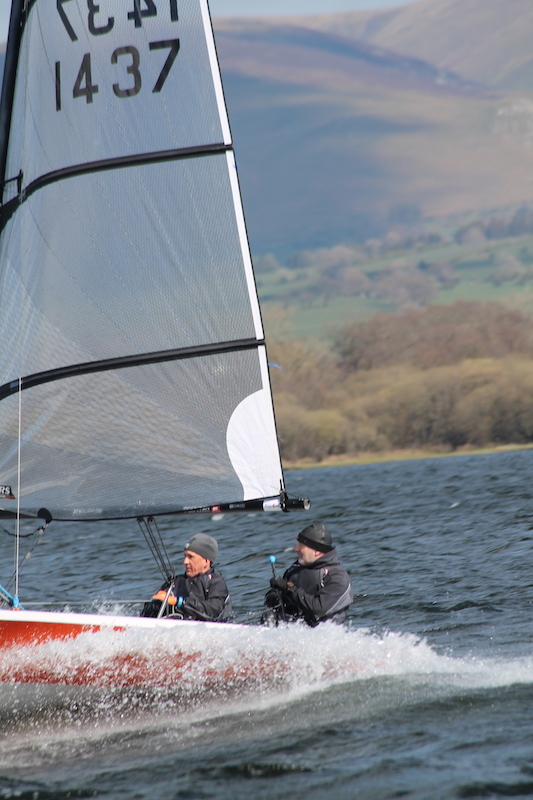 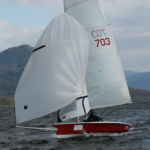 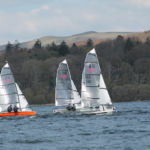 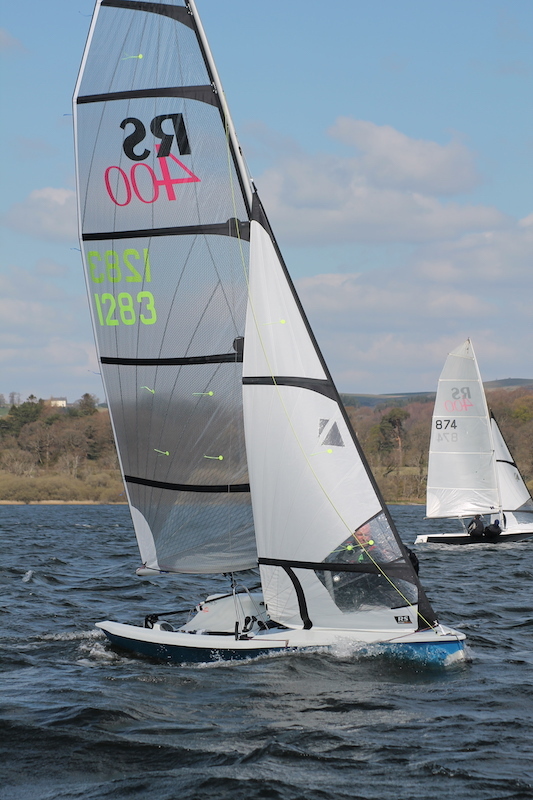 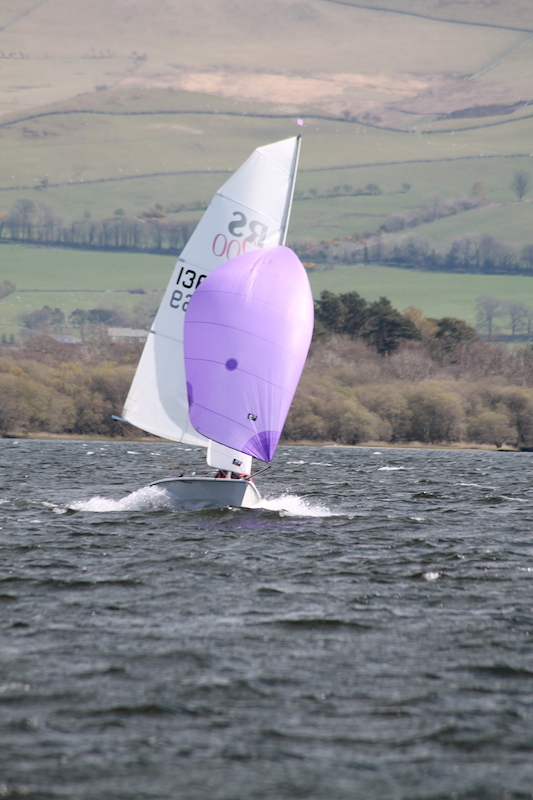 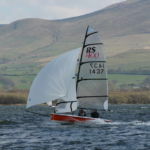 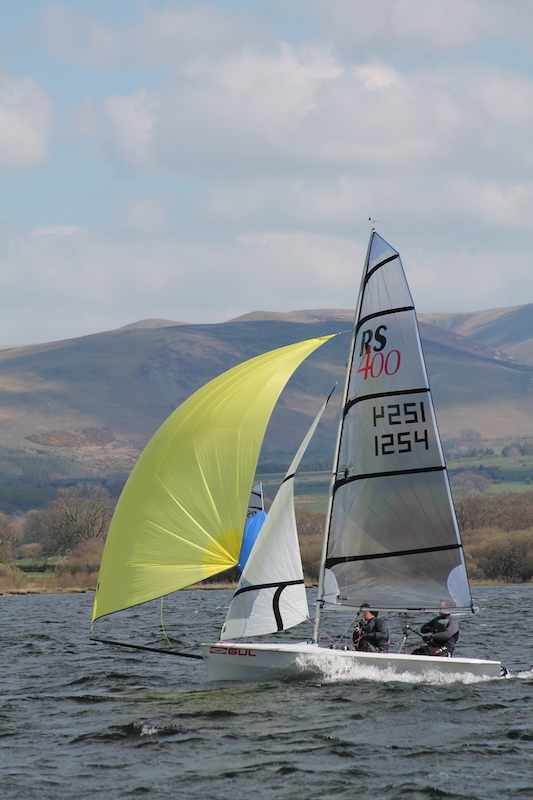 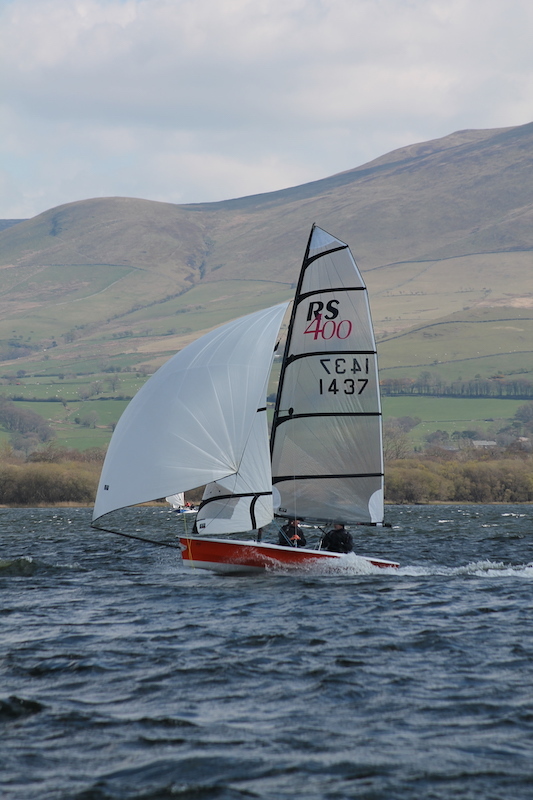 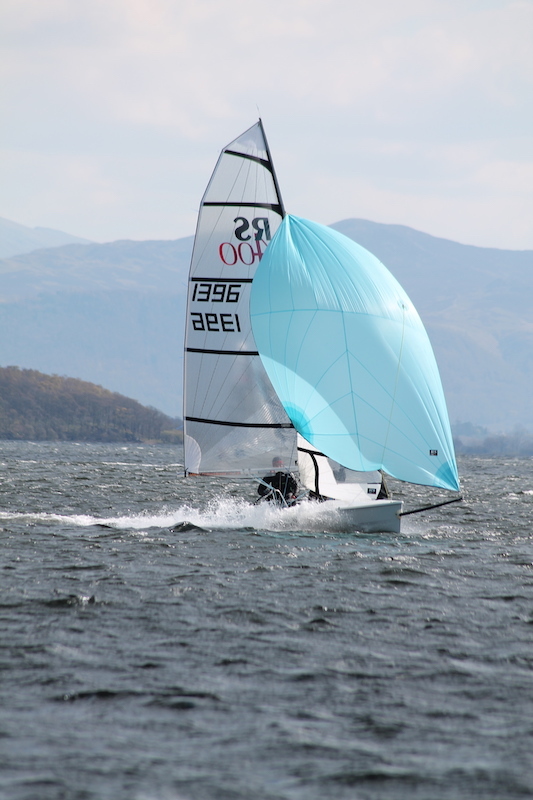 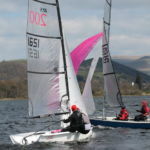 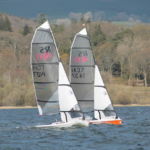 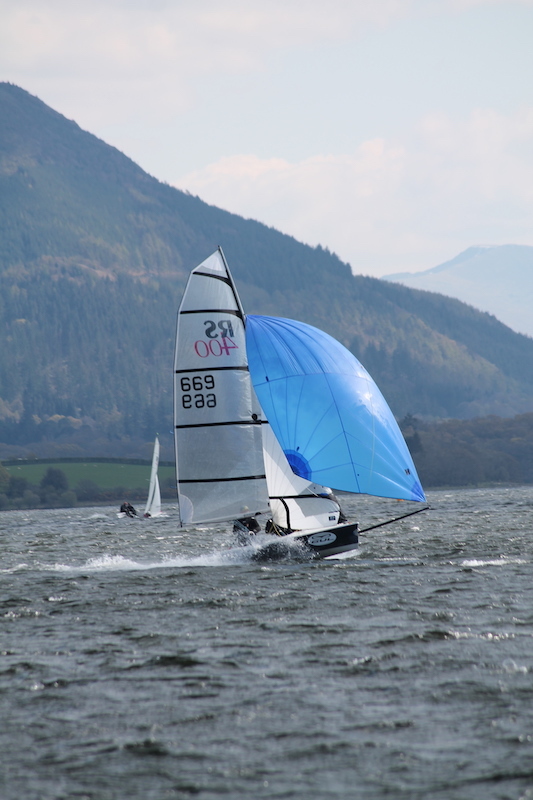 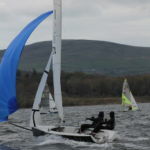 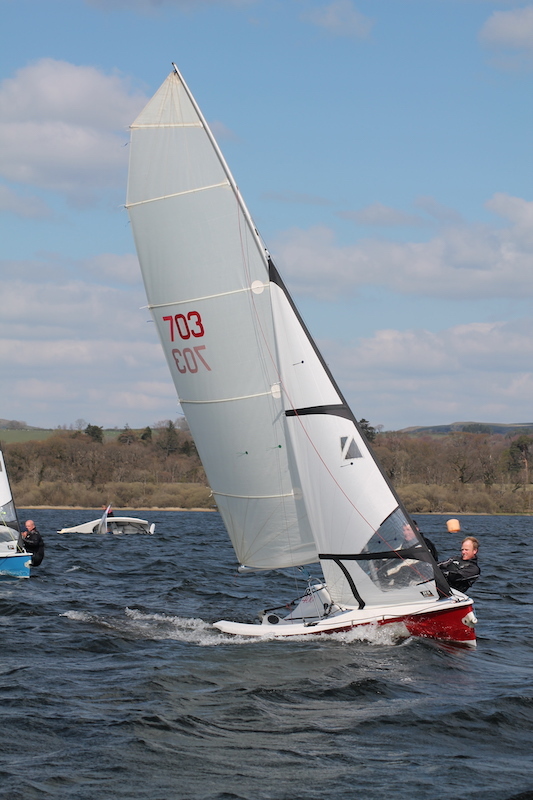 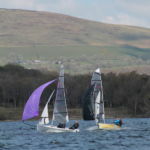 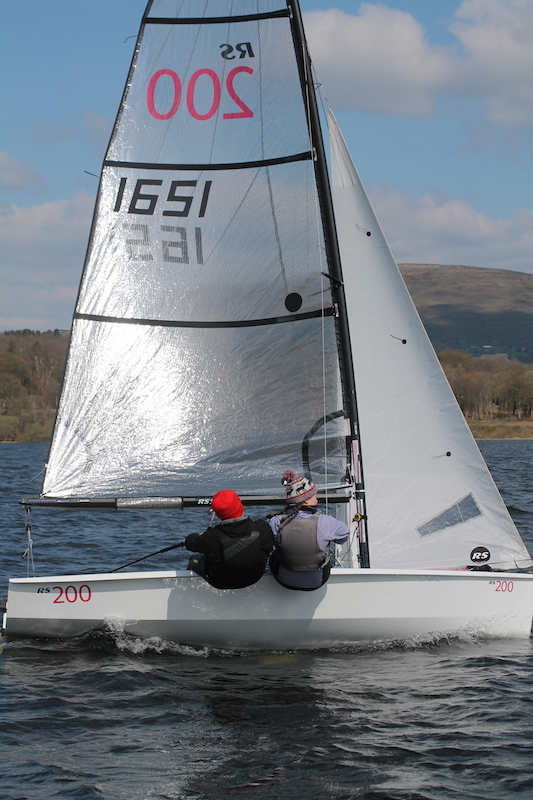 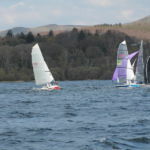 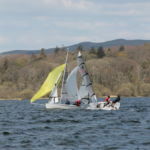 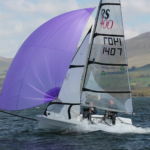 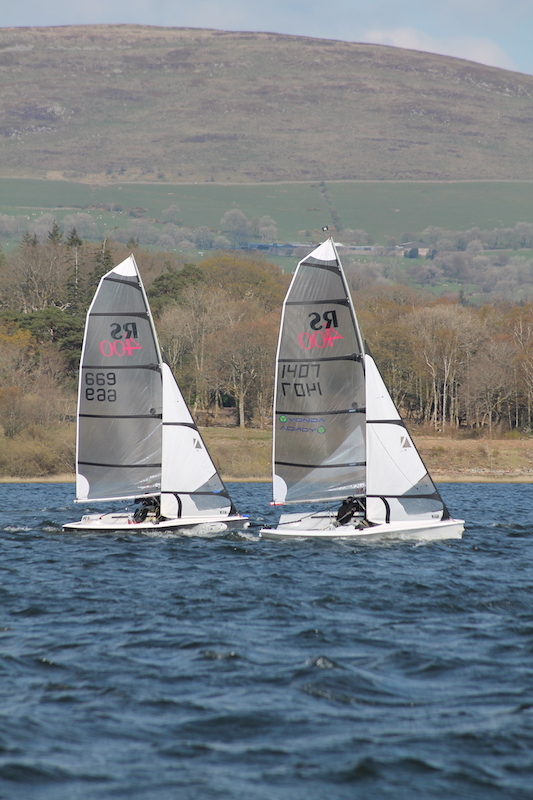 In the handicap fleet, the Solos of John Reekie and Stan Barton led the first race, while Alex/Caroline in a RS400 won with Mik in a Mirror 2nd. 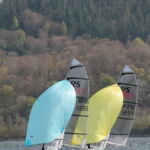 In the evening there was an outdoor bring and eat in the back field followed by a game of rounders! 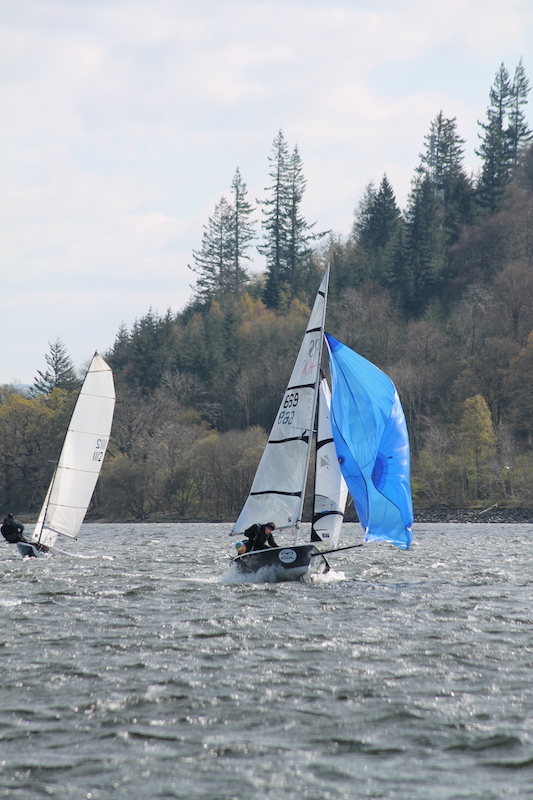 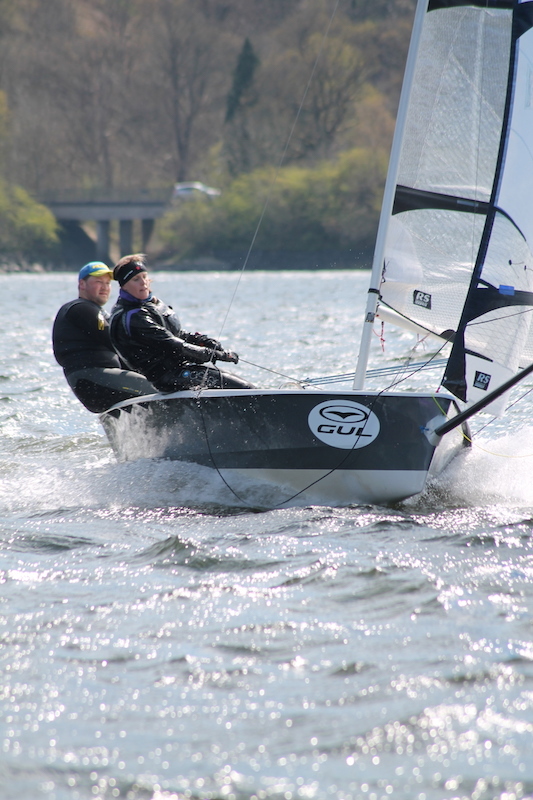 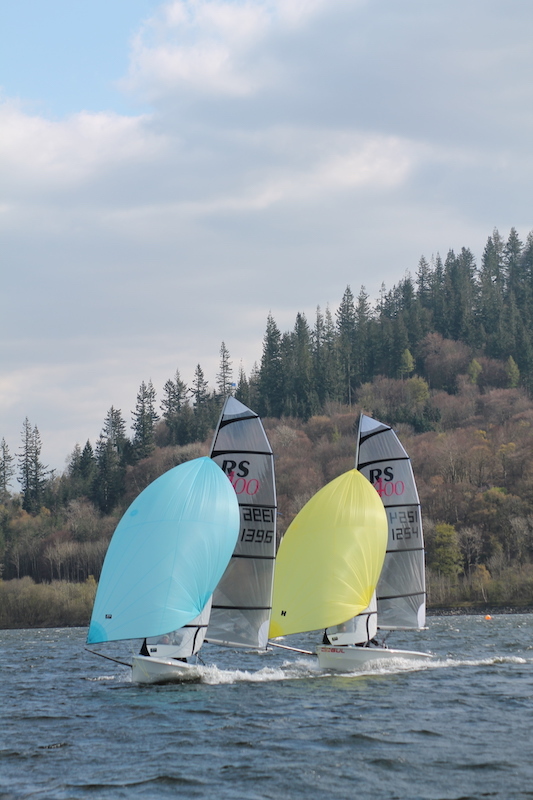 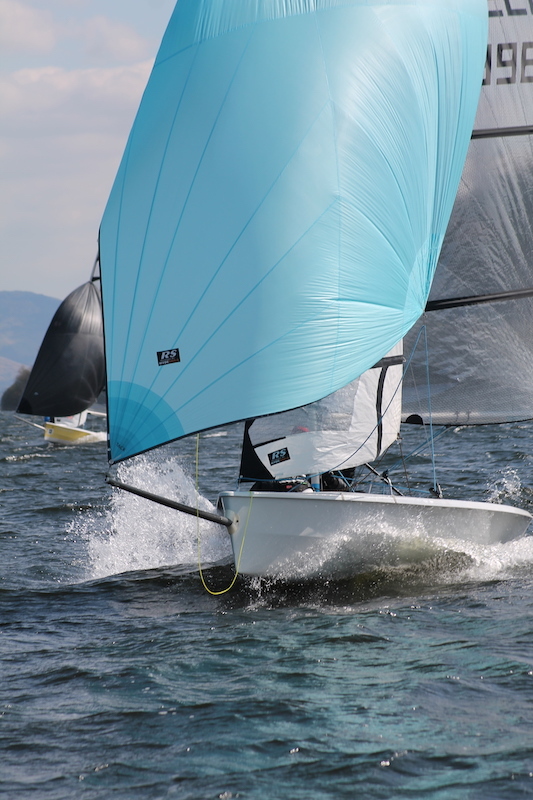 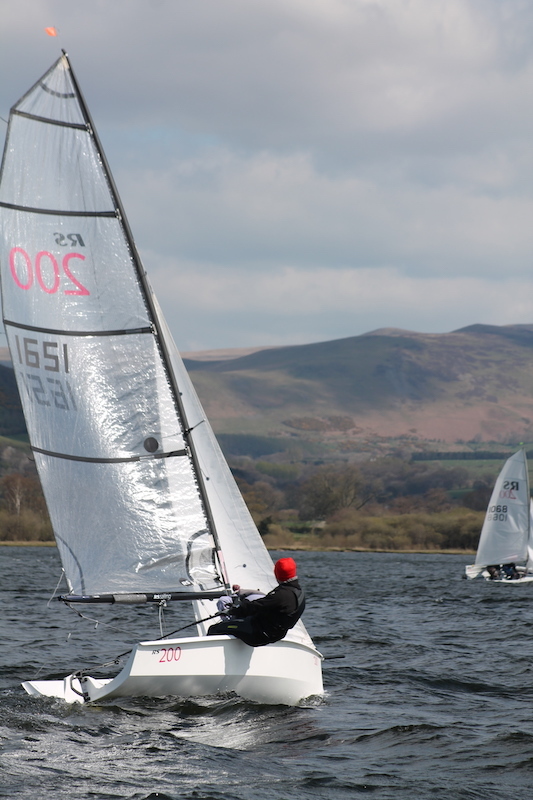 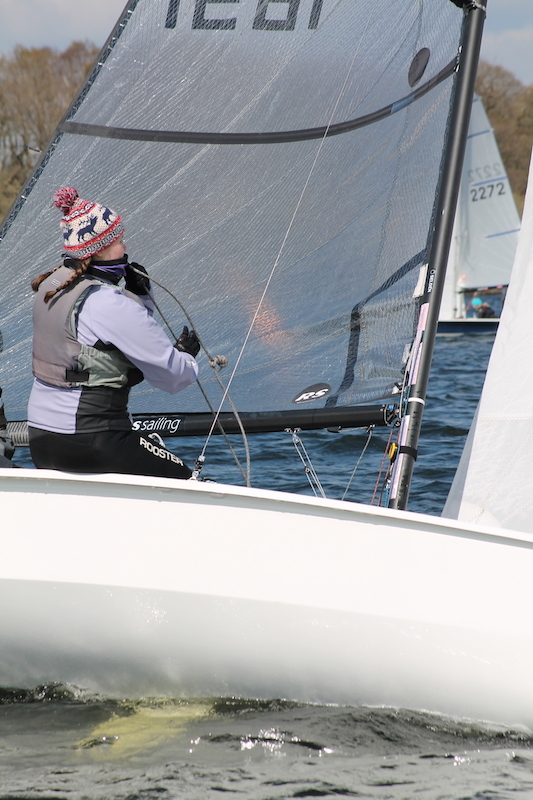 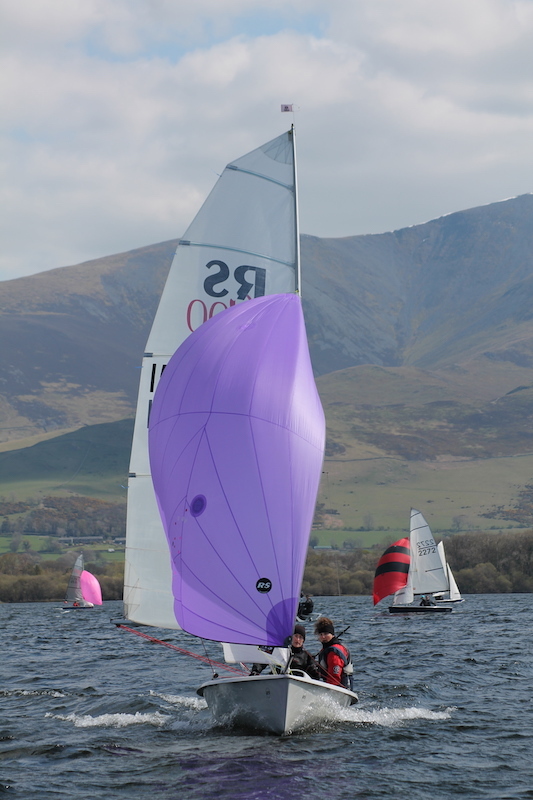 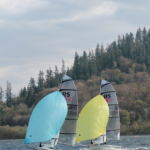 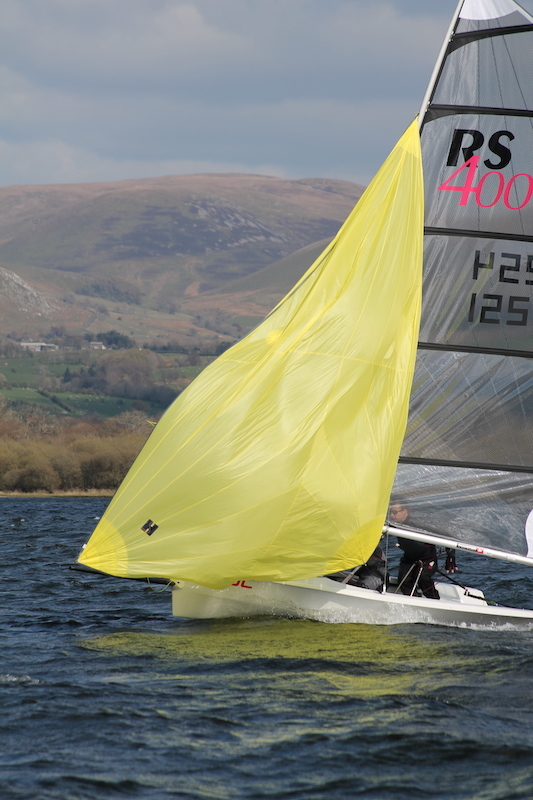 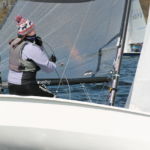 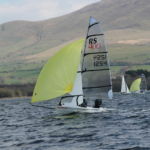 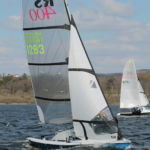 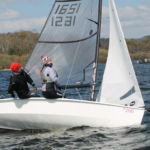 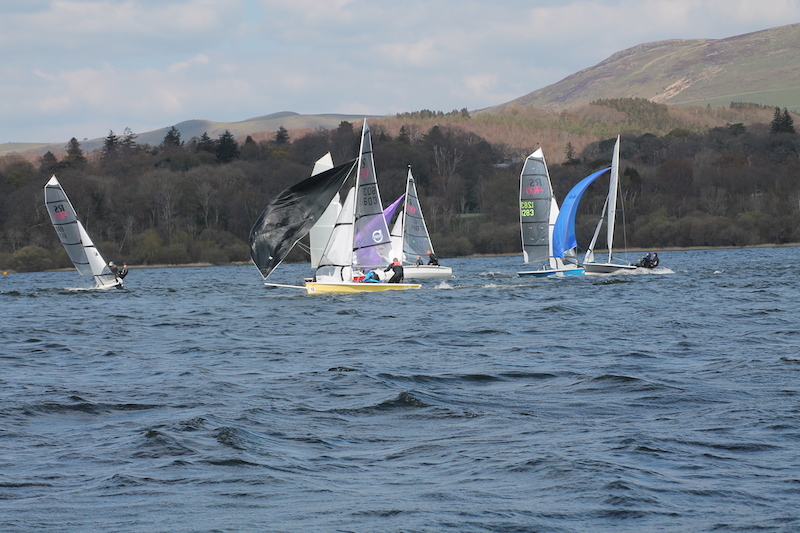 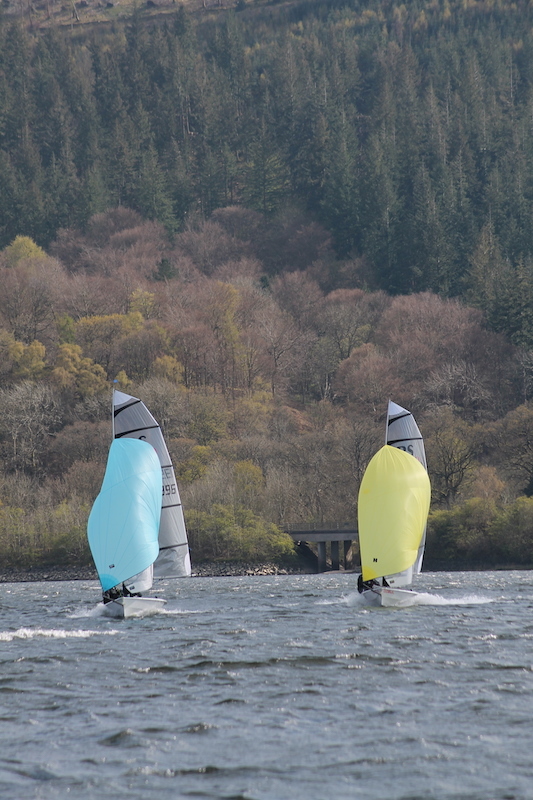 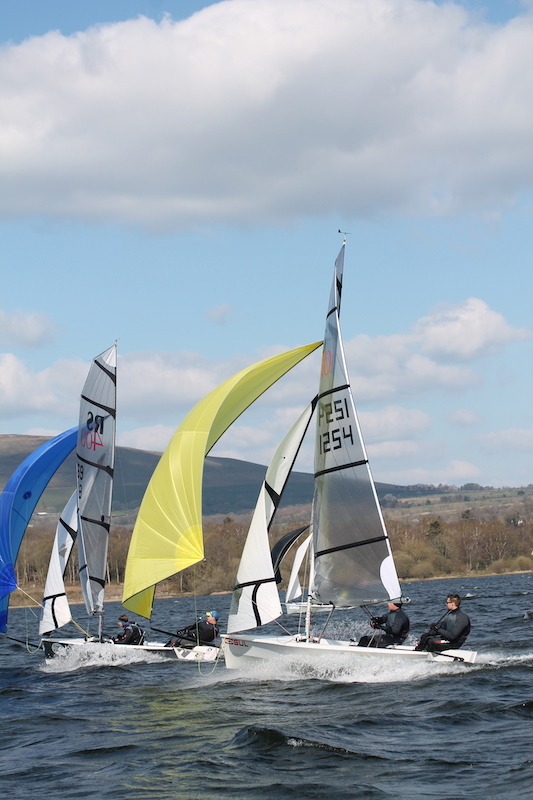 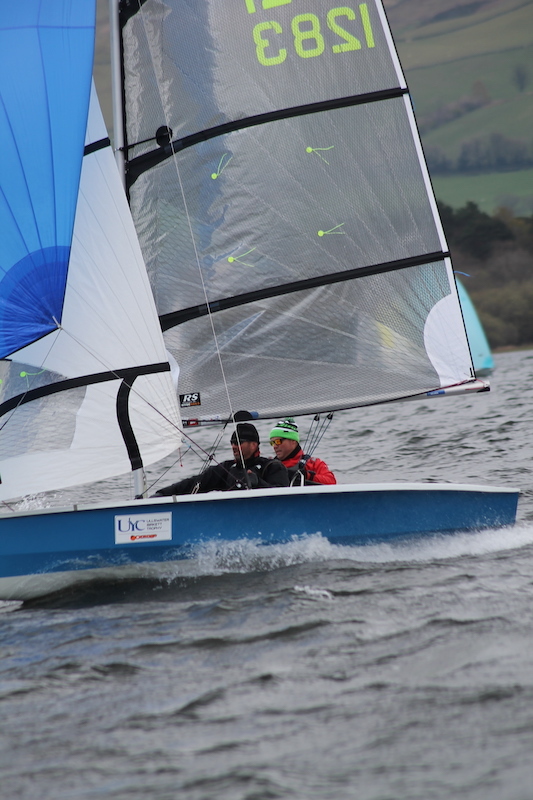 Easter Sunday started with and Easter egg hunt for the kids, and the weather delivered more sunshine and stronger winds from the west for the start of the weekend series of which three races would be sailed. 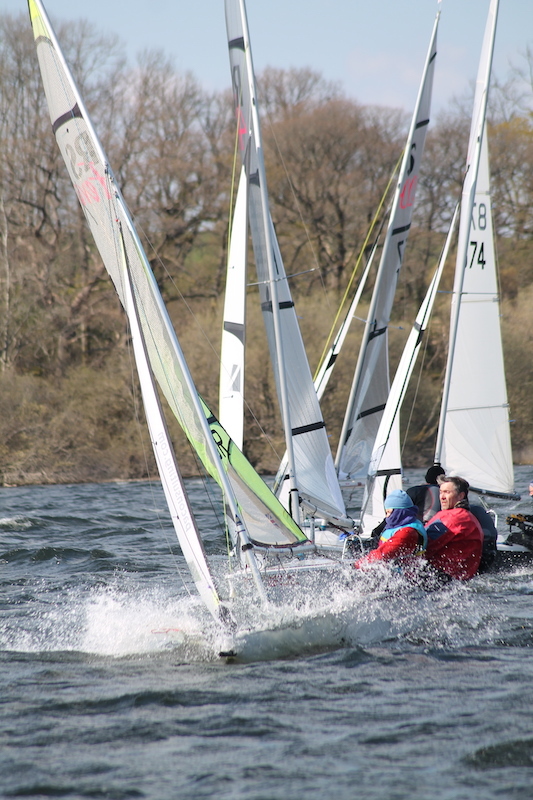 Shortly after the start of the morning race the wind veered a little towards the north, causing the beat to be very one sided, and one of the tight reaches into a fetch which made it very difficult to pass other boats. 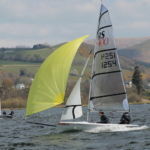 In the strong fleet of seven F15s Simon/Jon took the lead and held on to it ahead of Scumper/Zefer. 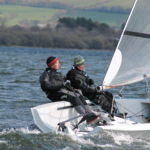 Dave/Lynn took another win with Joan/Jack 2nd. 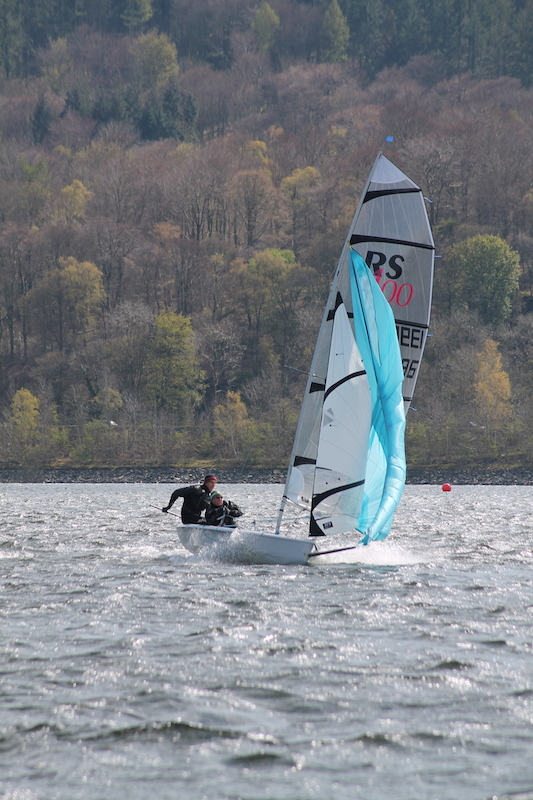 Rich Critchley won the Handicap race in a Solo, with Steve/Ruth 2nd. 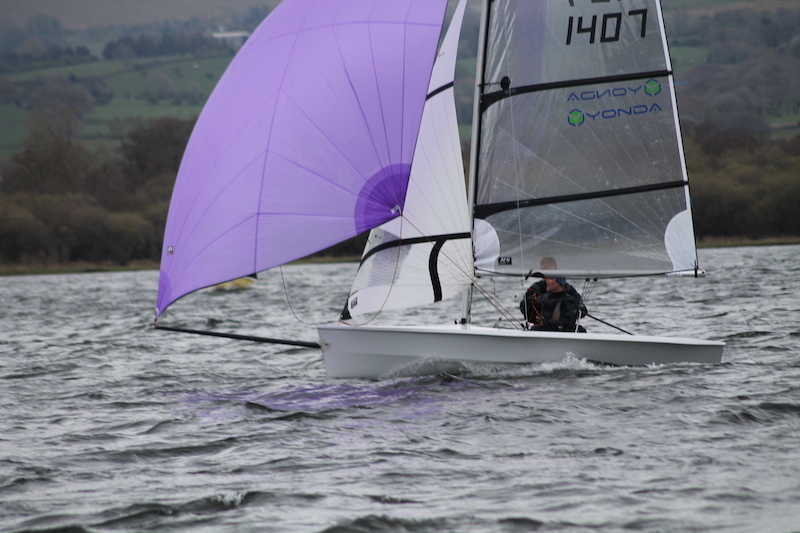 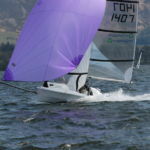 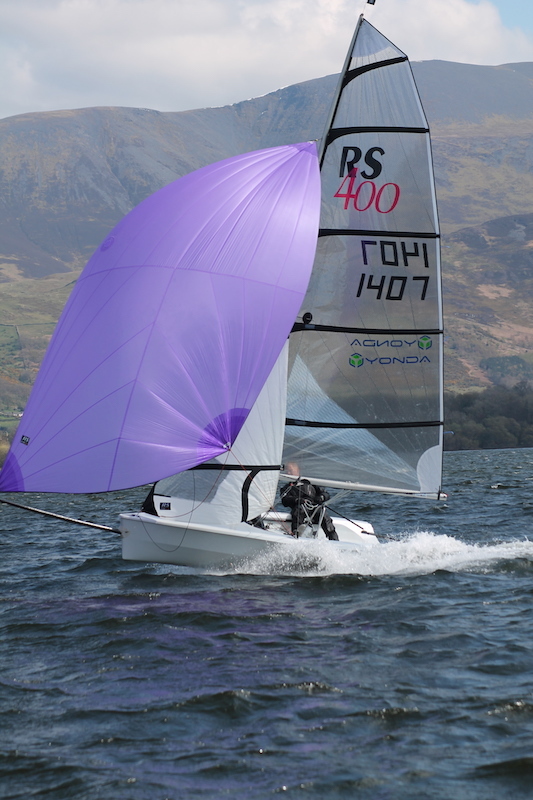 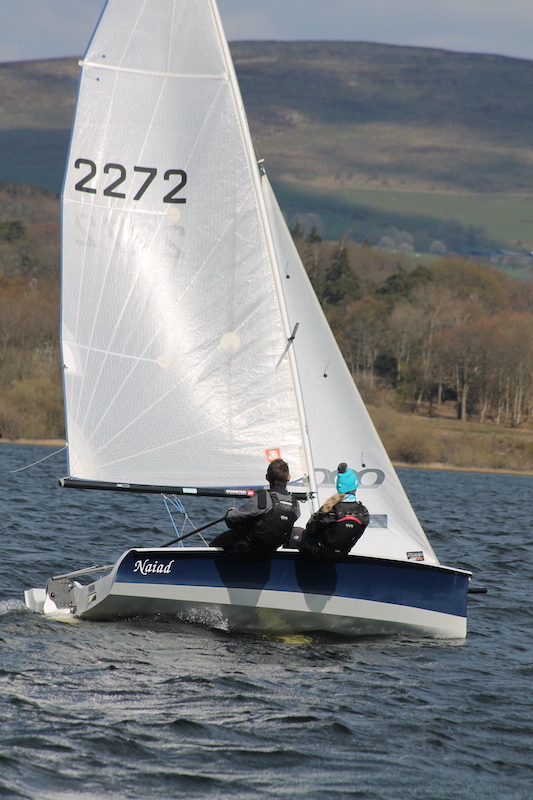 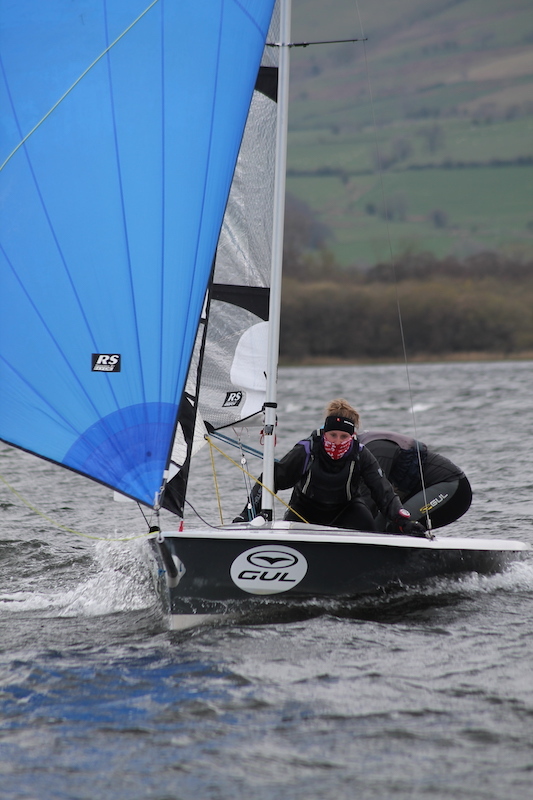 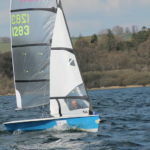 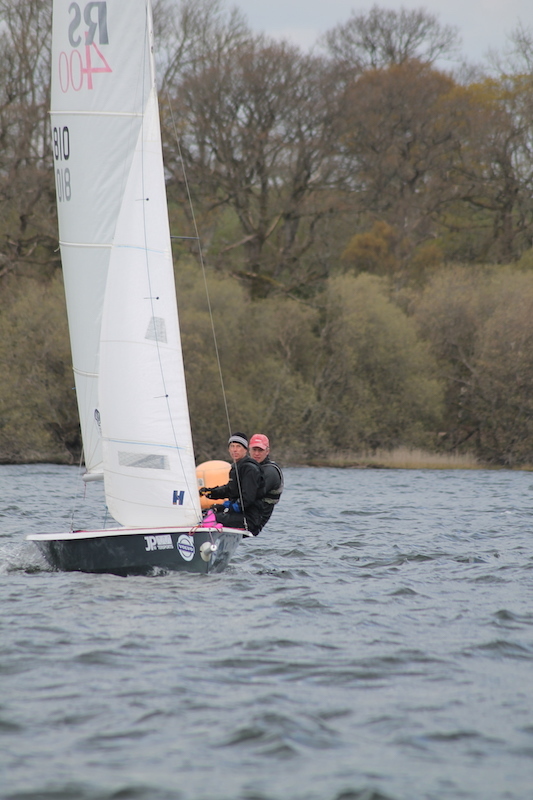 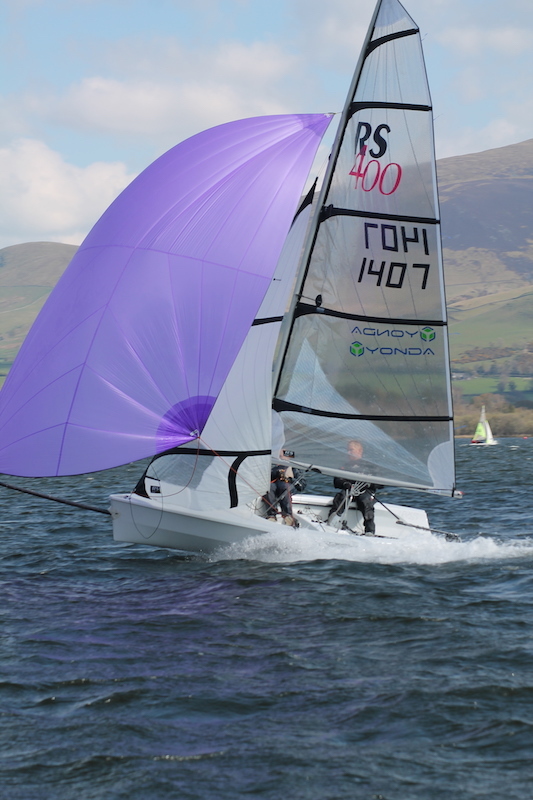 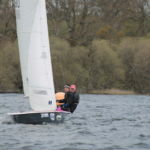 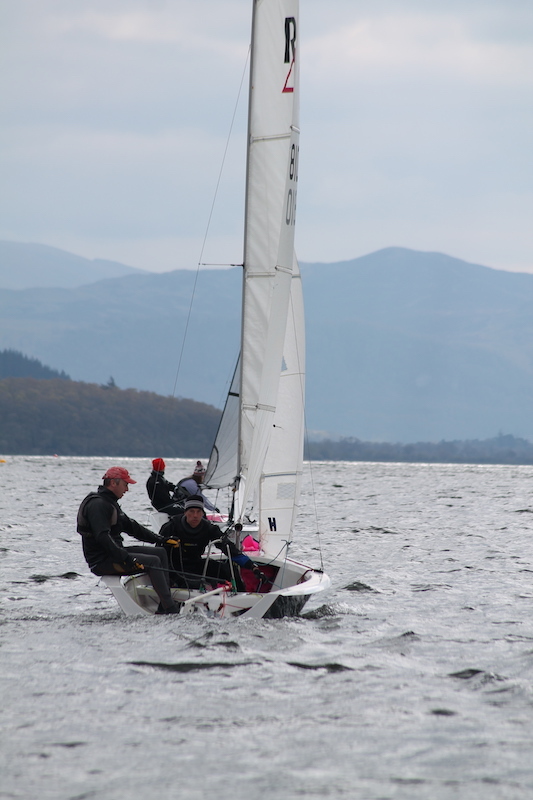 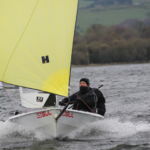 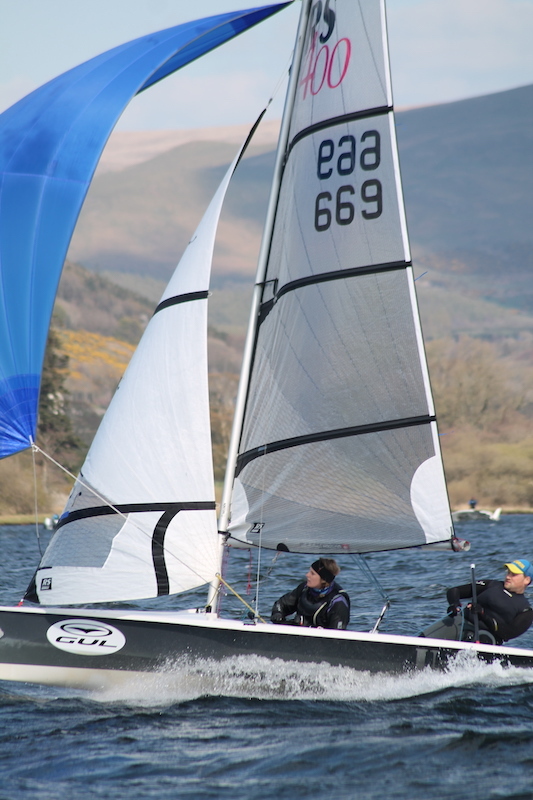 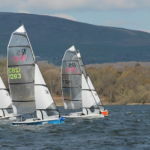 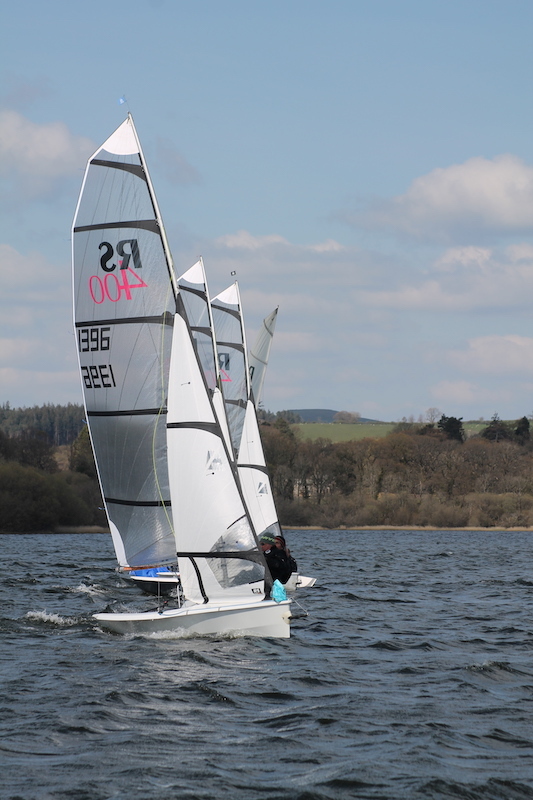 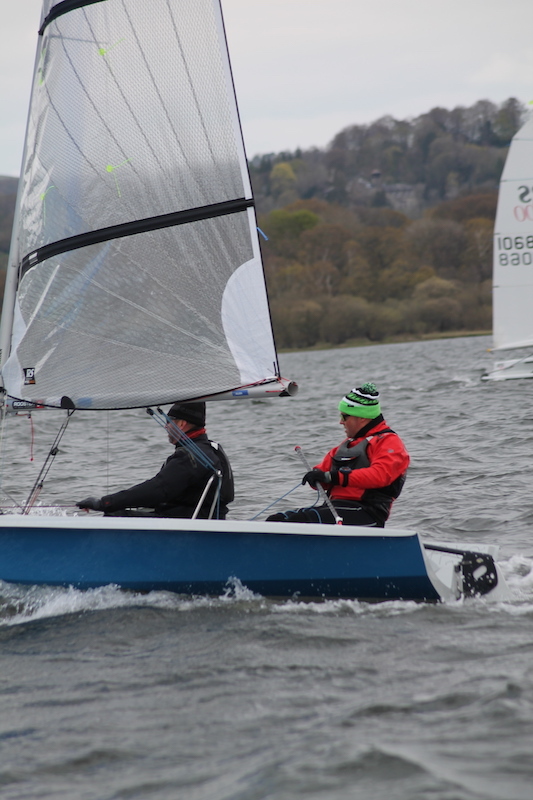 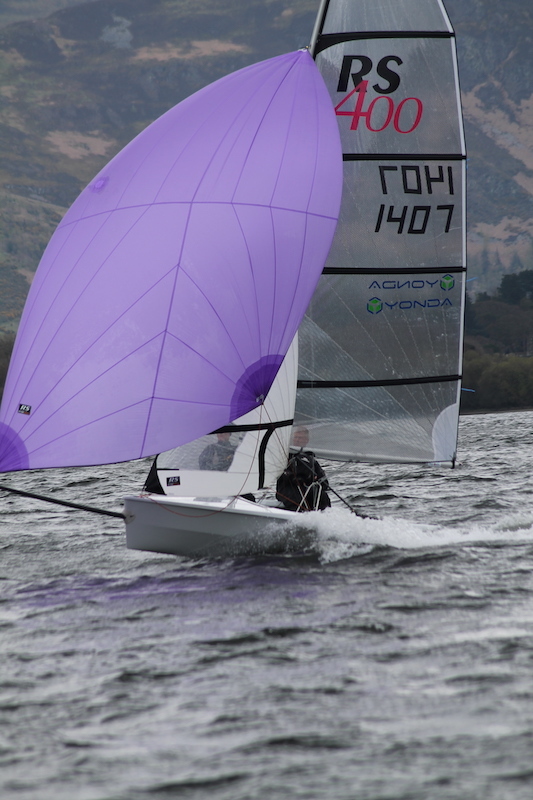 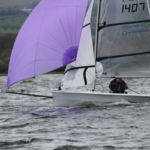 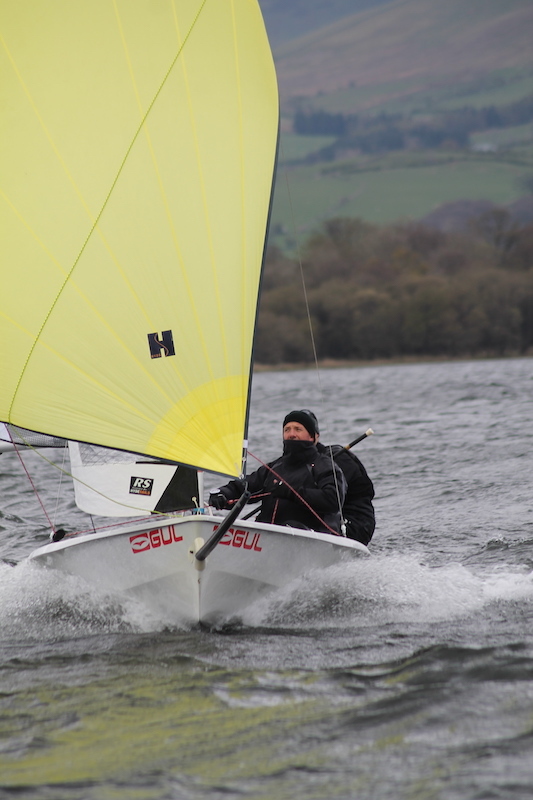 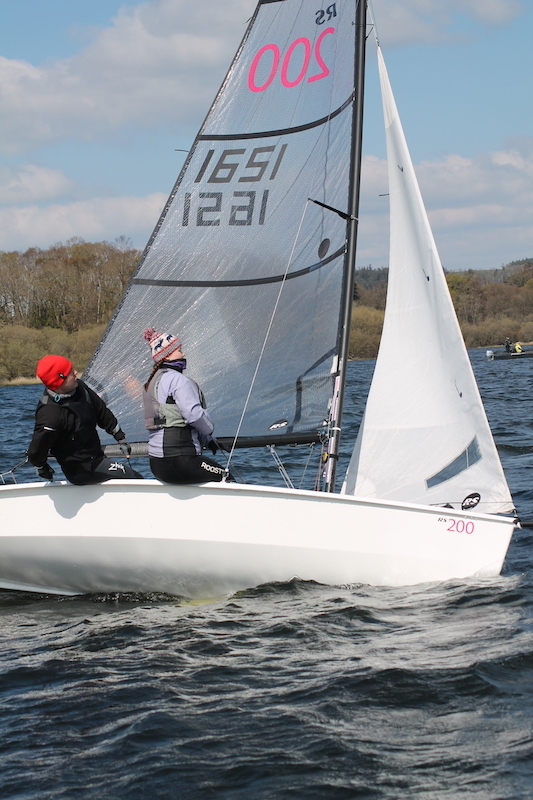 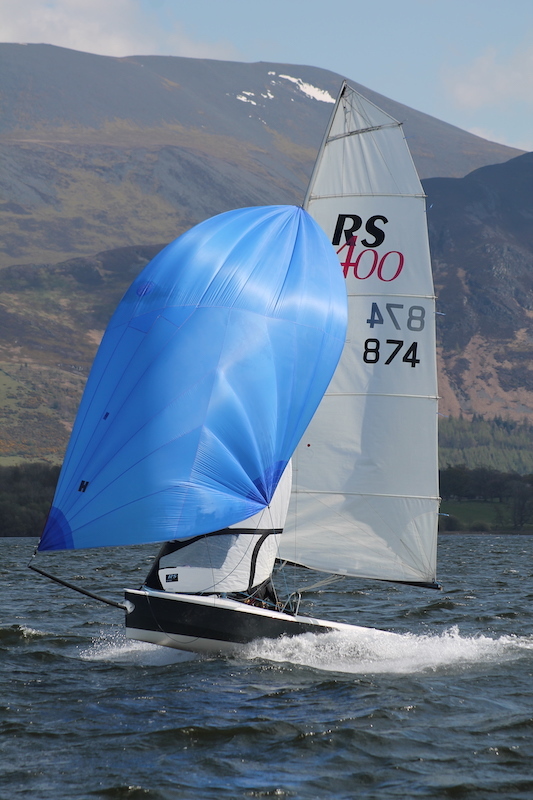 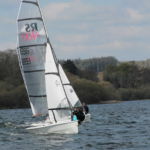 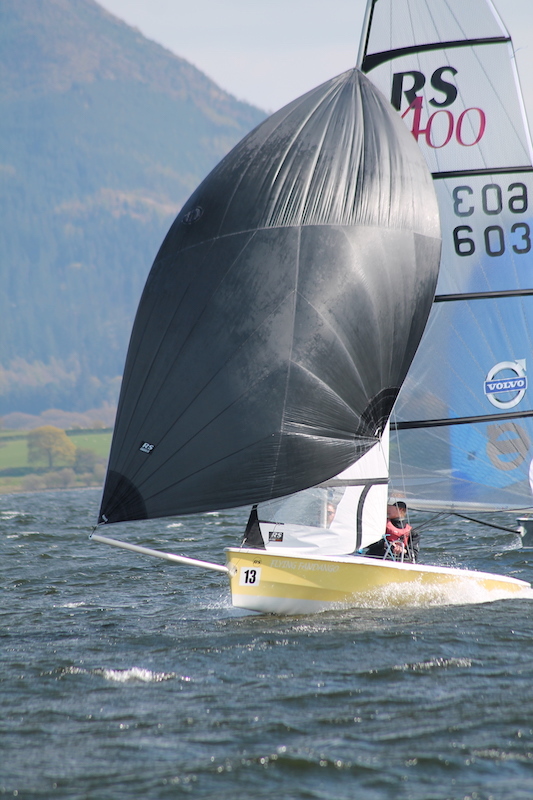 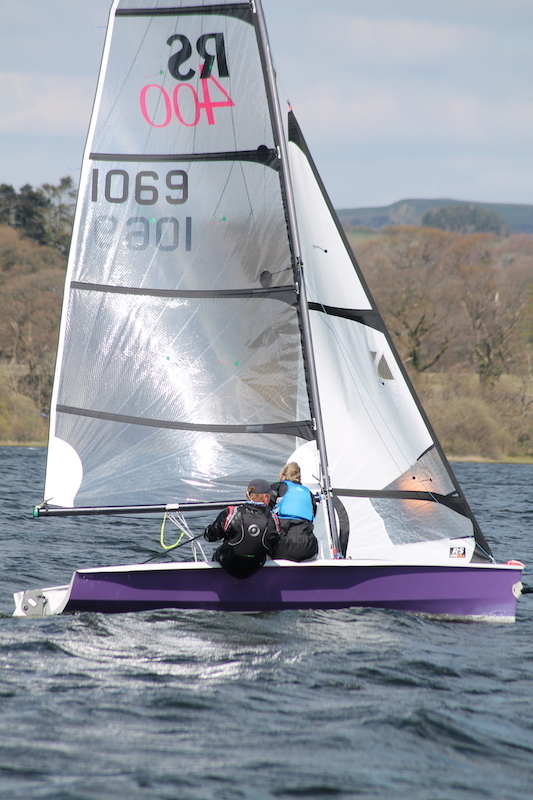 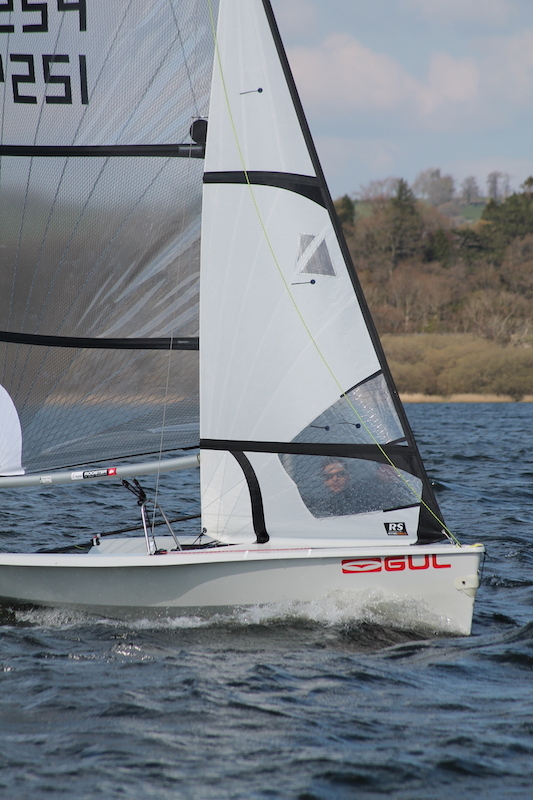 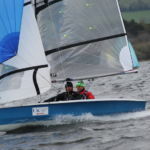 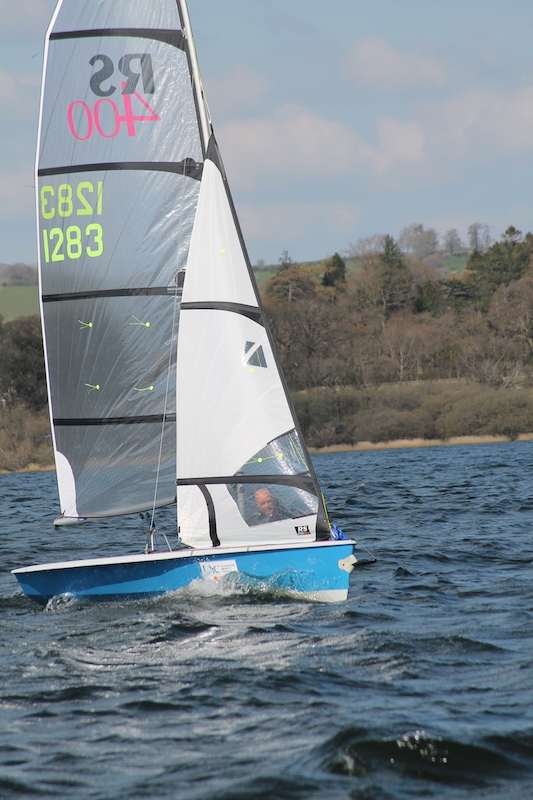 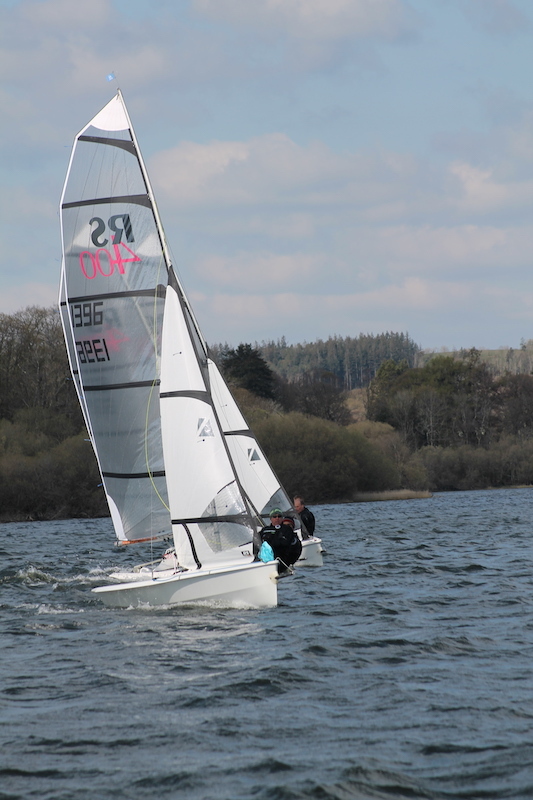 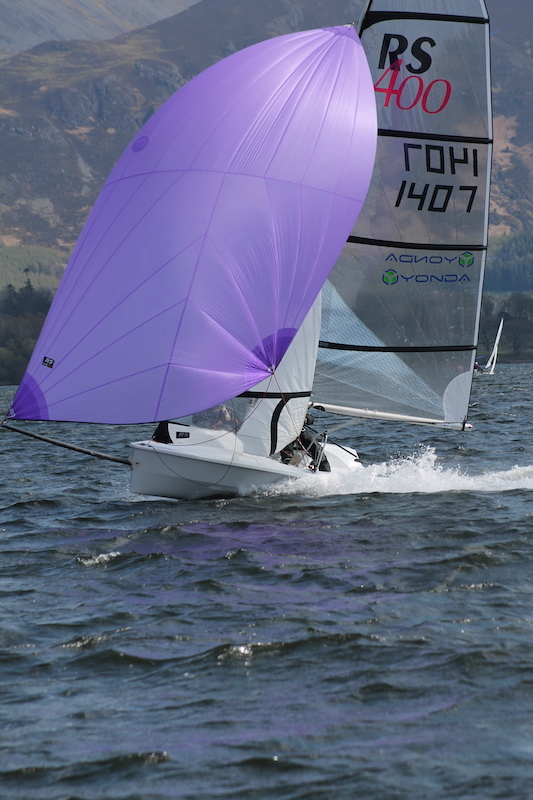 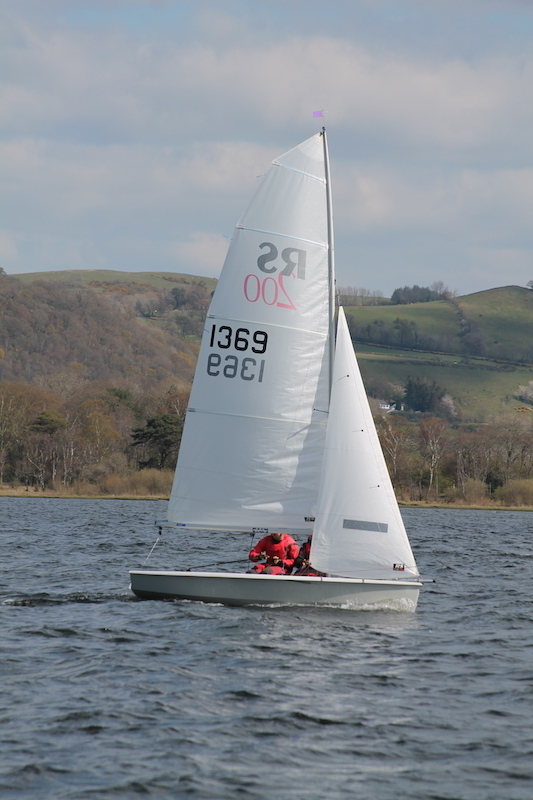 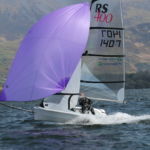 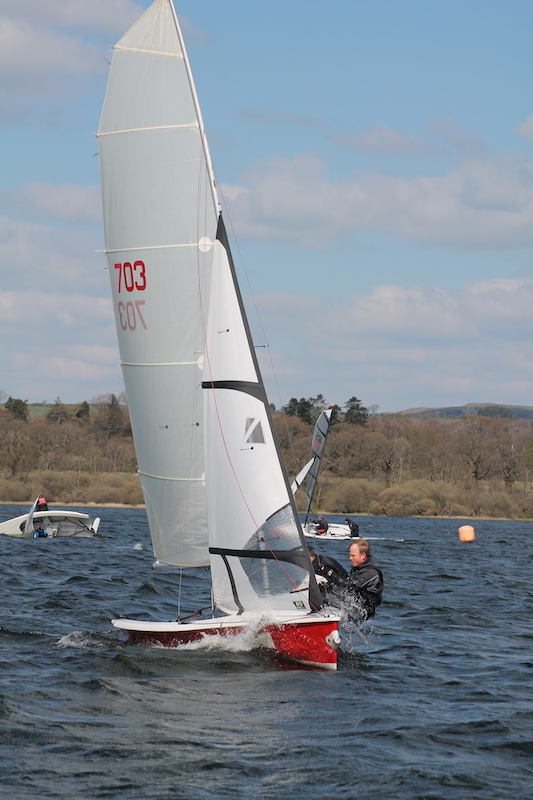 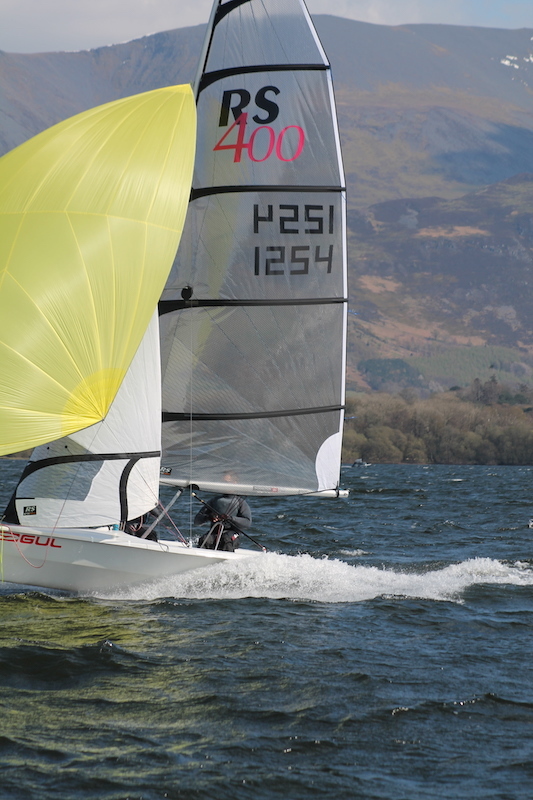 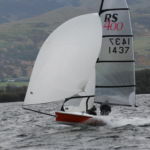 In the Slow Handicap fleet, more junior sailors were encouraged to race increasing the fleet to nine boats with Optimists, extra Mirrors, a Tera and a Topper, but it was Rob/Elizabeth Cook that took the honours. 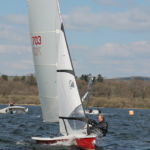 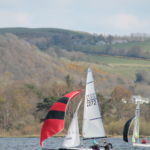 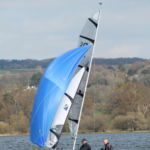 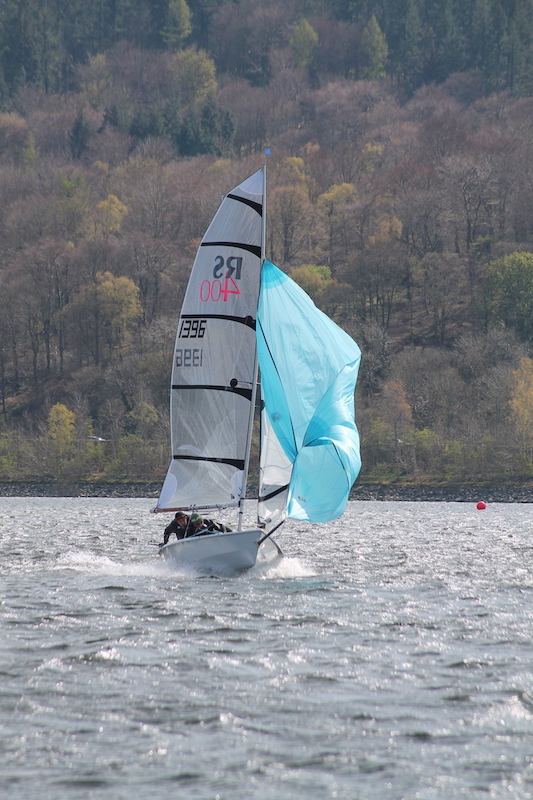 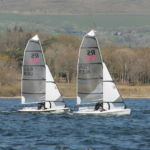 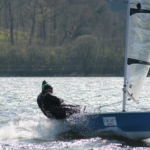 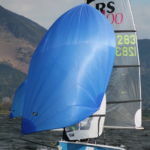 After lunch the wind was reinforced a little with a sea breeze for the final two, somewhat eventful, races of the day. 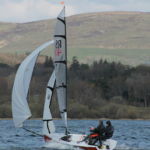 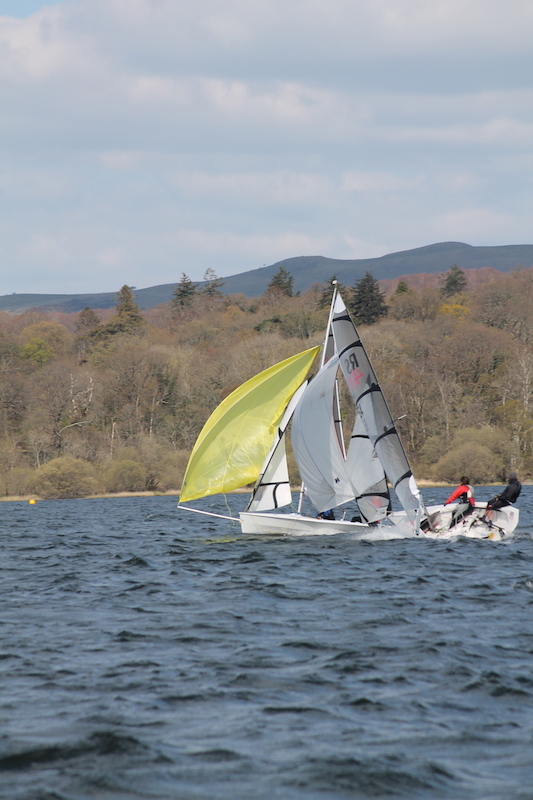 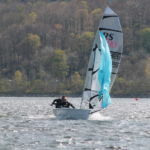 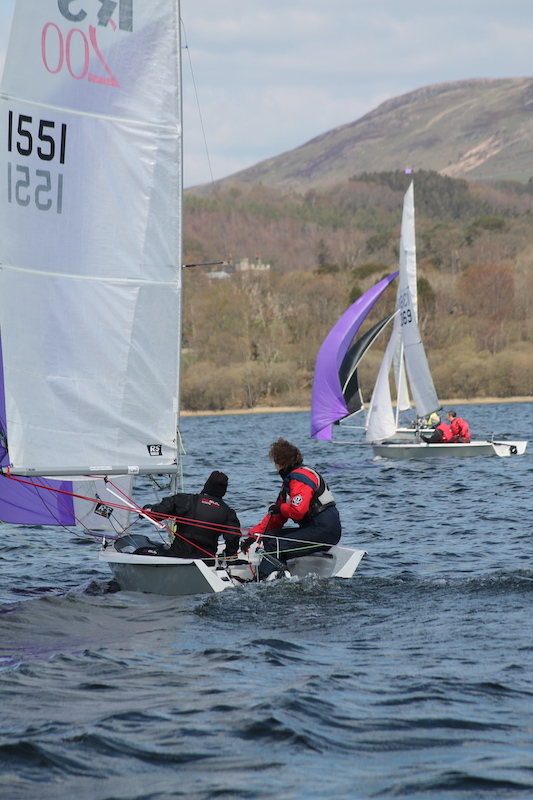 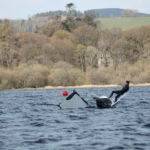 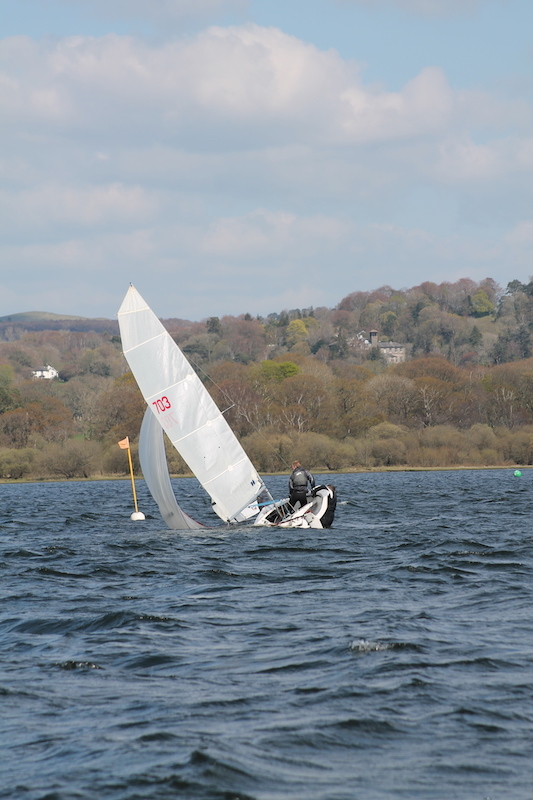 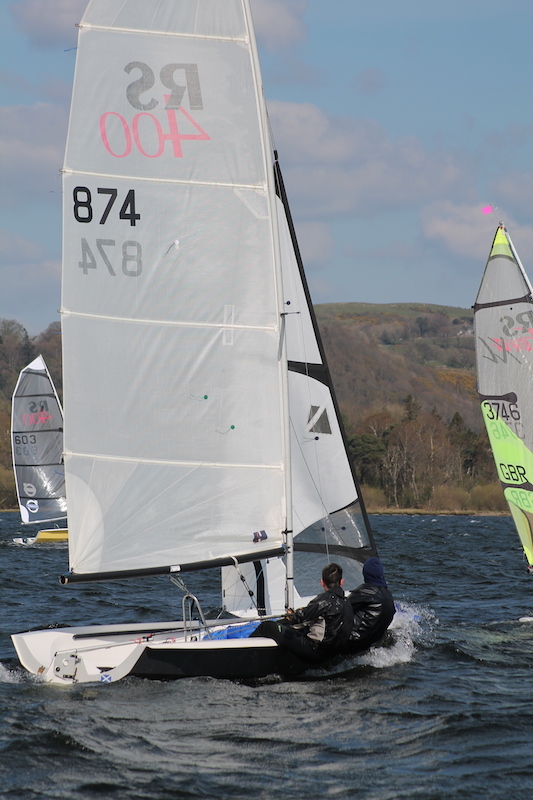 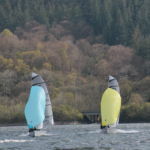 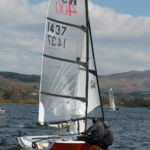 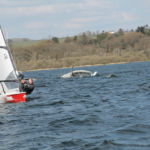 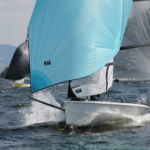 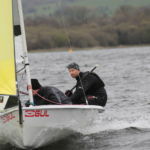 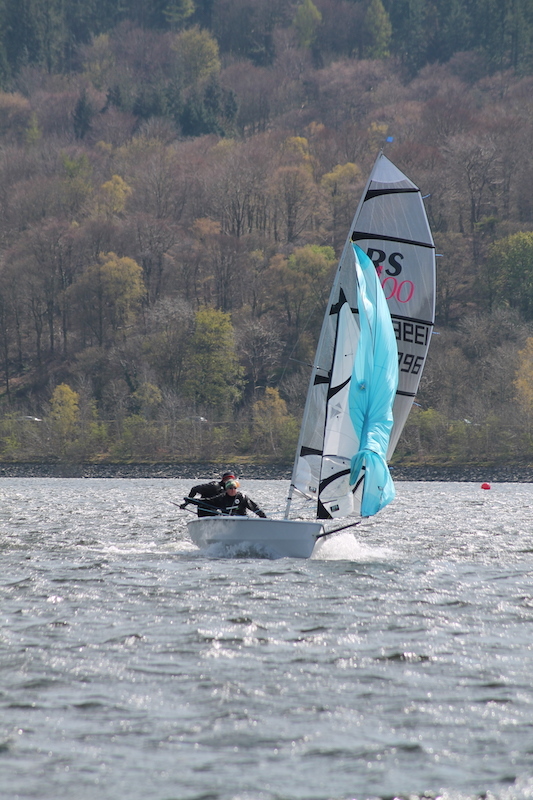 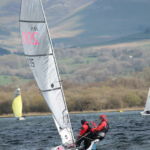 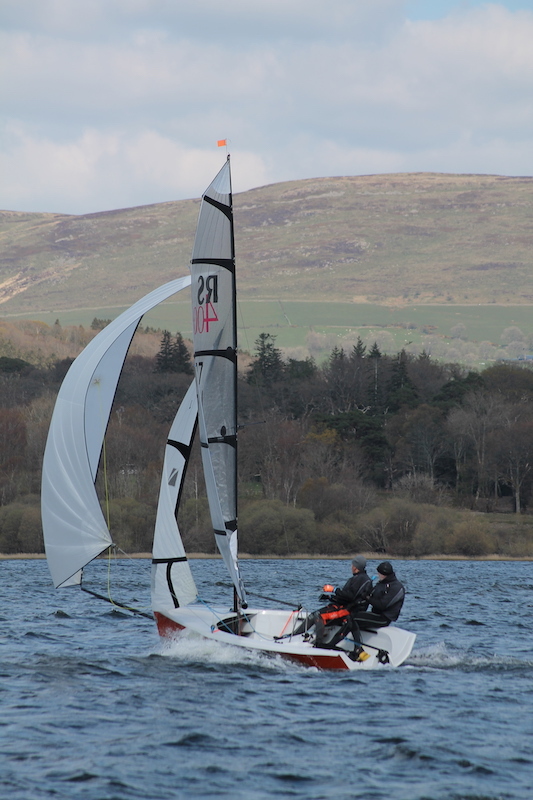 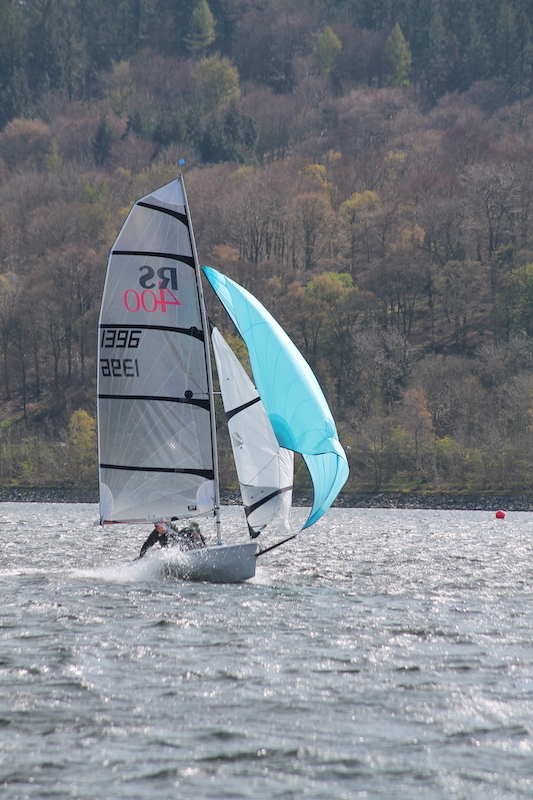 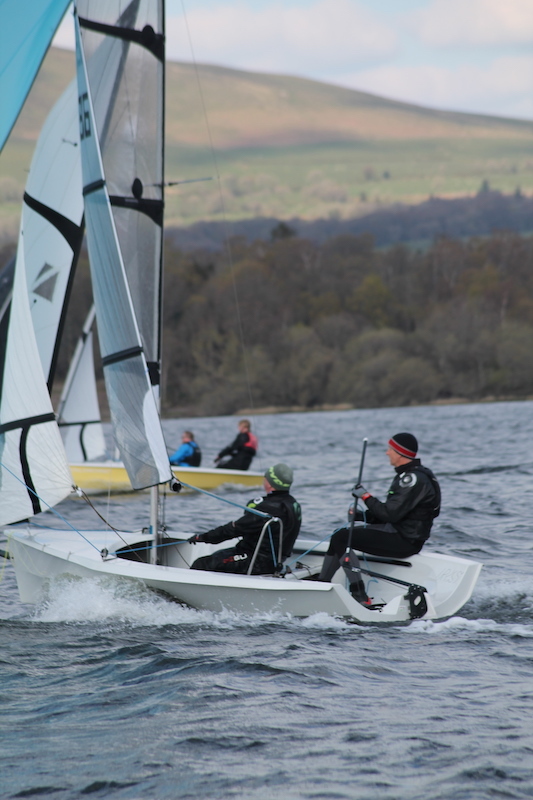 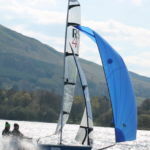 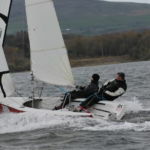 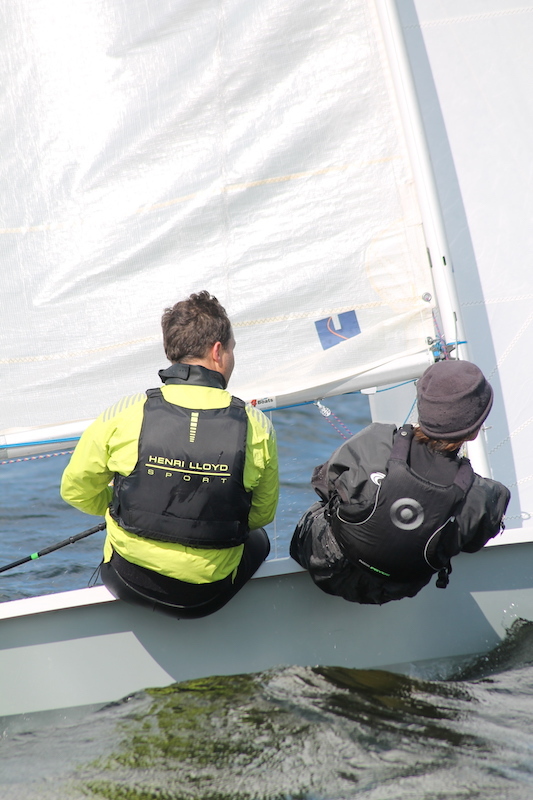 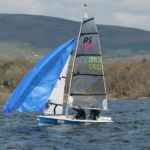 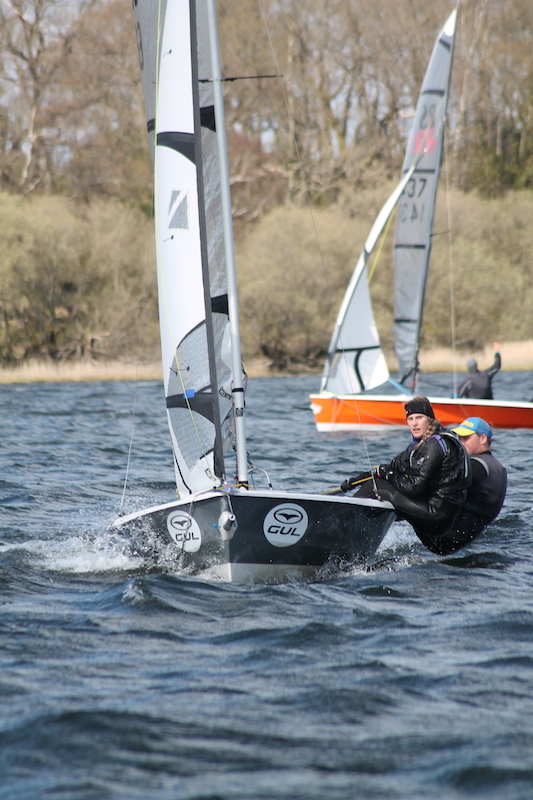 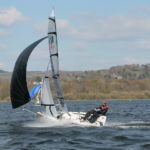 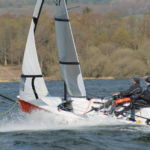 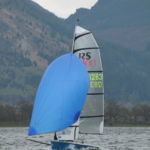 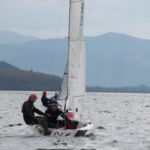 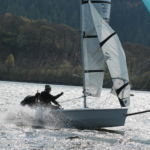 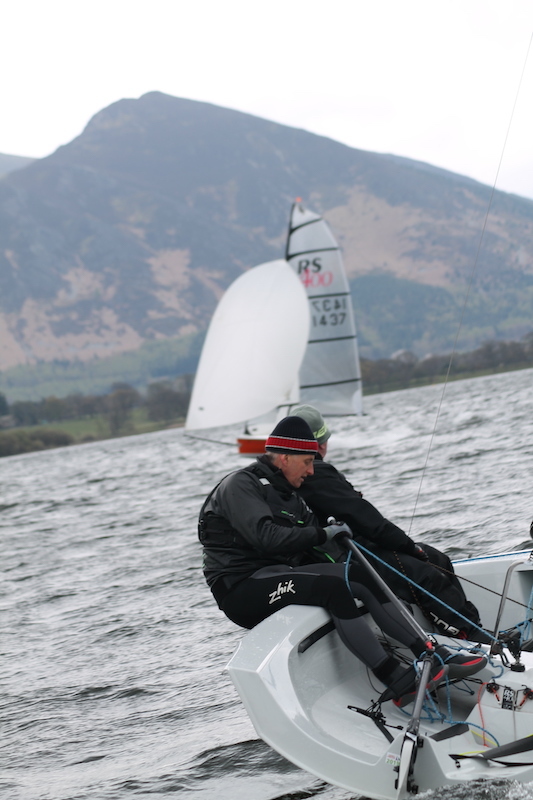 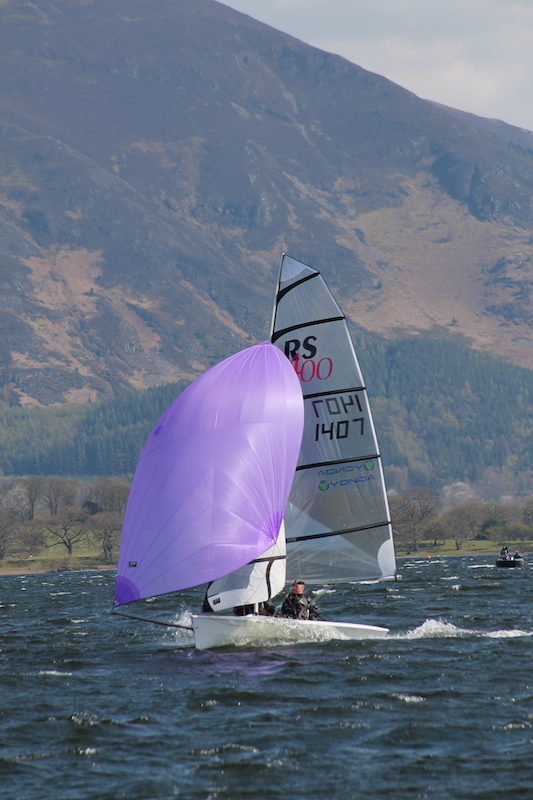 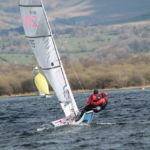 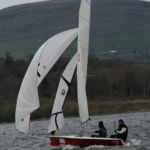 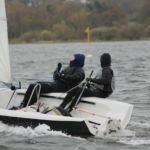 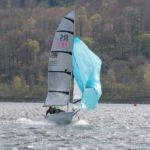 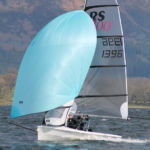 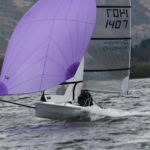 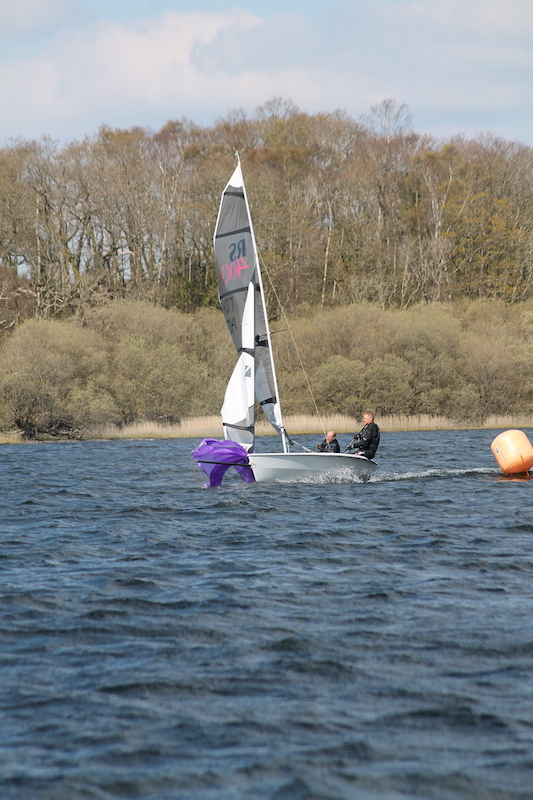 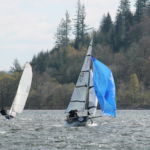 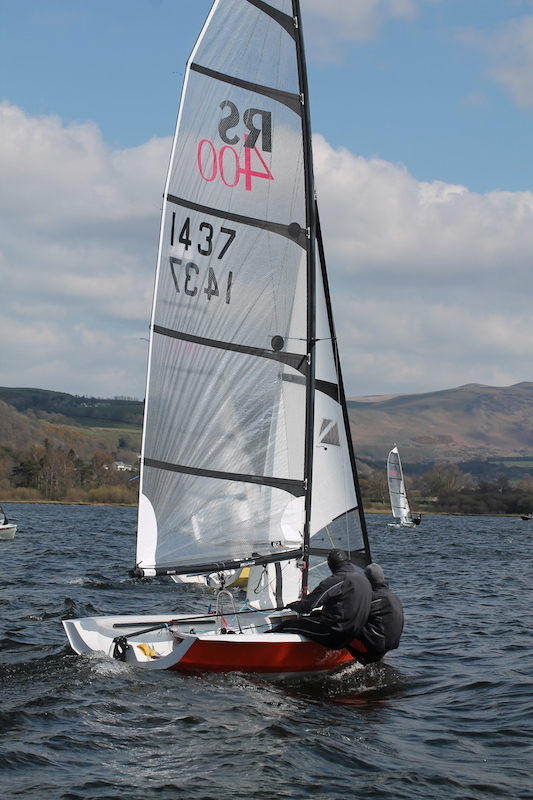 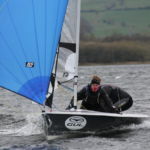 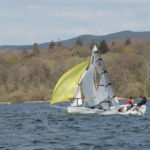 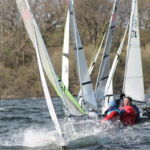 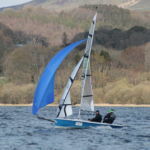 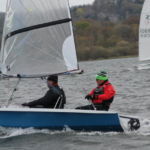 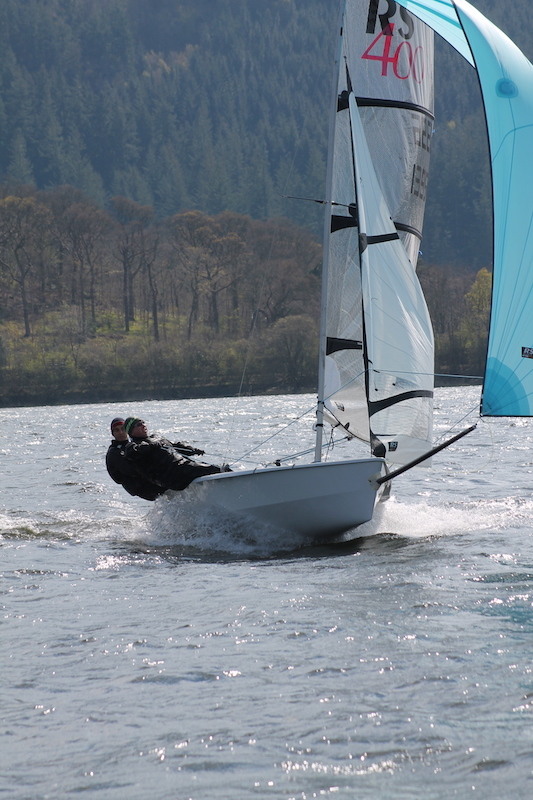 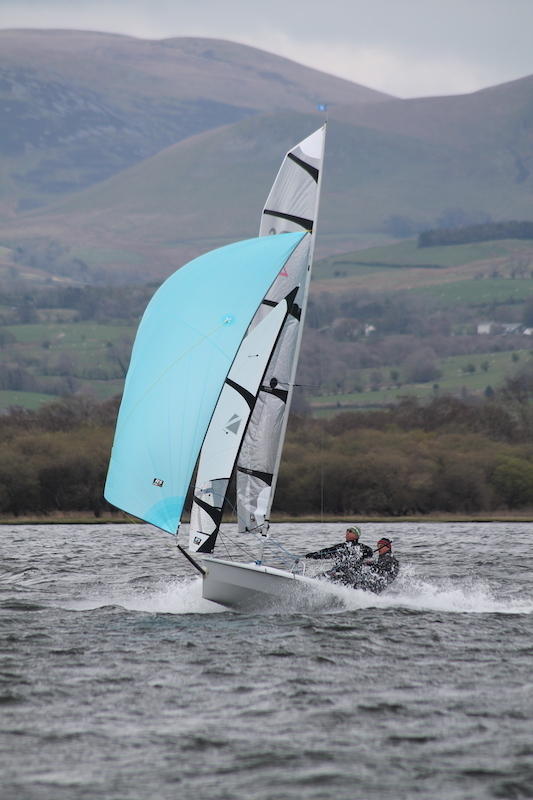 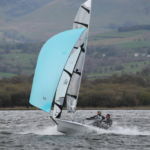 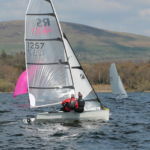 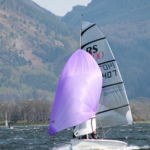 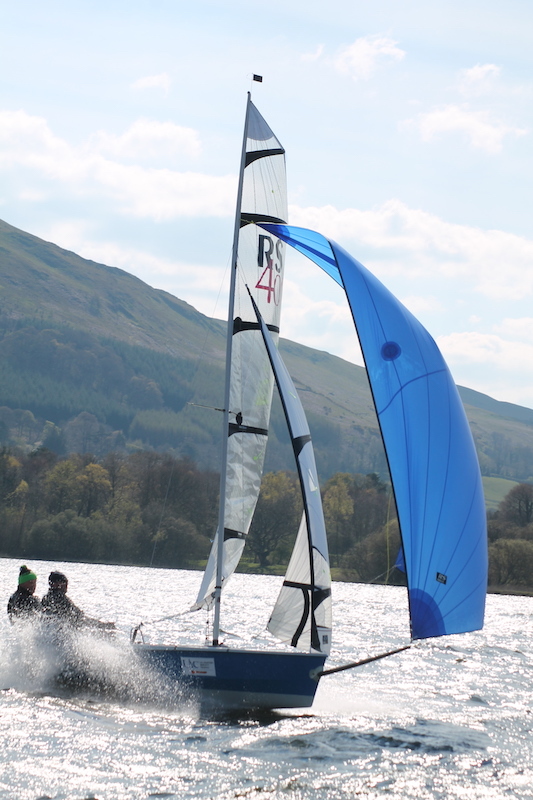 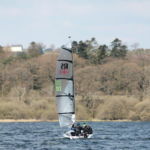 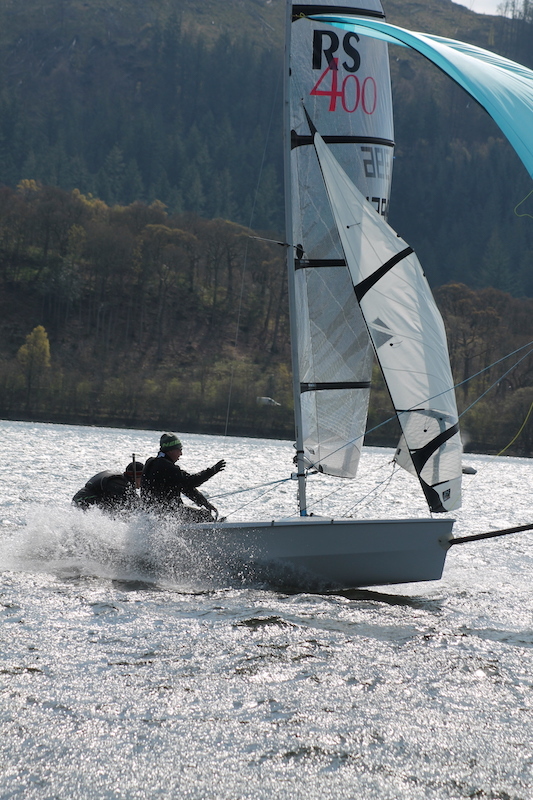 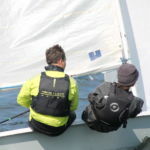 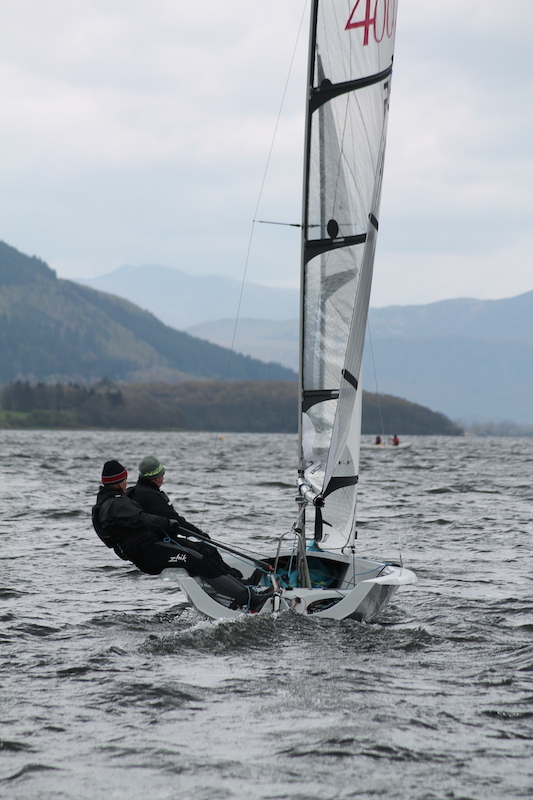 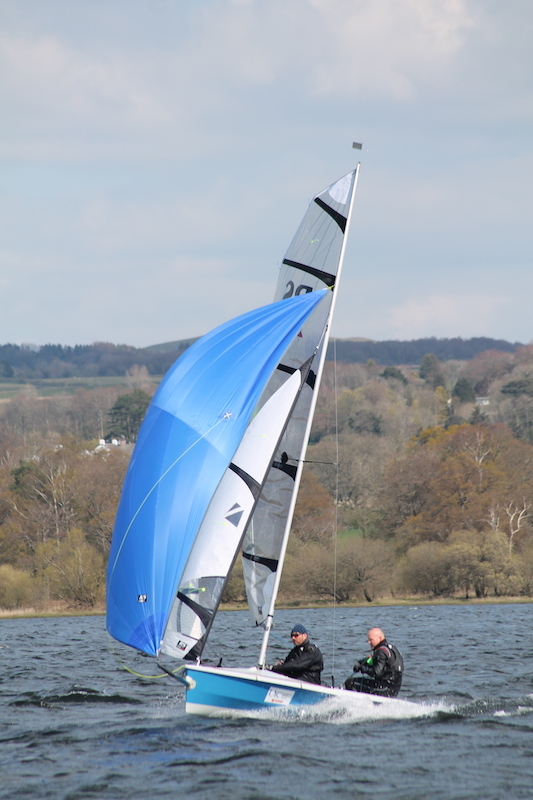 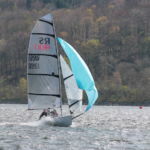 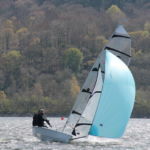 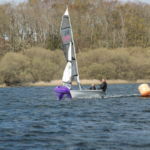 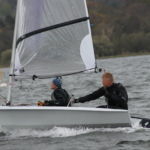 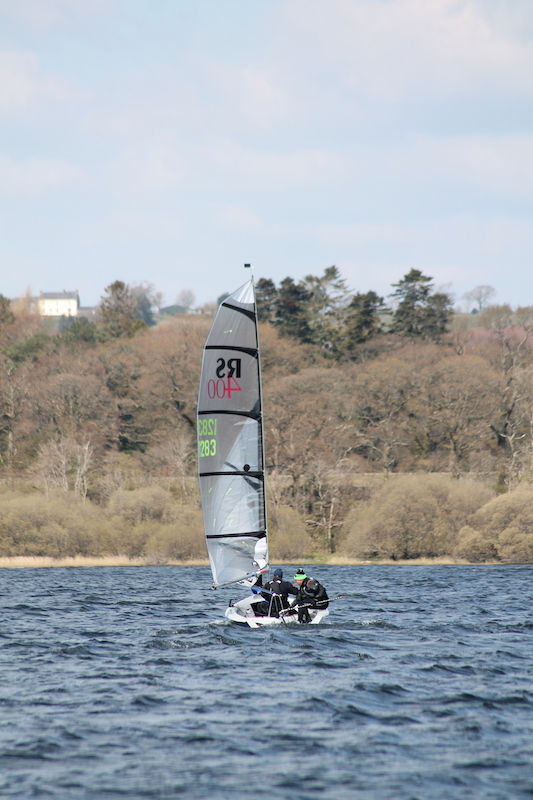 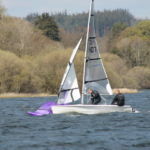 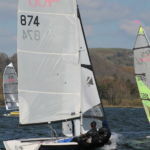 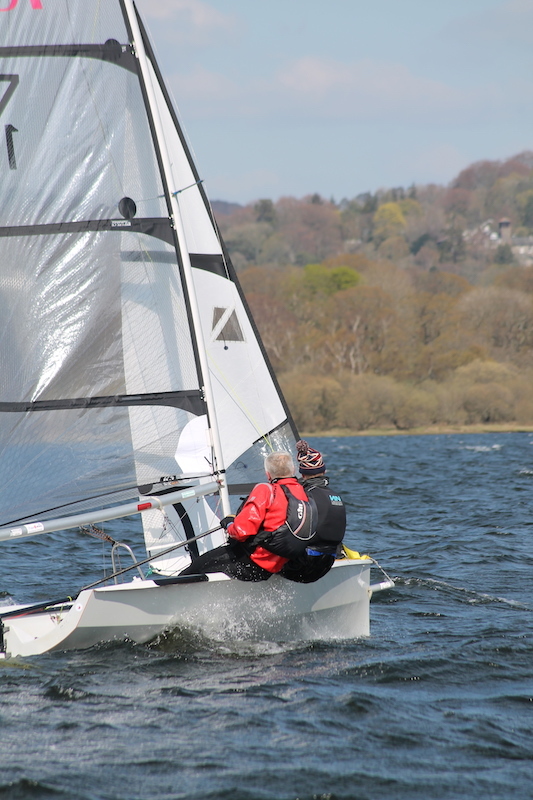 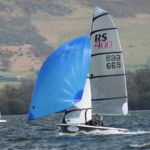 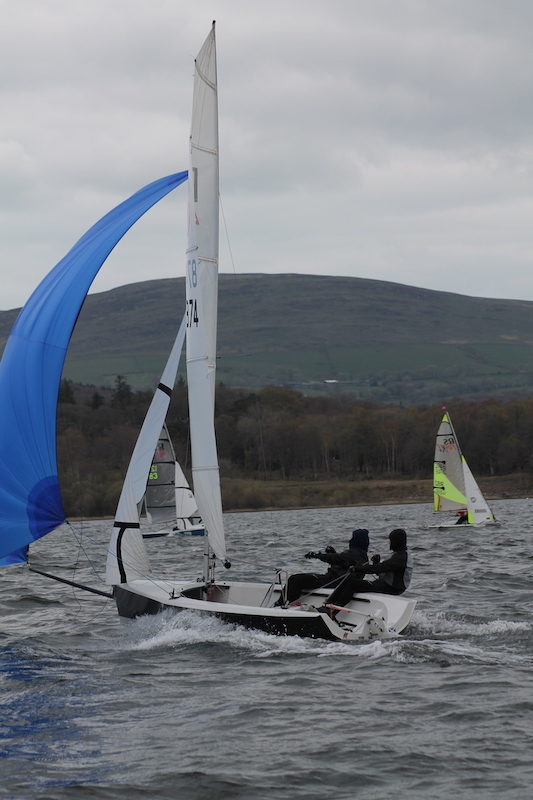 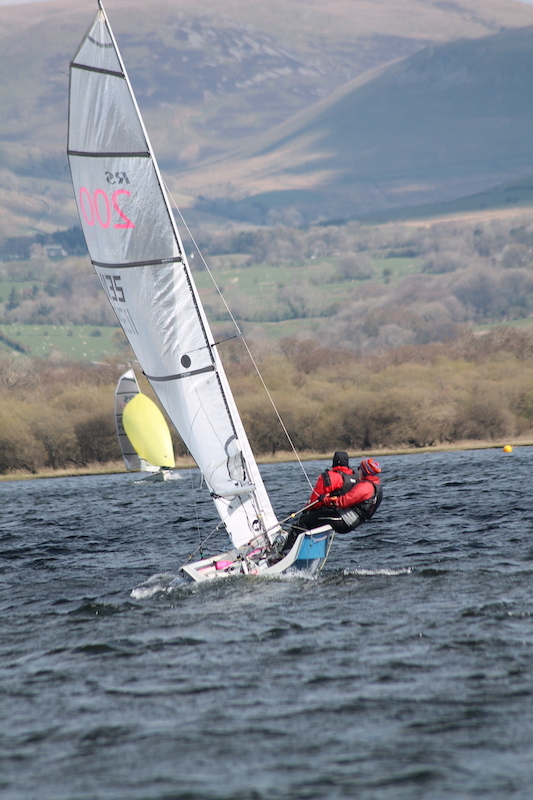 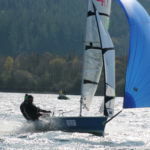 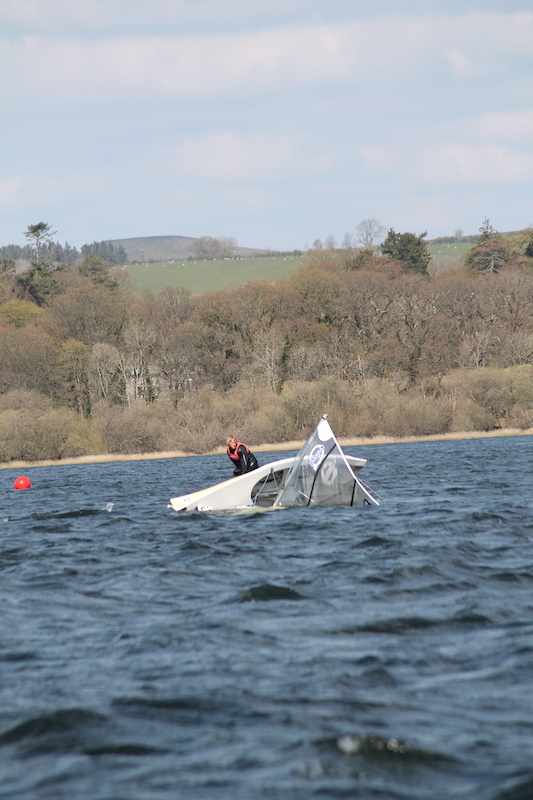 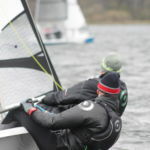 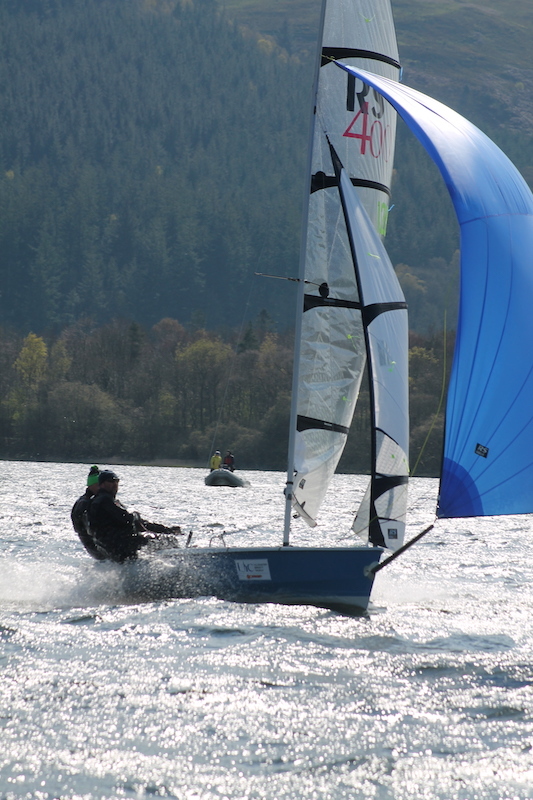 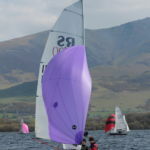 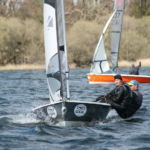 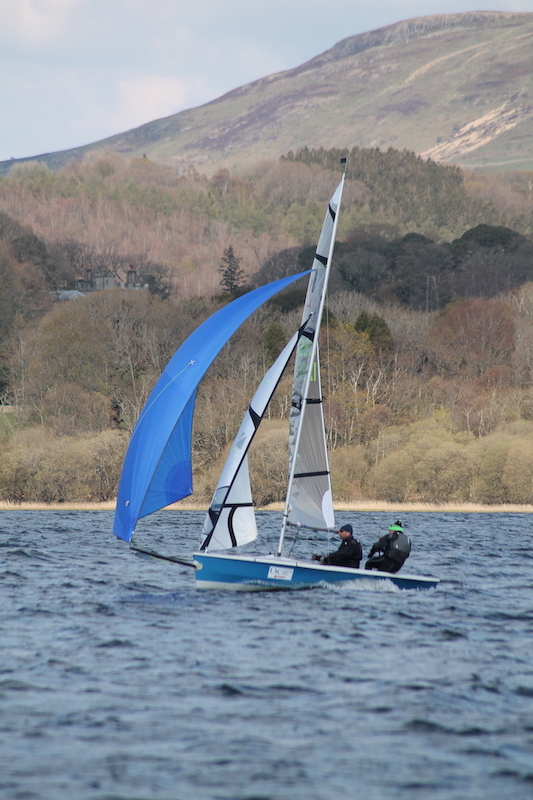 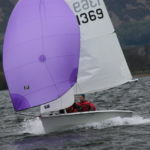 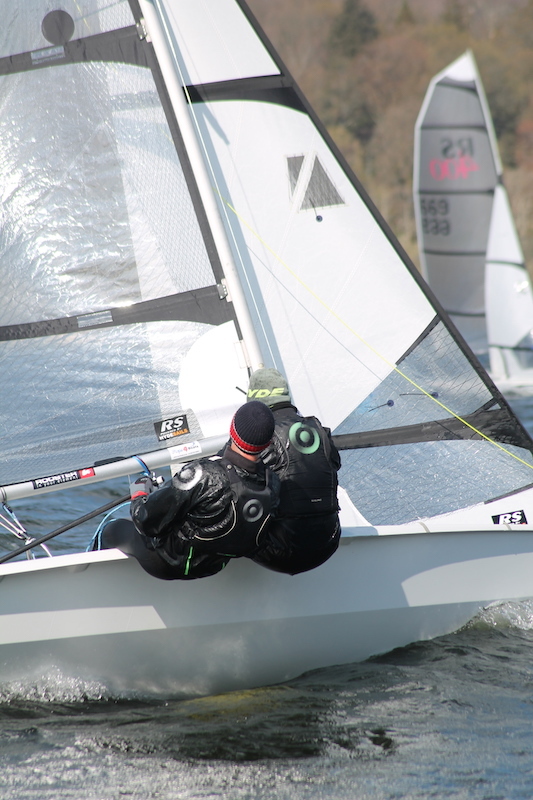 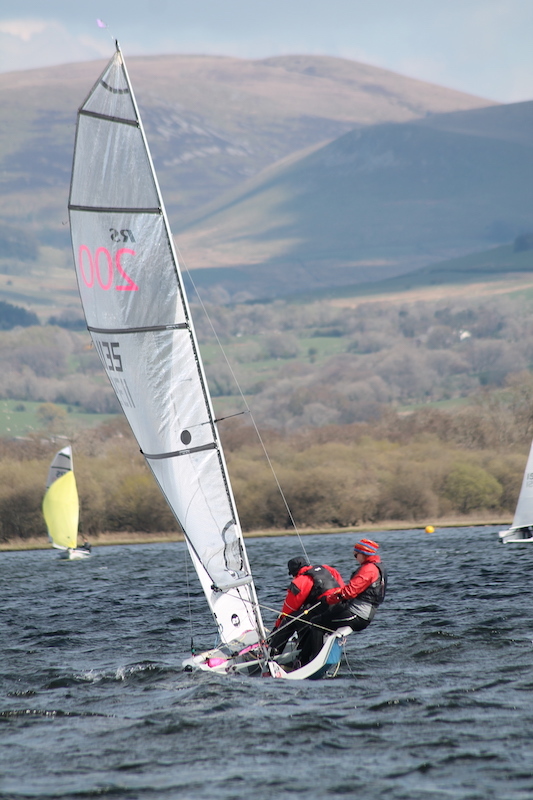 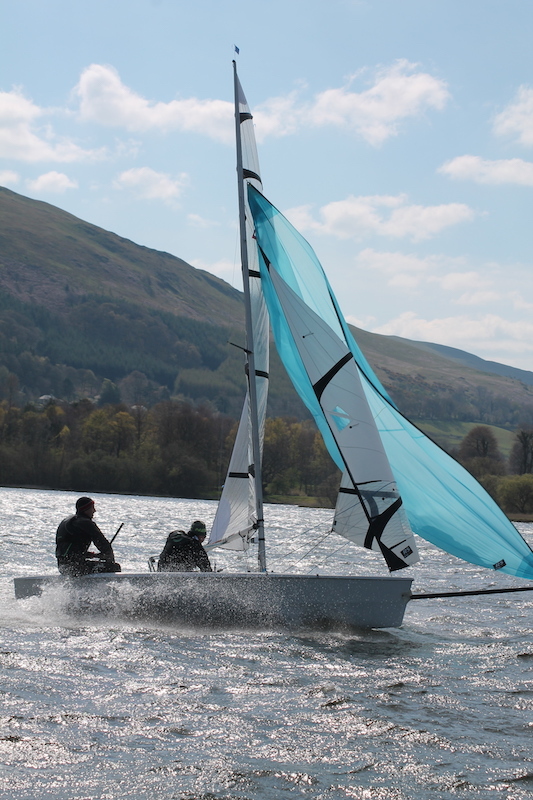 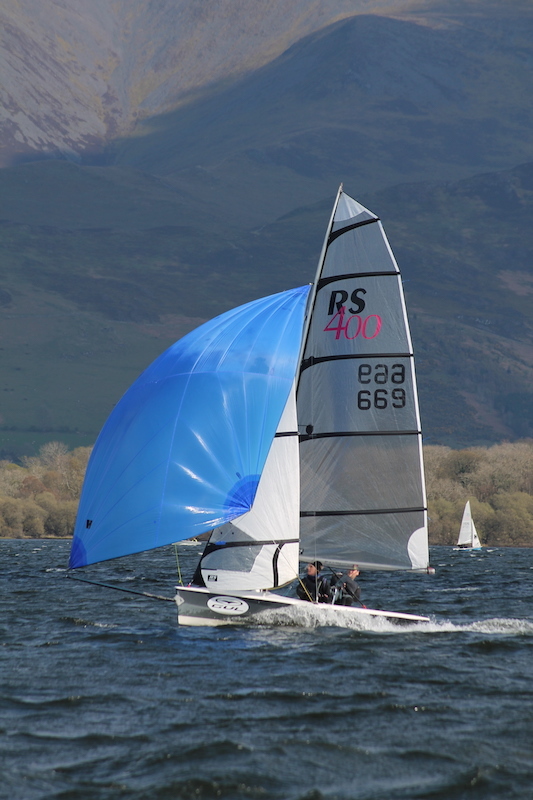 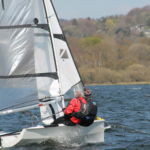 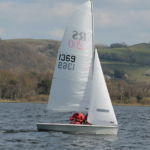 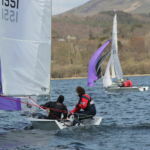 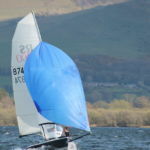 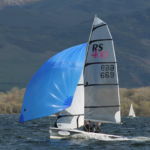 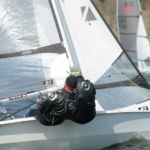 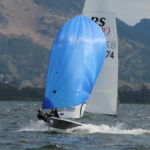 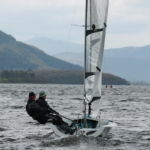 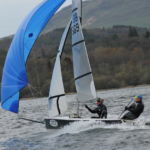 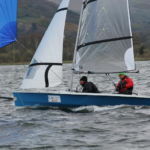 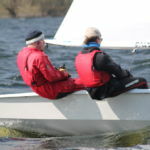 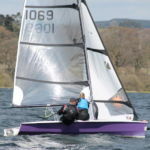 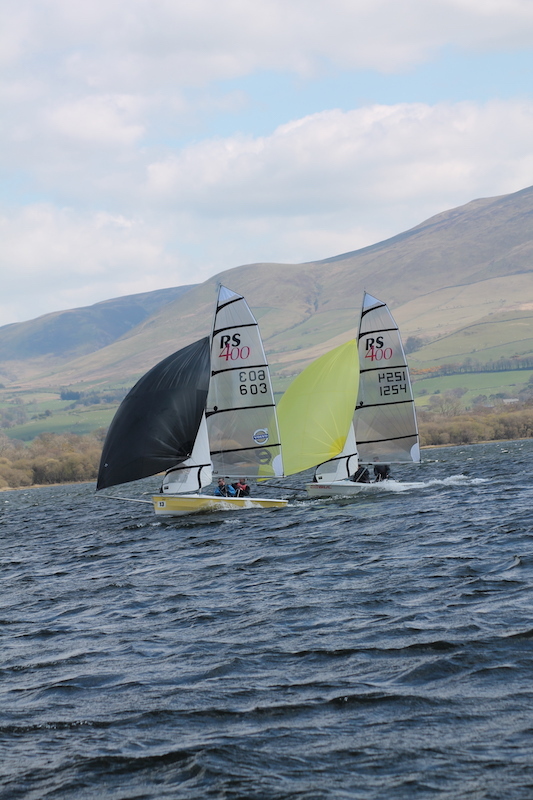 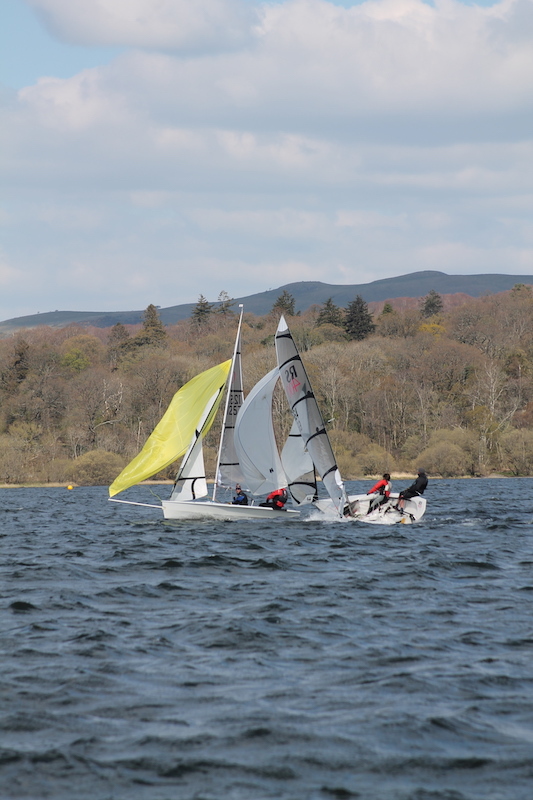 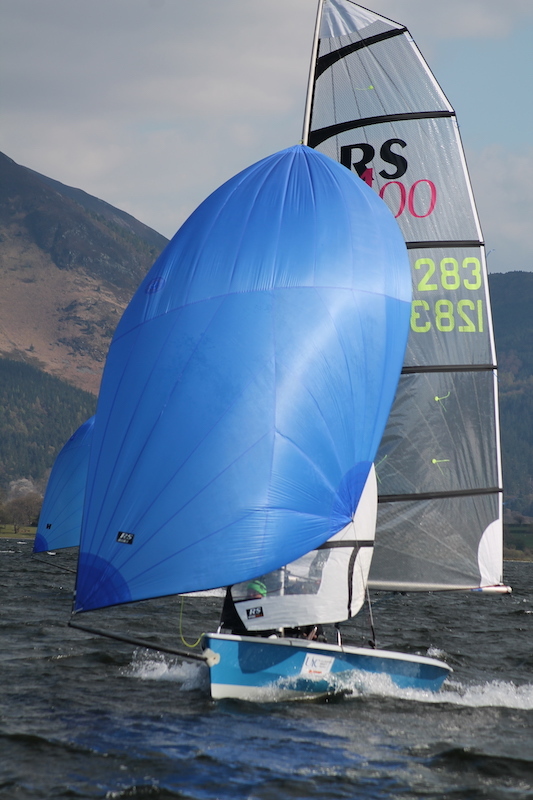 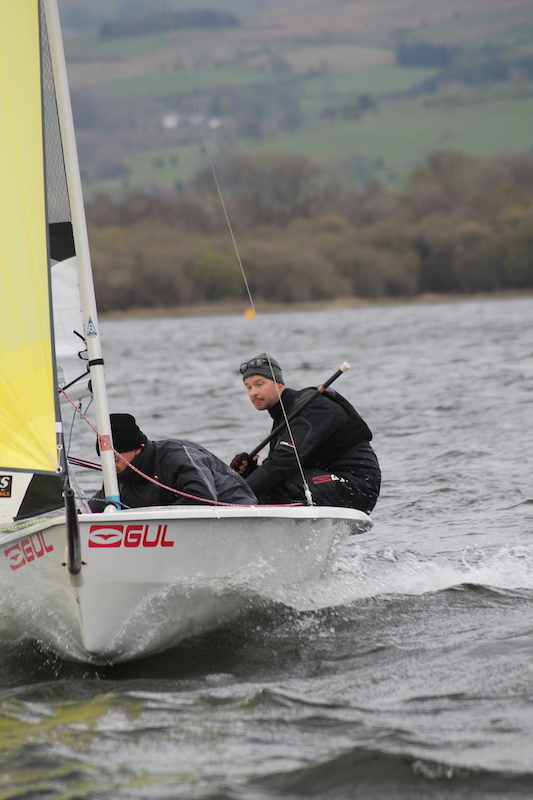 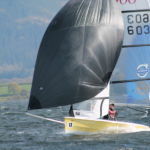 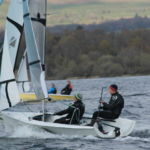 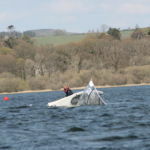 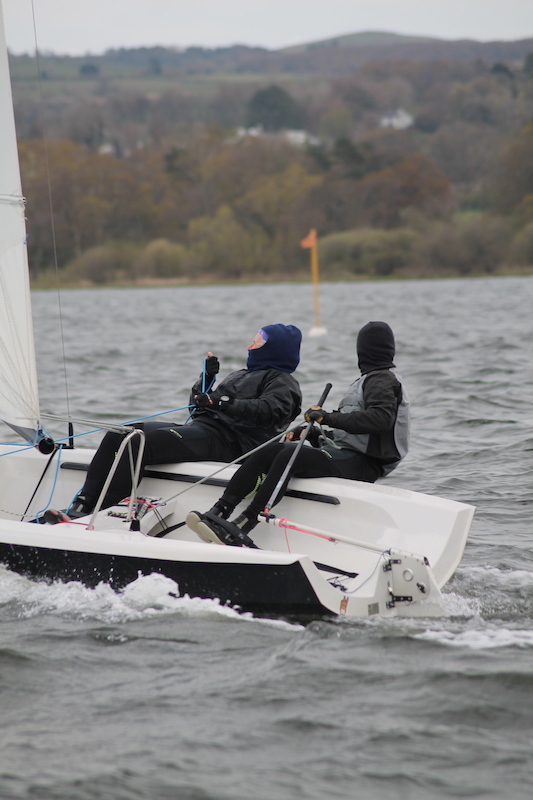 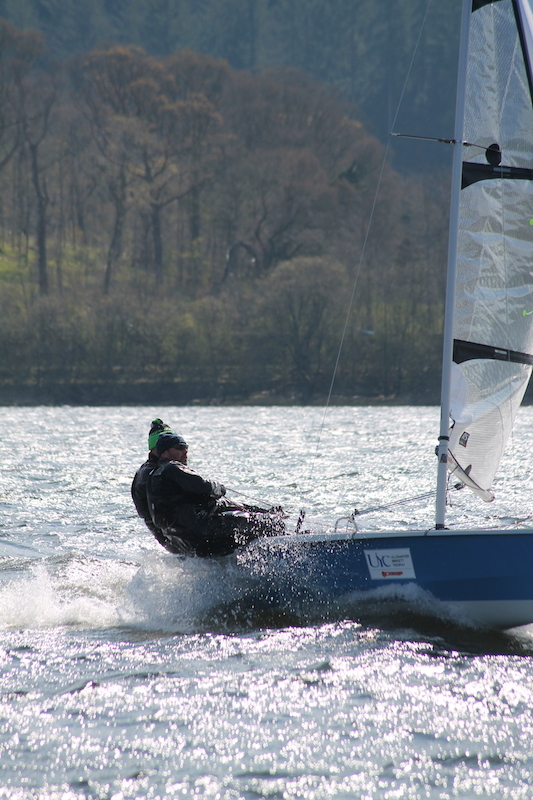 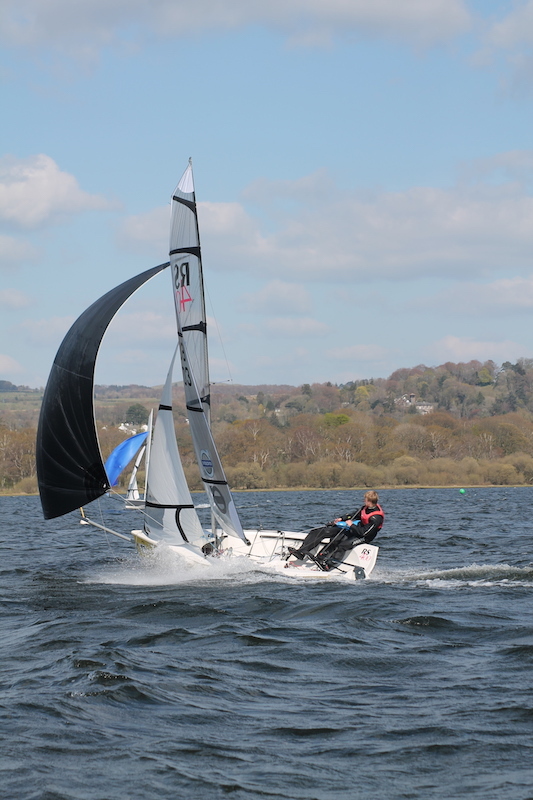 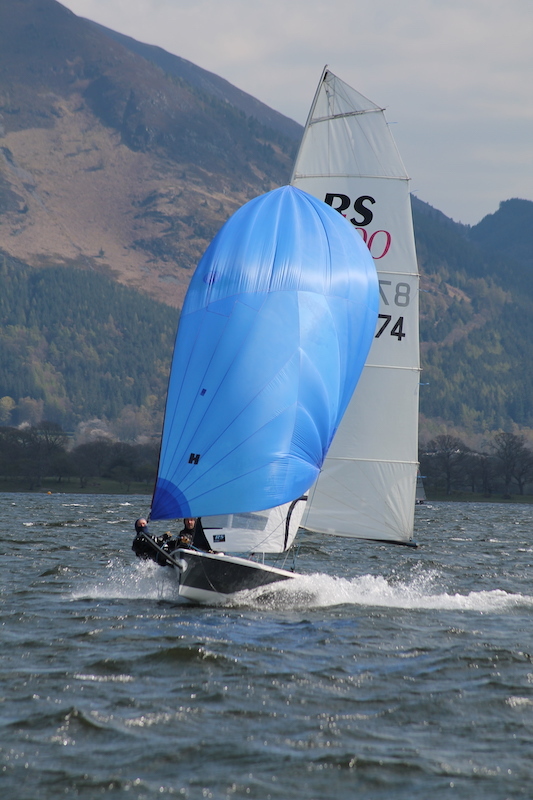 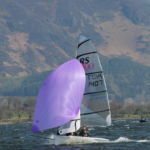 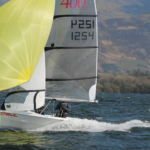 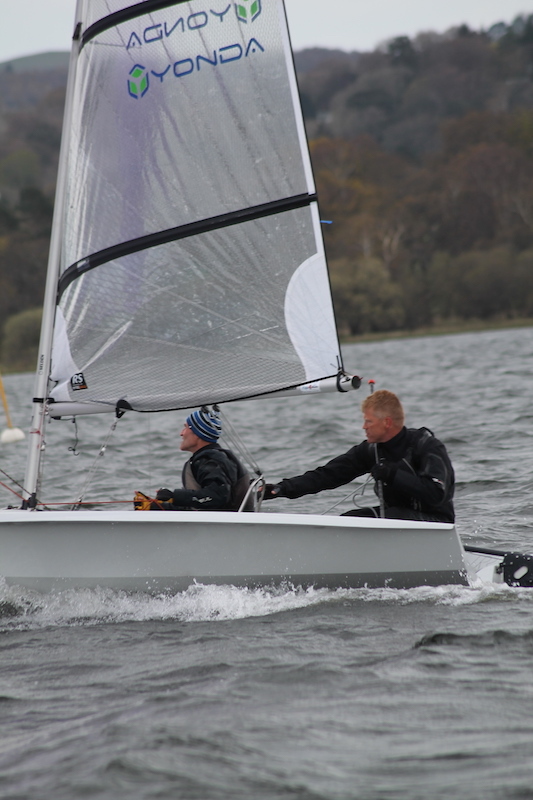 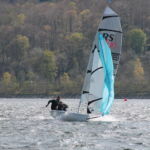 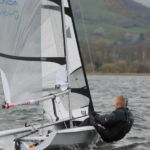 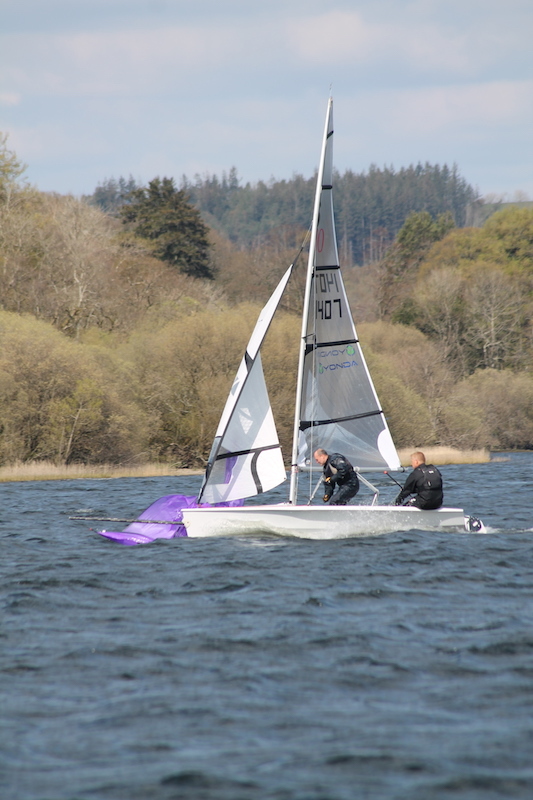 Monday was forecast to have the best sailing wind of the weekend, and on arrival there was a good southerly blowing which had various crews digging out their dry suits for a potential sail down the lake. 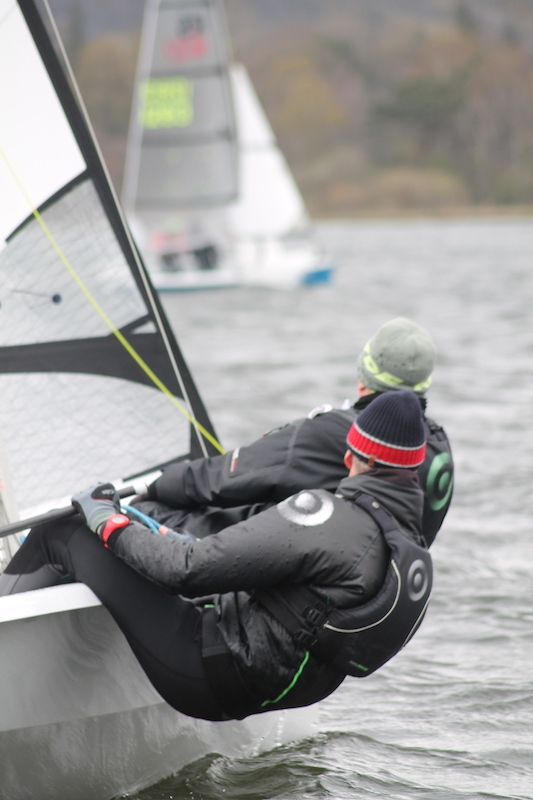 The OD opted to play it safe for the morning race and set a beat to 8. 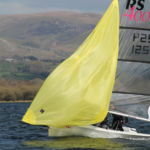 Soon after the start sequence commenced the wind was easing, so it was a slow first beat for everyone, but it did fill in again only to ease again after the F15s started the next lap. 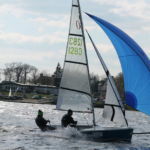 The split wind gave Scumper/Zefer a chance to go the opposite side of the beat to leaders Simon/Jon, and they took the lead when the wind caught them first. 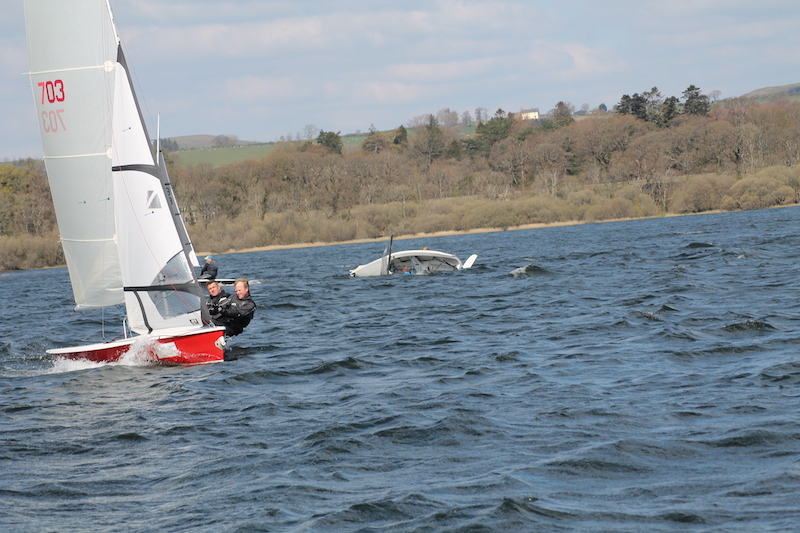 As far as the F15s were concerned, there was everything to sail for in the final race which is partially why there was a port/starboard incident on the start line causing both Simon and Scumper to be doing turns! 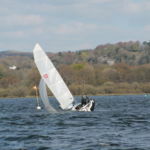 Simon ended up doing another set of turns for colliding with Ian. 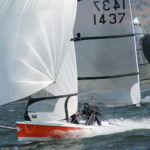 By the windward mark Mike/Kayla were in the lead, but Simon was ahead of Scumper, and stayed there to the end to win the series on count back. 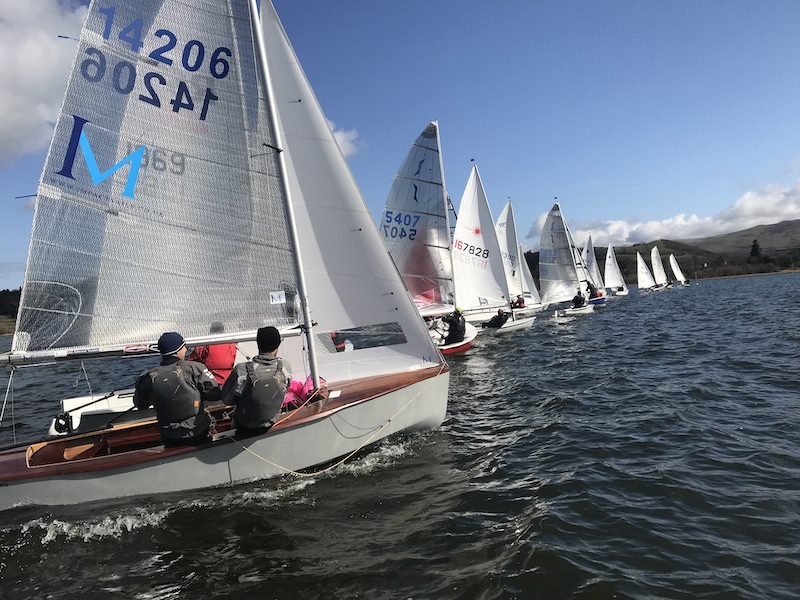 The Slow Handicap fleet sailed a a smaller course that was shortened just before the other fleets rounded zero, though some of the other boats thought it was their finish too! 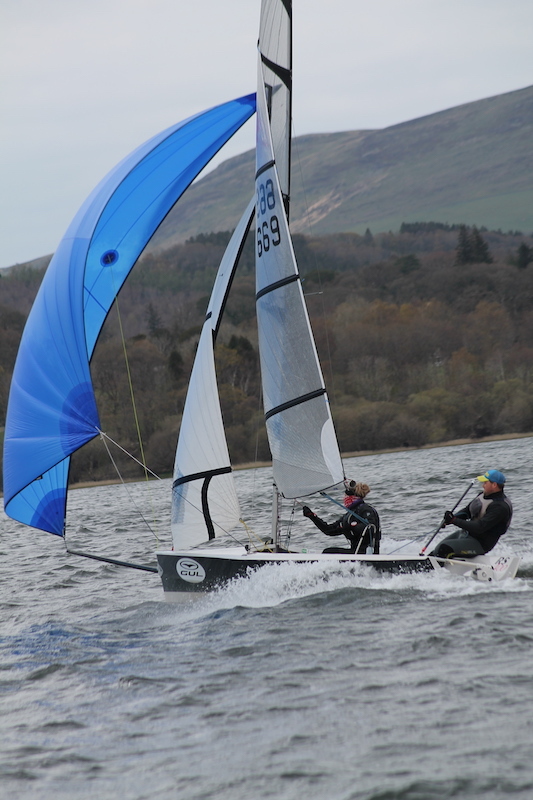 The afternoon winds held, and there were some good reaches to be enjoyed. 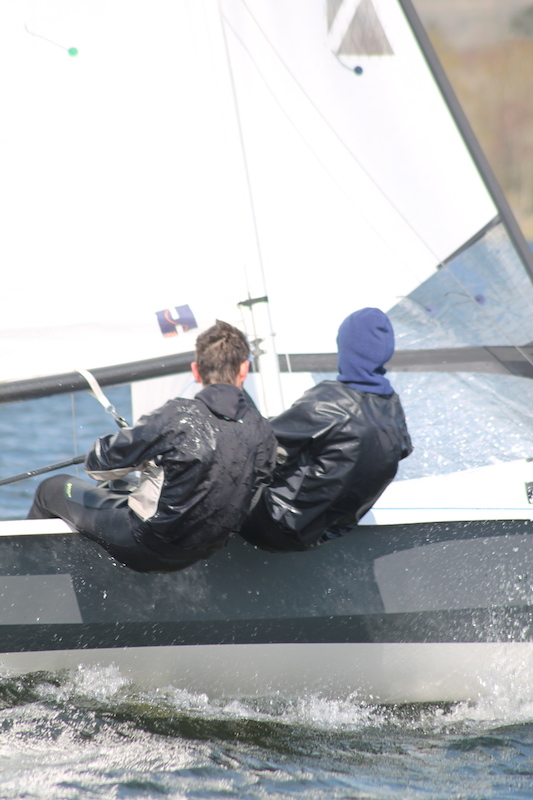 A great way to finish the long weekend. 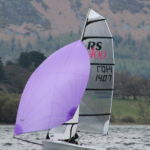 Some consistent sailing in the other fleets had wins in both races for Hugh in the Handicap fleet, Dave/Lynn in the GPs, and Andy/Lily in the Slow Handicap, and they all won their series trophies. 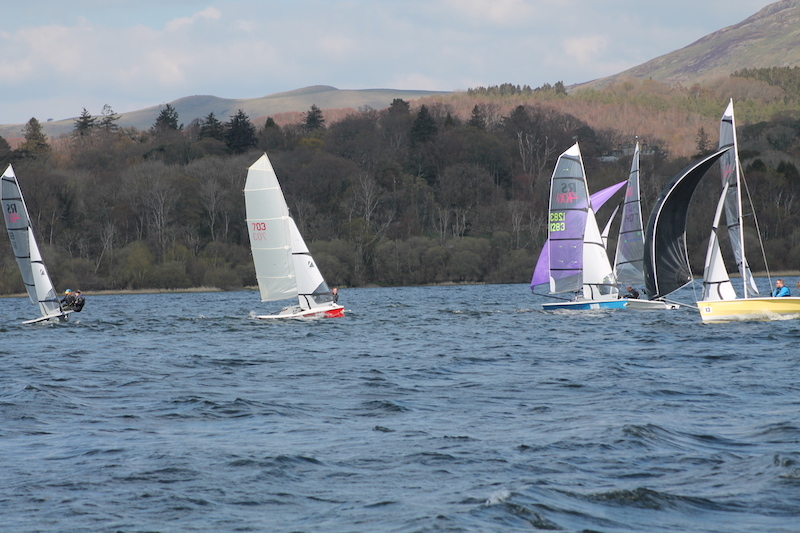 Don’t forget that Thursday evening Night Jar series starts this week at 19:15 on 25th April. 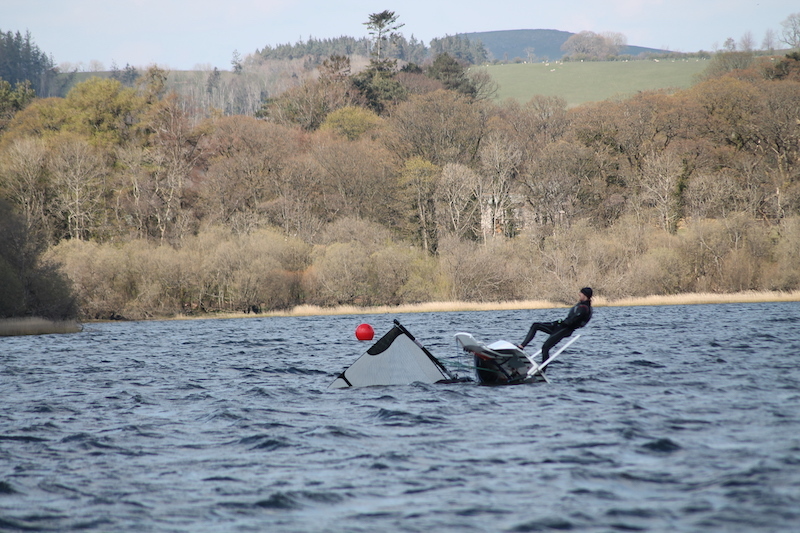 Catering will be available as usual. 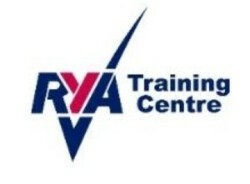 If you’re able to cater one evening please contact Alan Jones. 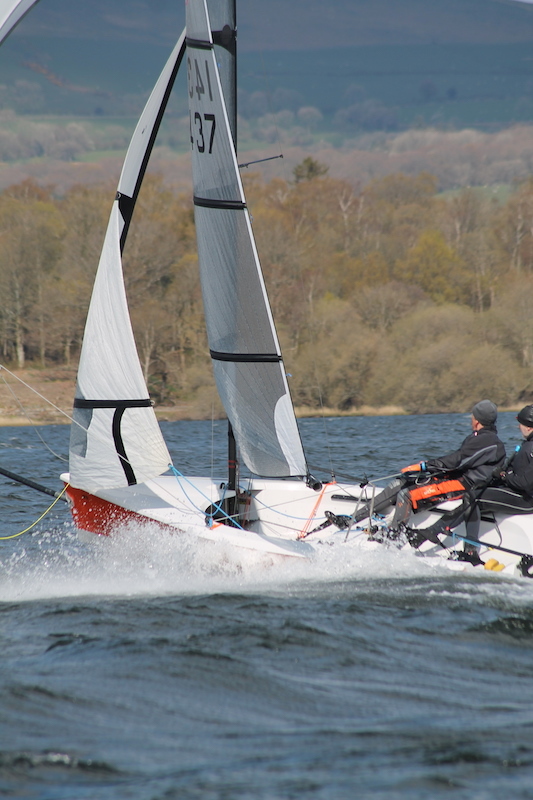 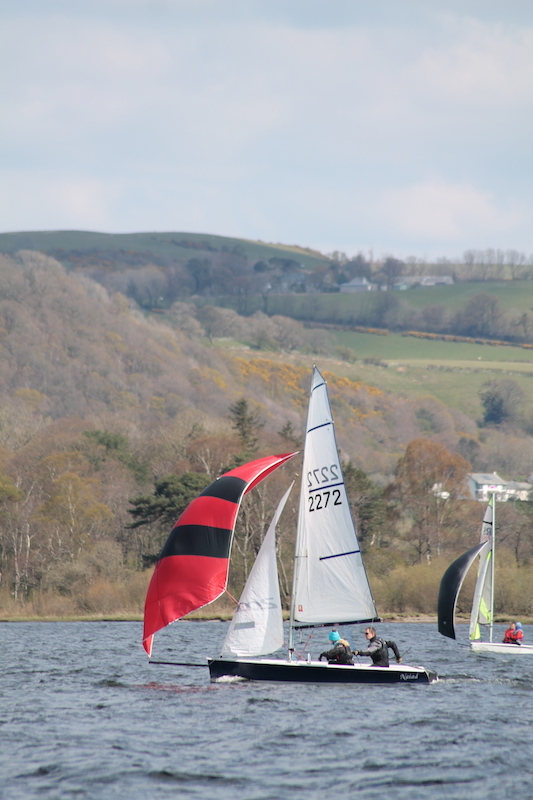 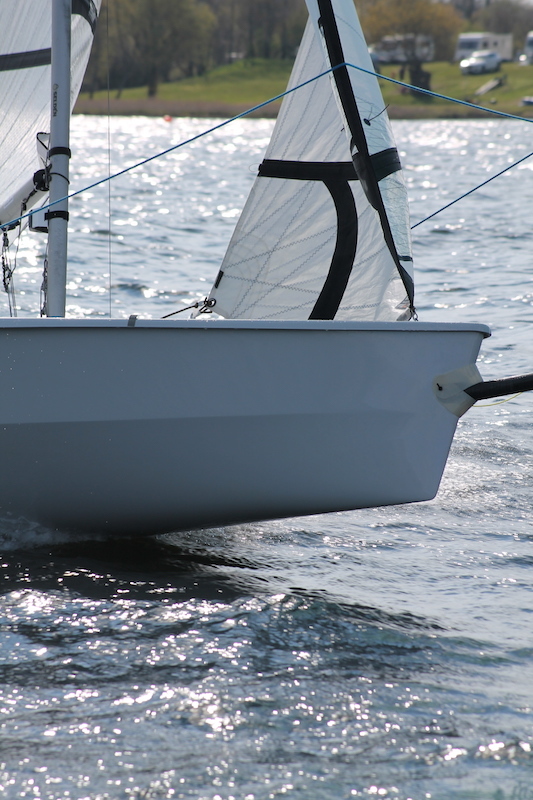 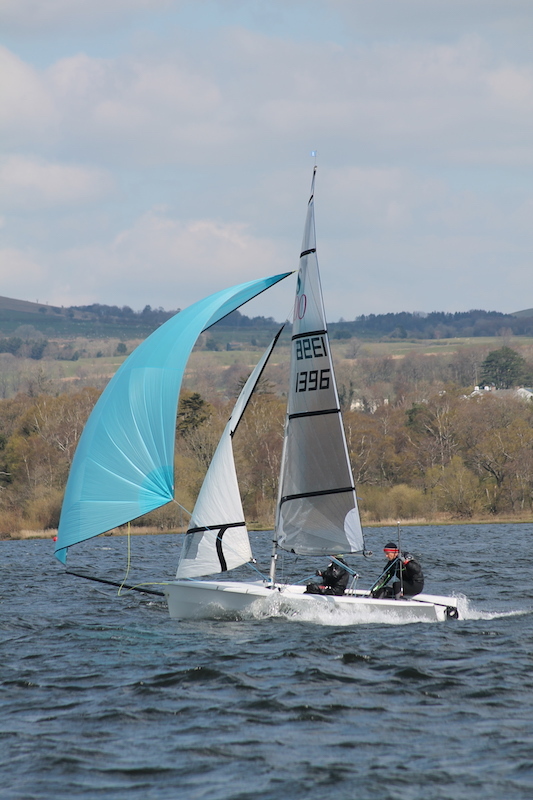 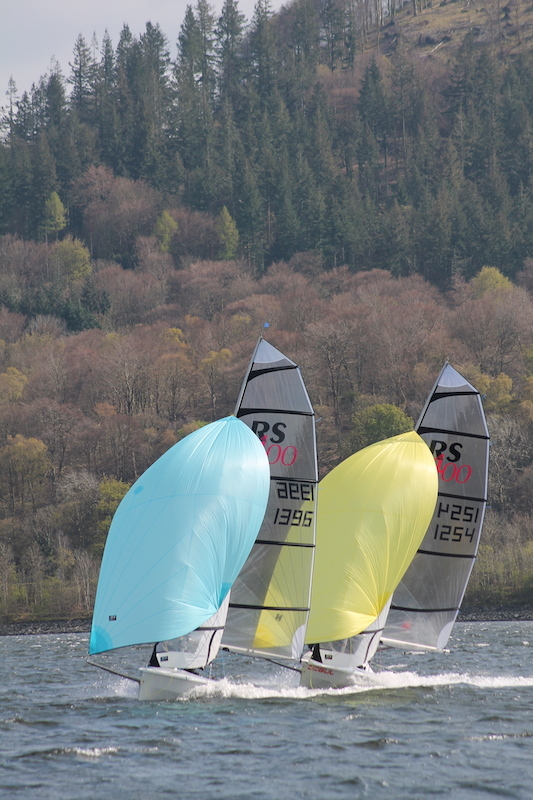 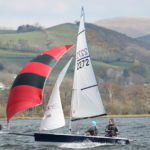 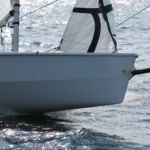 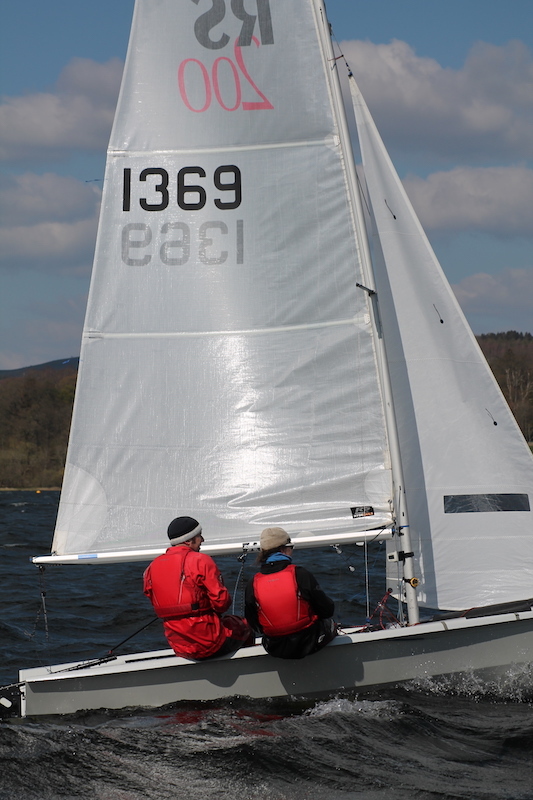 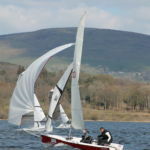 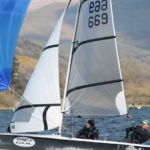 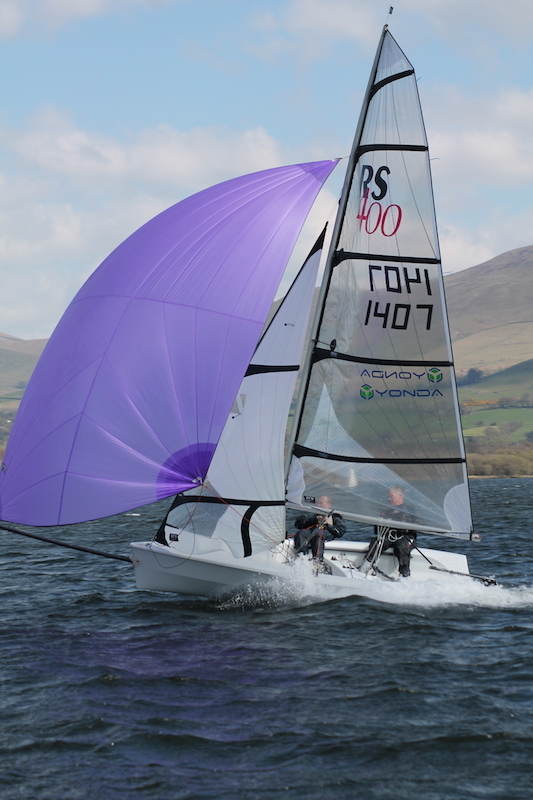 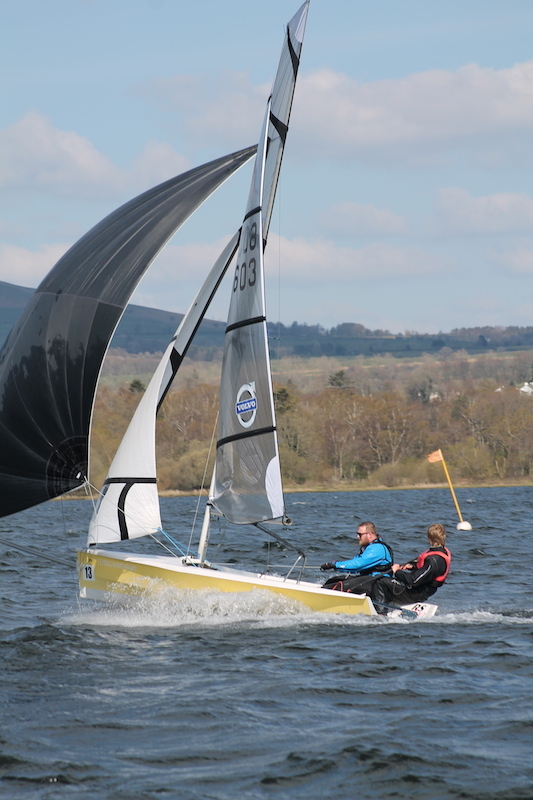 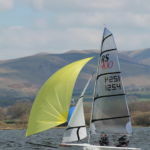 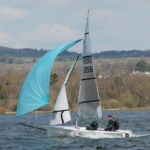 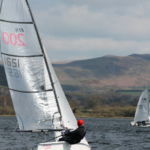 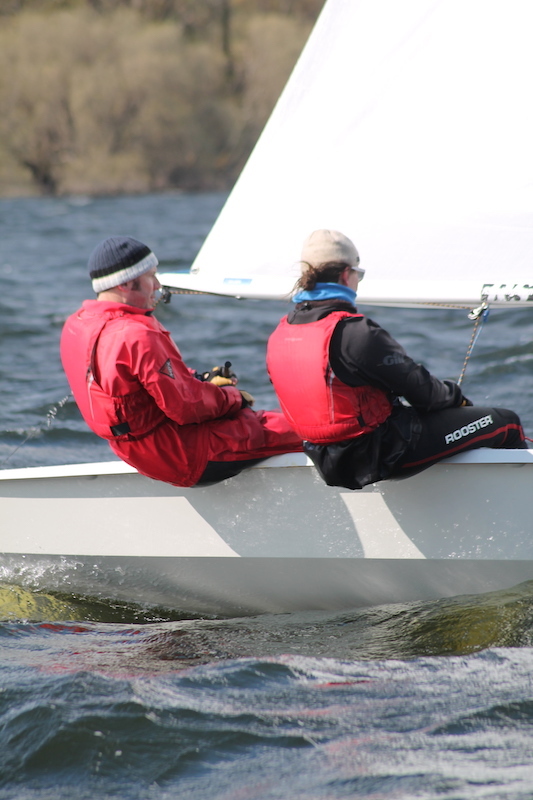 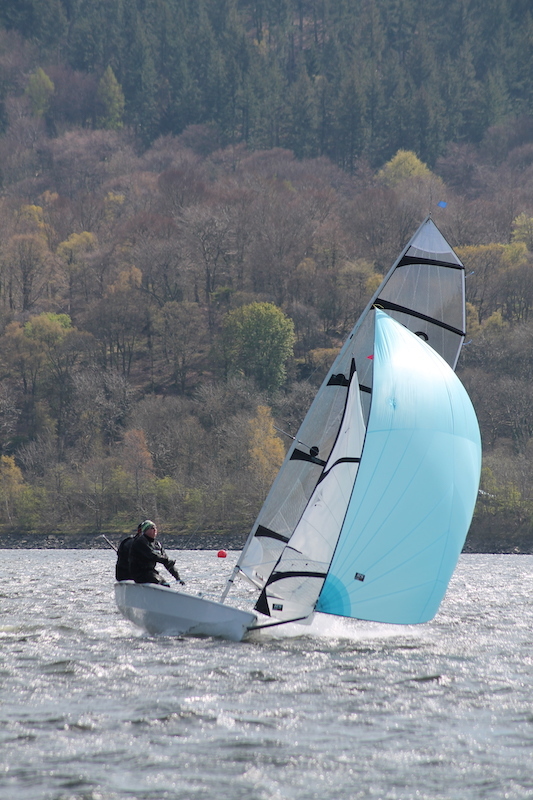 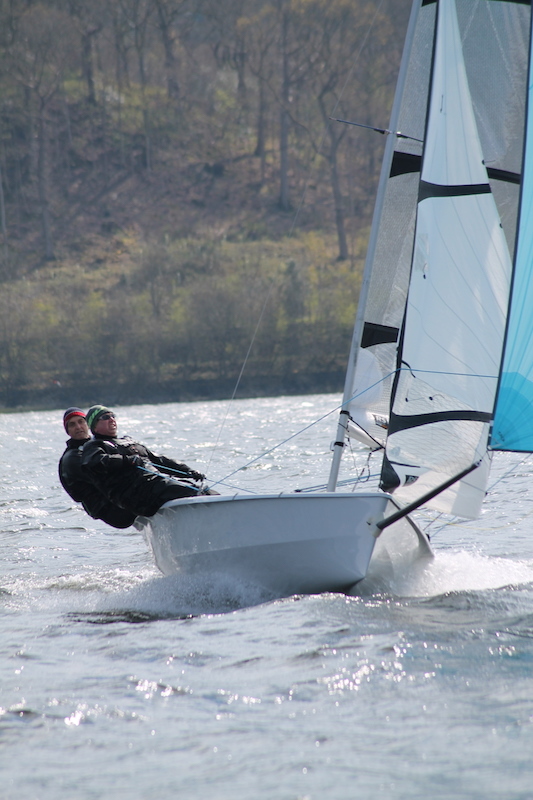 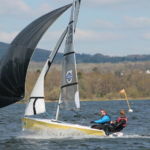 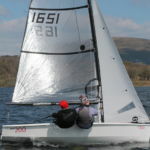 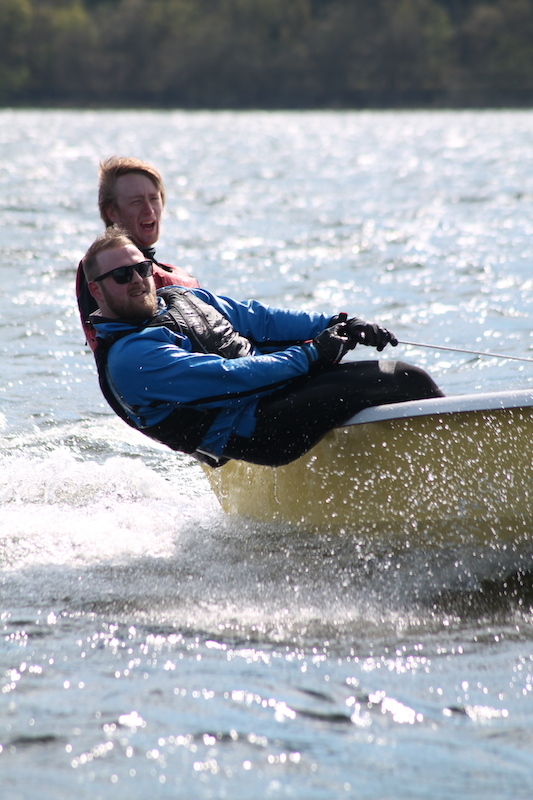 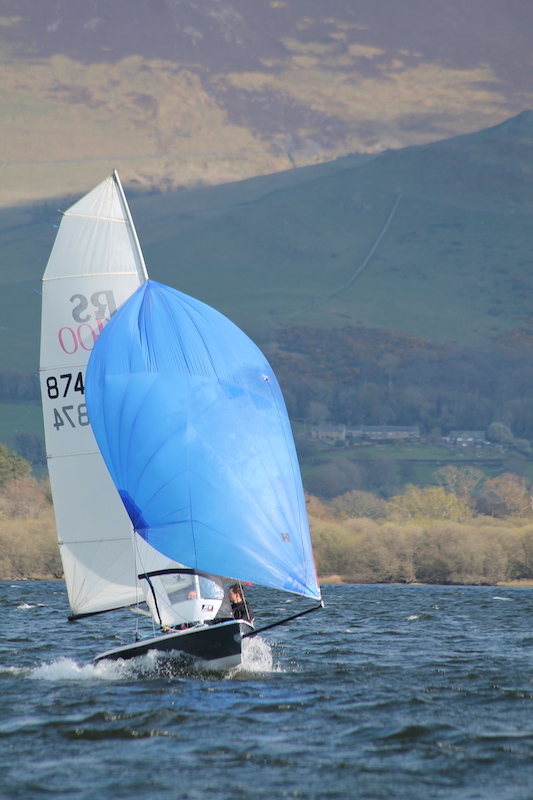 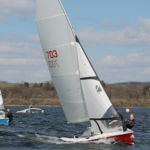 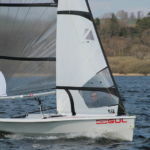 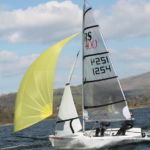 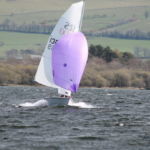 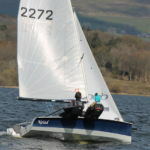 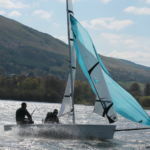 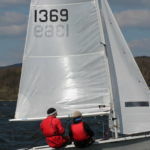 The 2019 sailing season is upon us, and will start 1130am this Sunday 31st March. 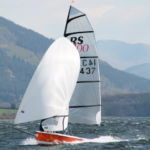 Why not pop along on Saturday, give a helping hand with some final preparations, and then greet and get to know some of our newer members in the afternoon? 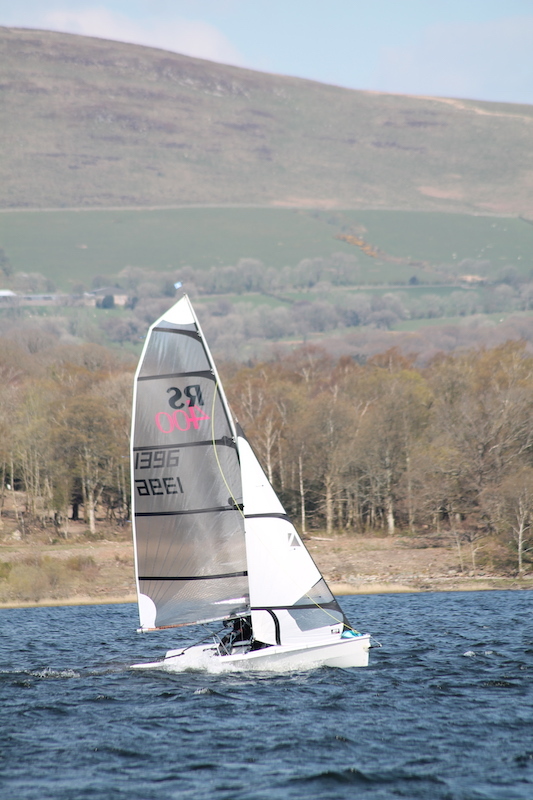 Don’t forget that with British Summer Time starting on Sunday the clocks will go forward one hour, so the first race is sooner than you may have realised! 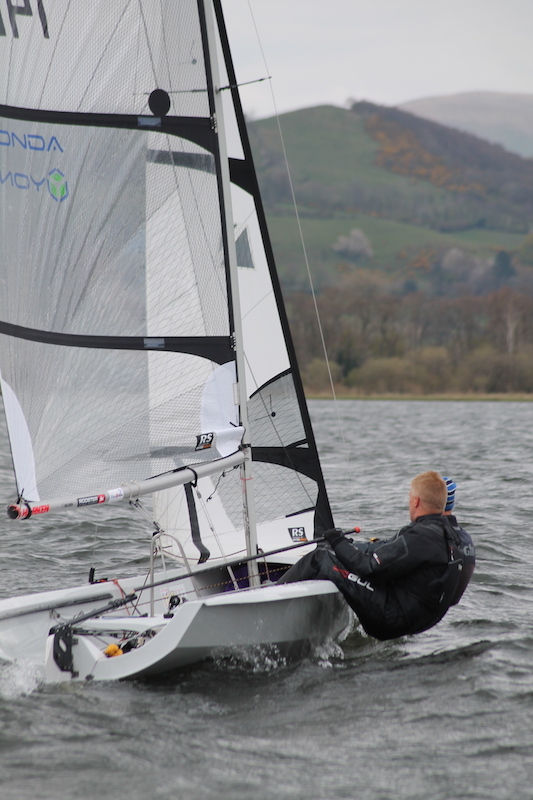 Congratulations to Phil Hodgkins and Sarah Wilkinson following their wedding at the weekend. 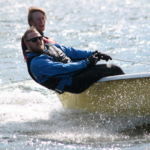 Frankie Mensah is a Producer at Boundless Productions who are making a second series of the BBC Two Show Love in The Countryside. 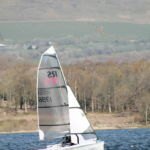 They’re looking for town and city dwellers who want to leave behind the rat race, find love and share a new life in the countryside. 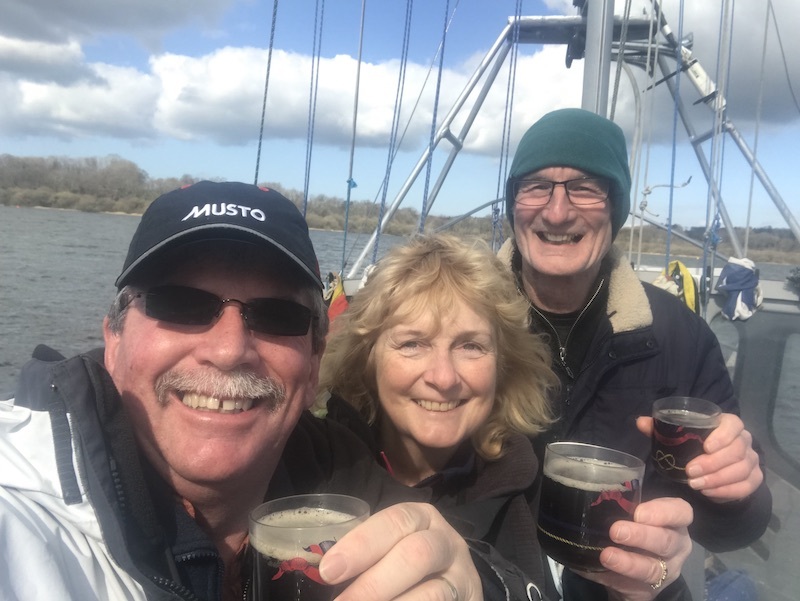 They have a lovely lady who enjoys outdoor pursuits and Are looking for some outgoing active men in their late 50’s early 60’s who might be interested in dating her?